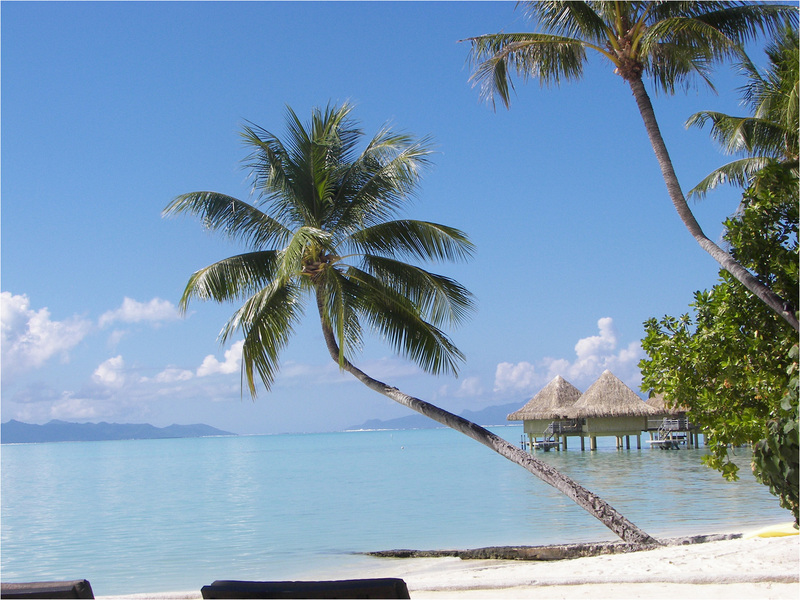 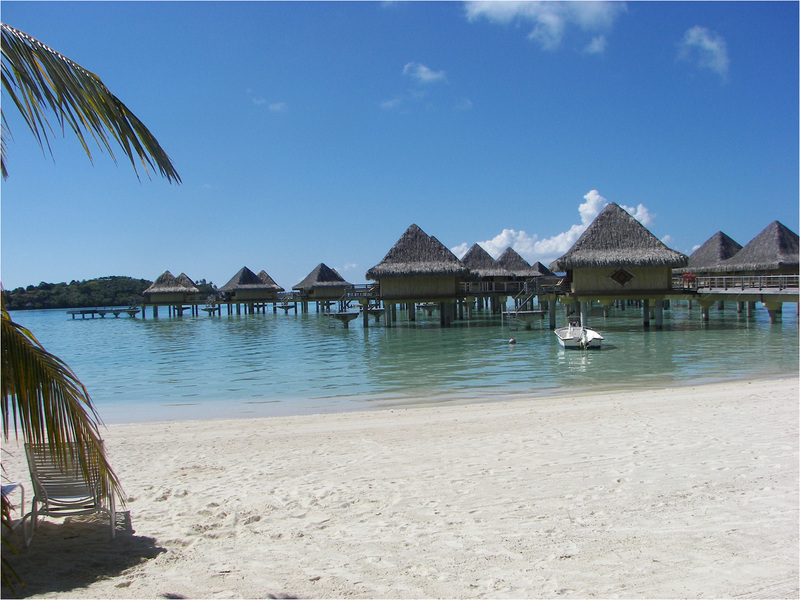 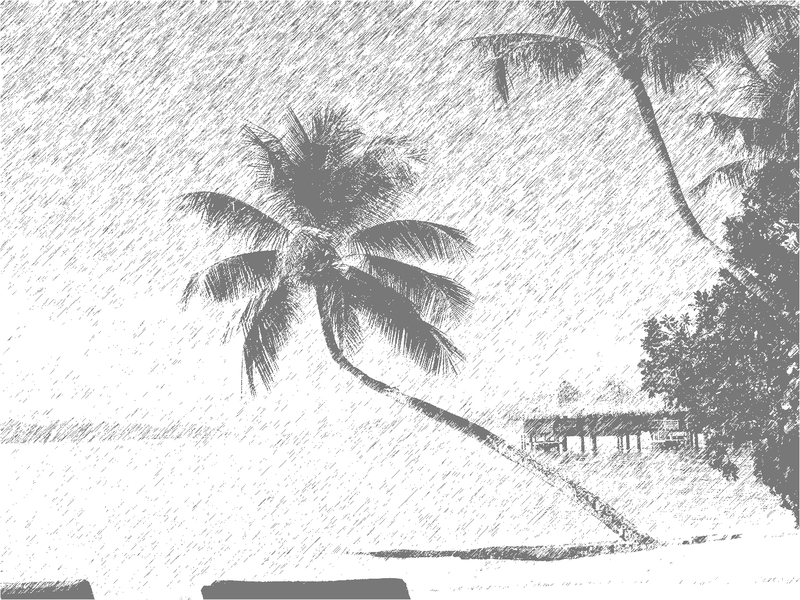 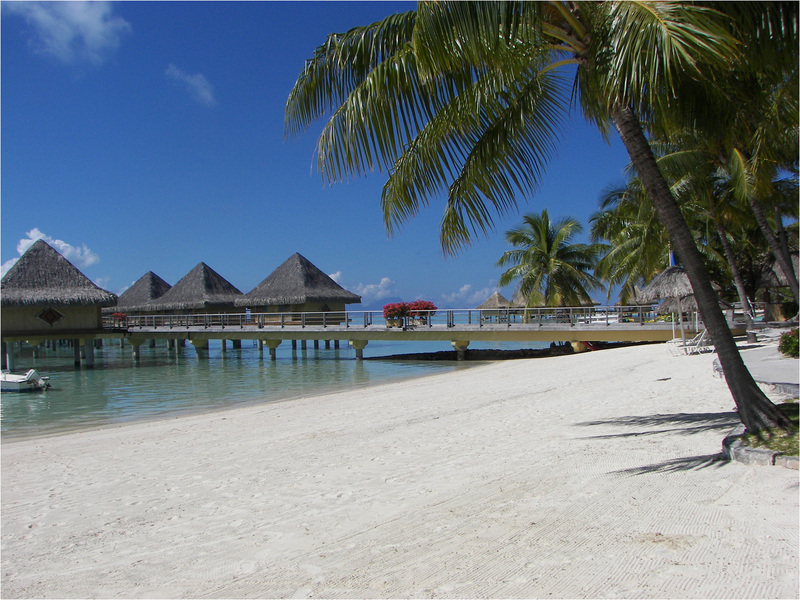 Nice view from the beach at the Intercontinental Bora Bora Le Moana Resort. 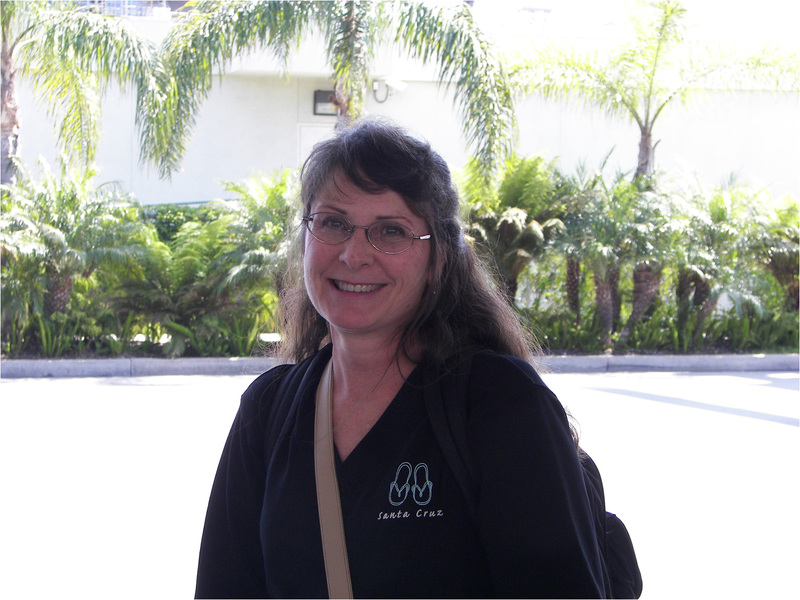 Kath outside LAX terminal @ start of trip. 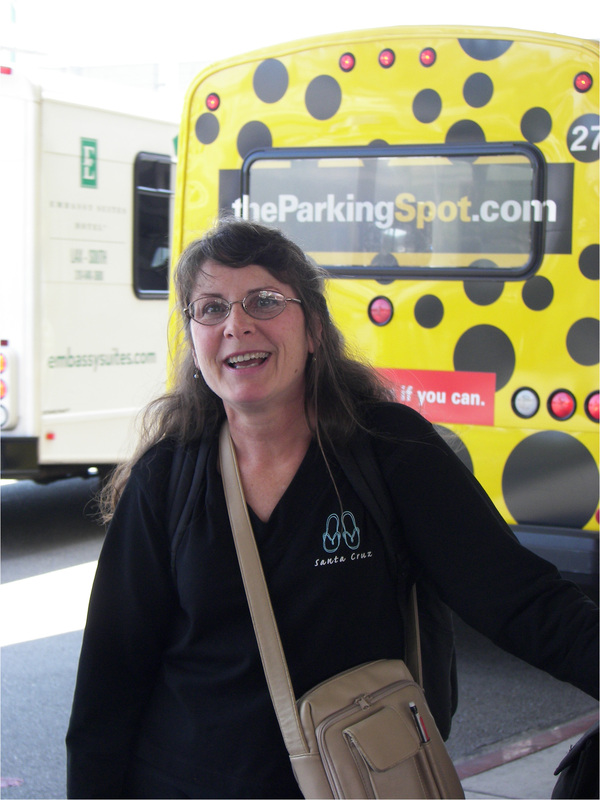 Kath outside LAX terminal @ start of trip waiting for shuttle to the hotel. 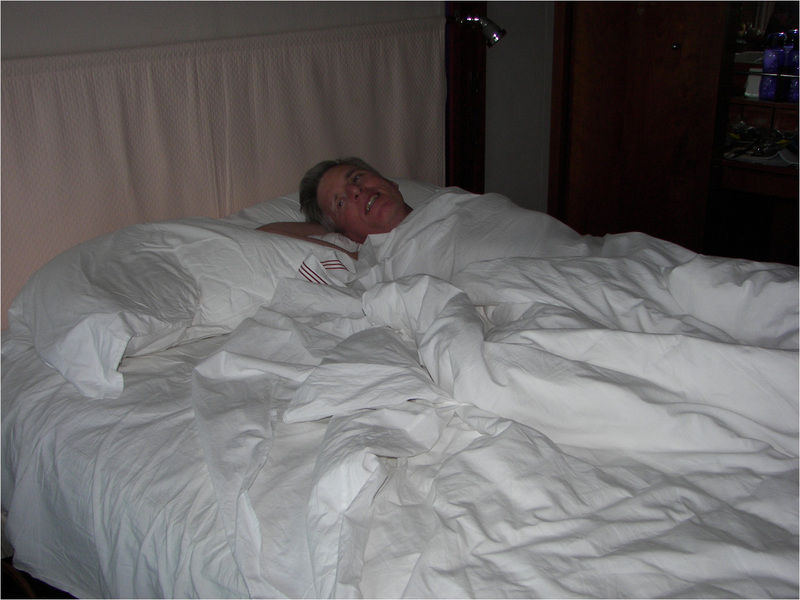 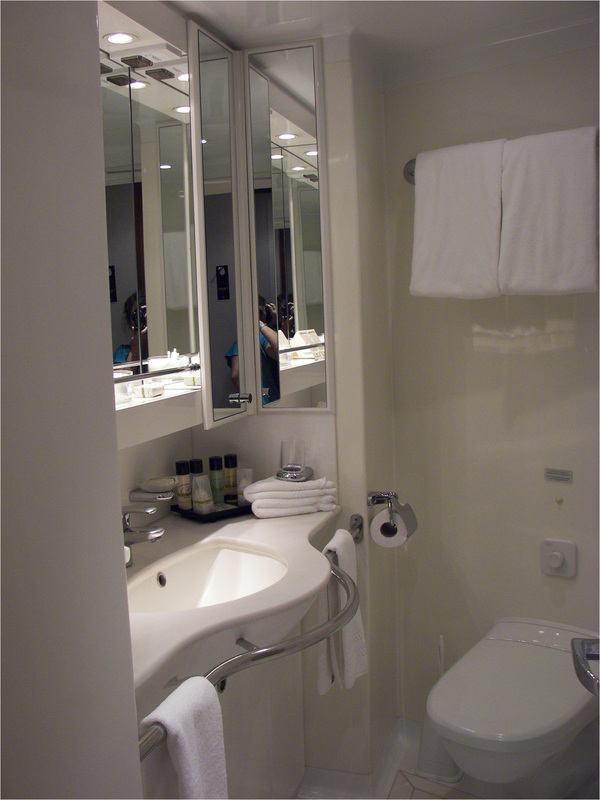 The stateeroom came with a very spacious bathroom, including a full size bathtub. 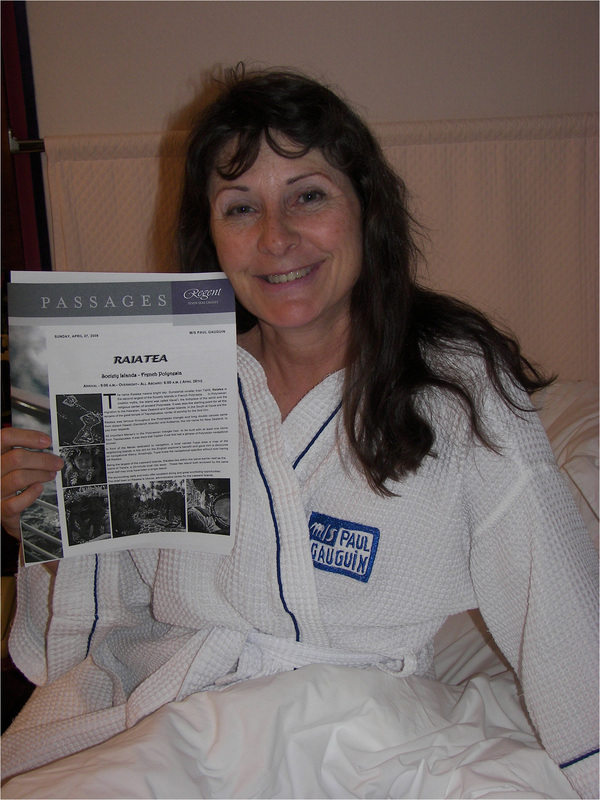 Just after 6AM ( pre-coffee) the first morning reading up on todays activities. 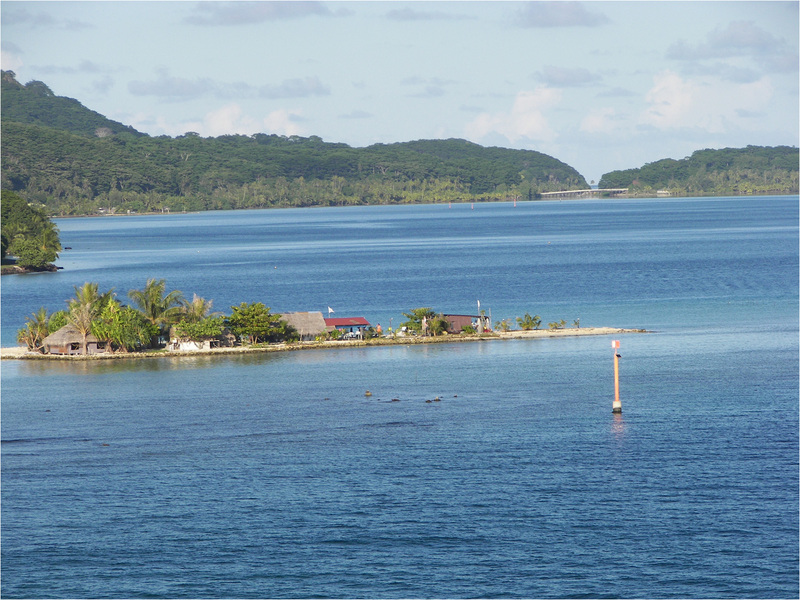 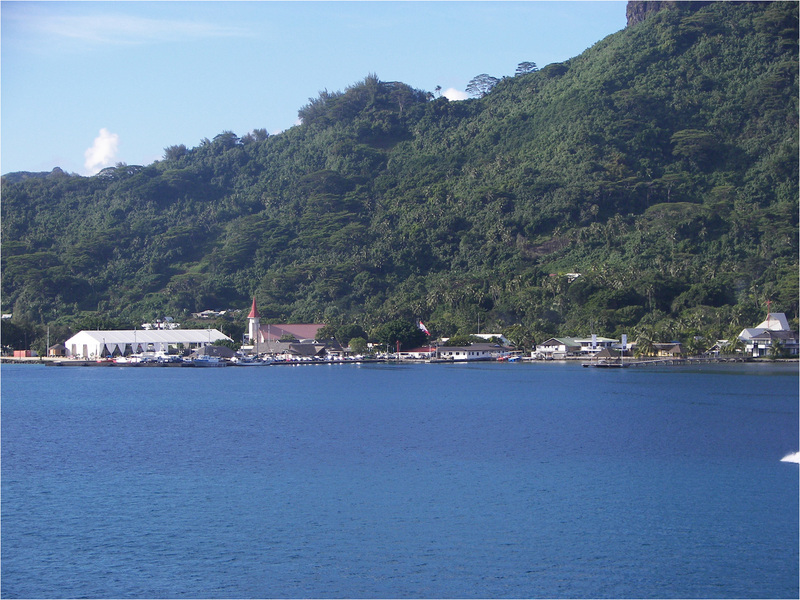 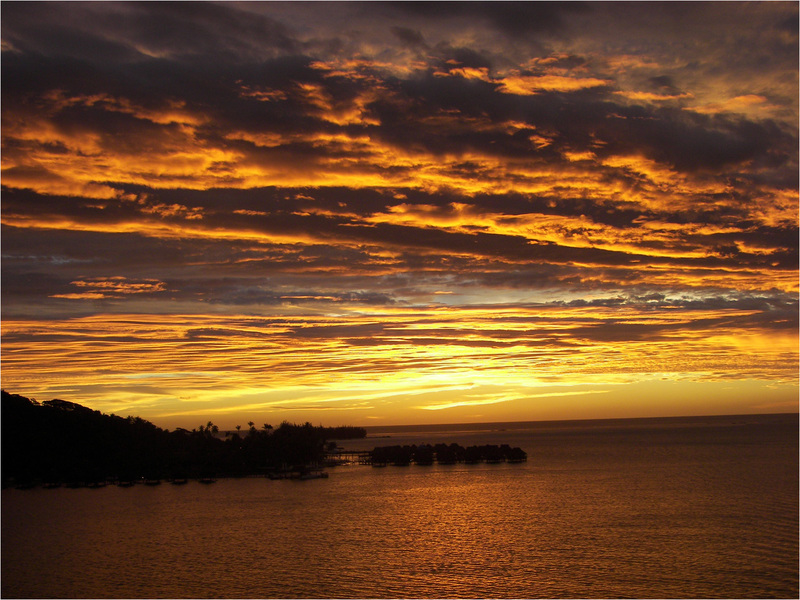 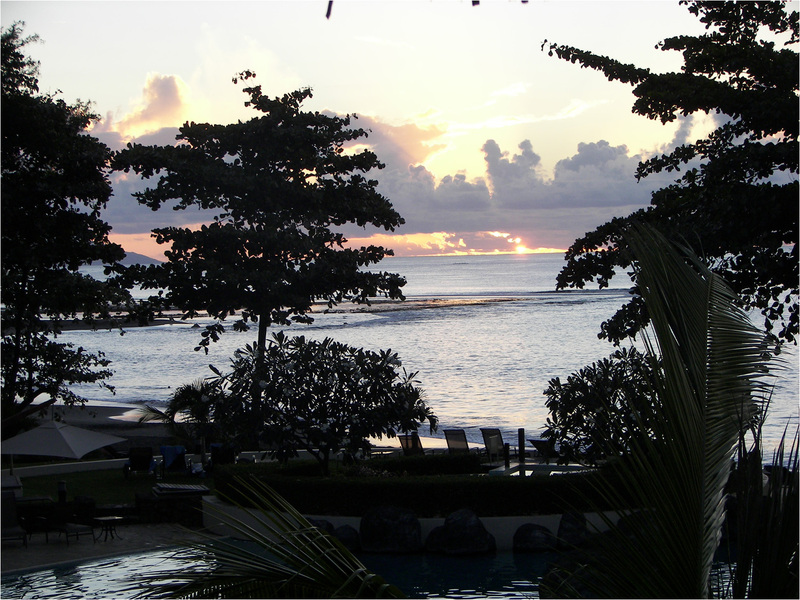 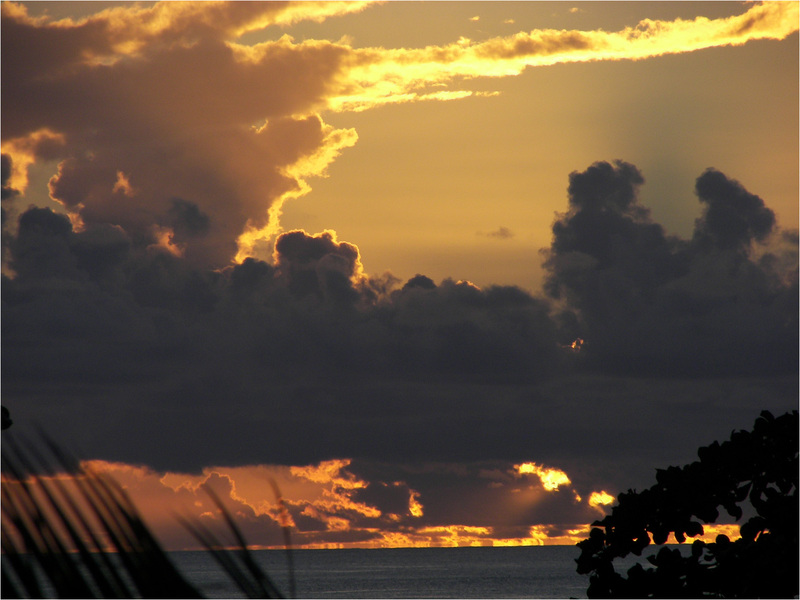 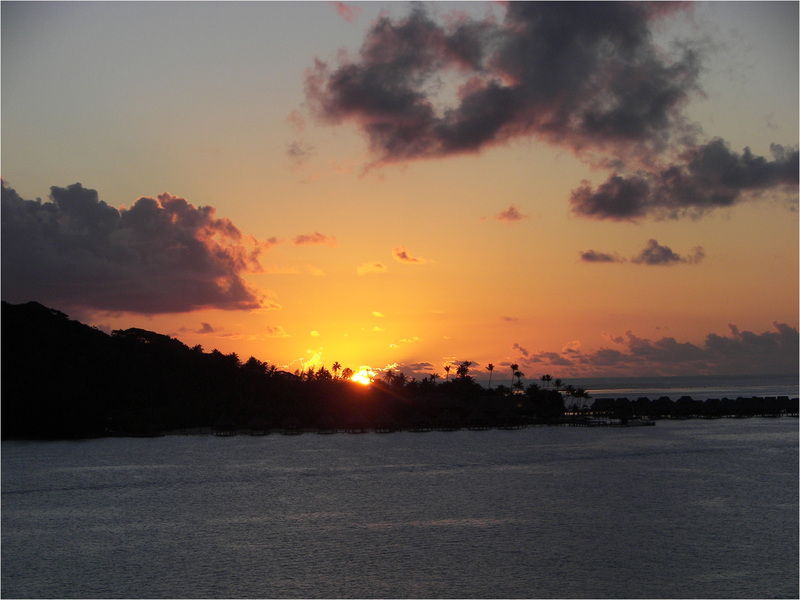 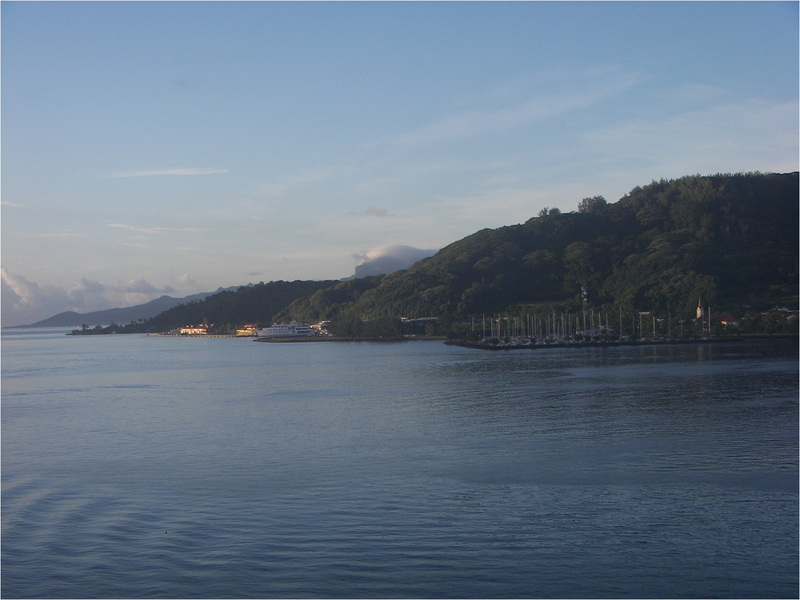 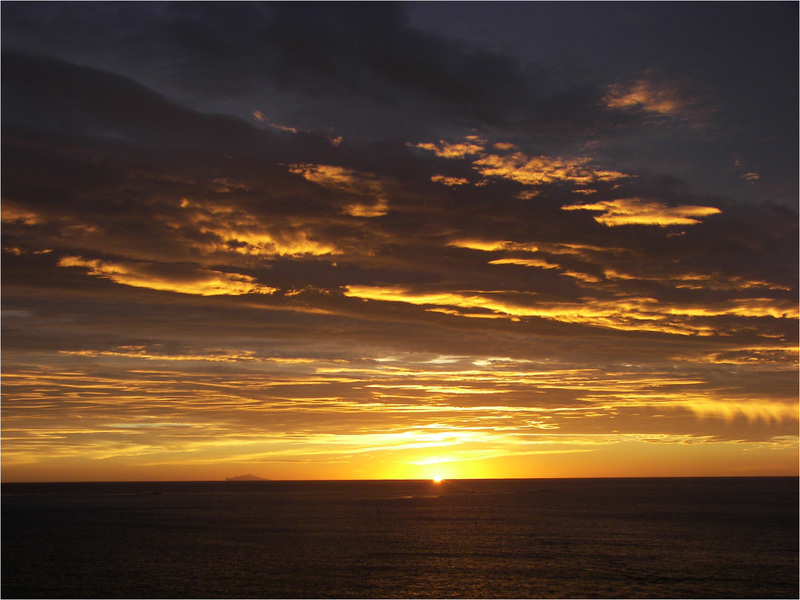 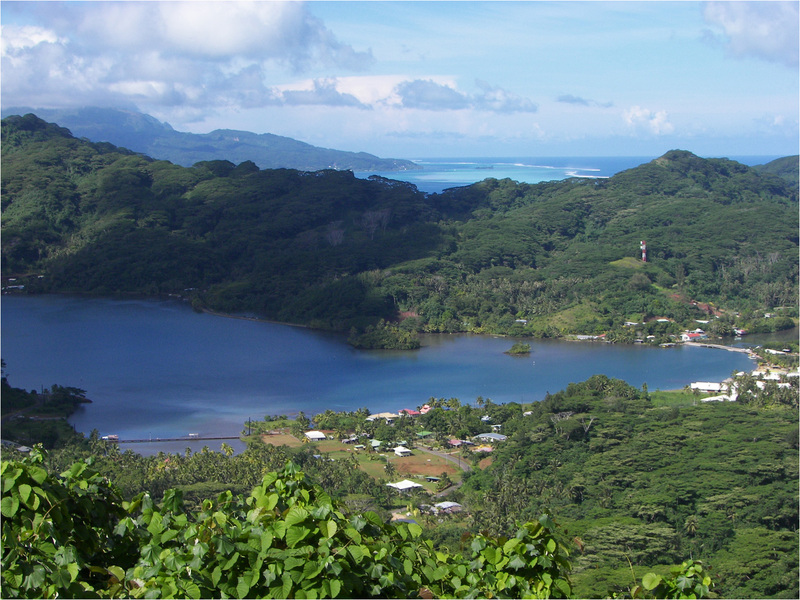 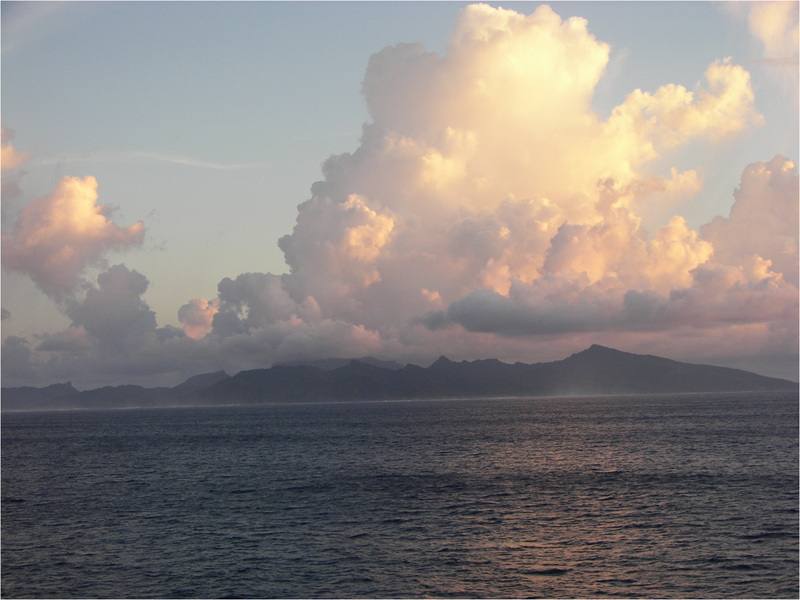 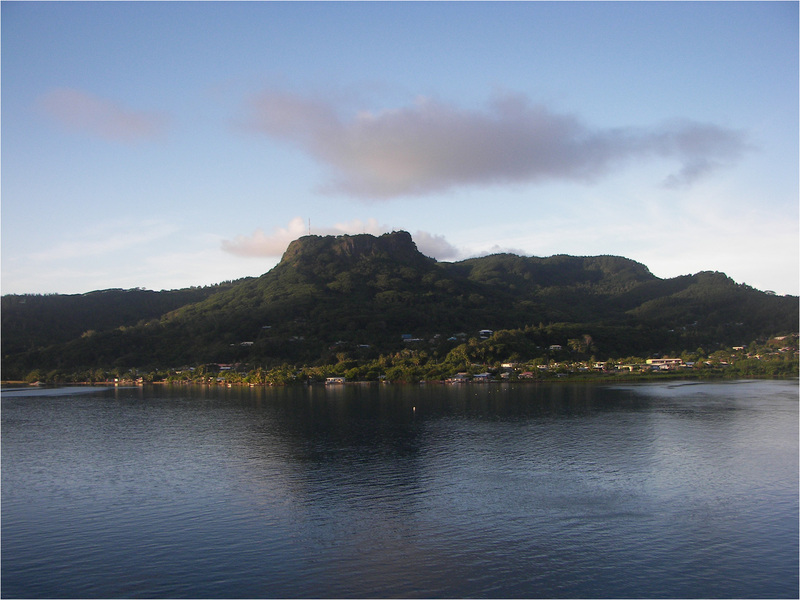 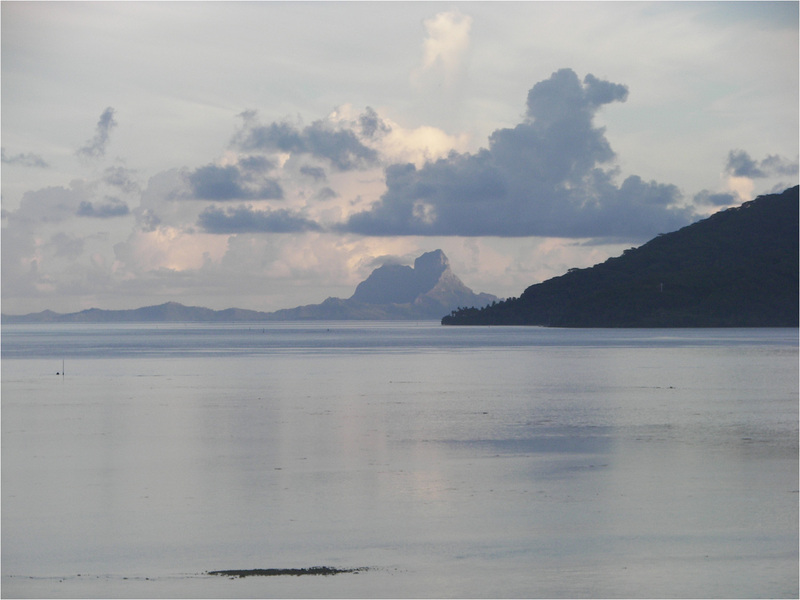 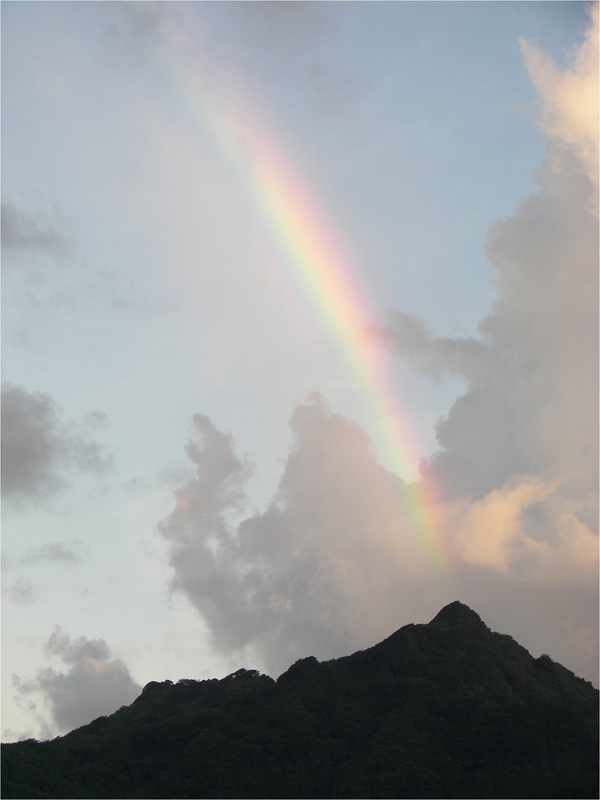 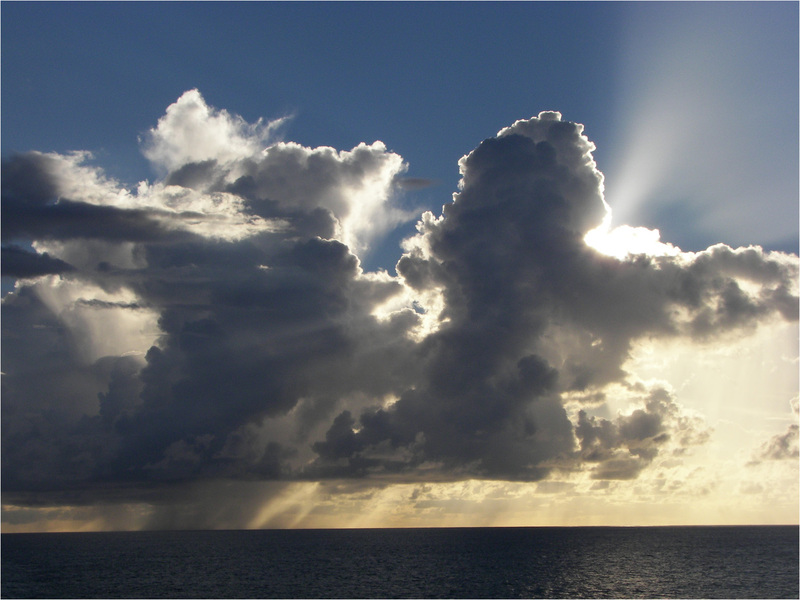 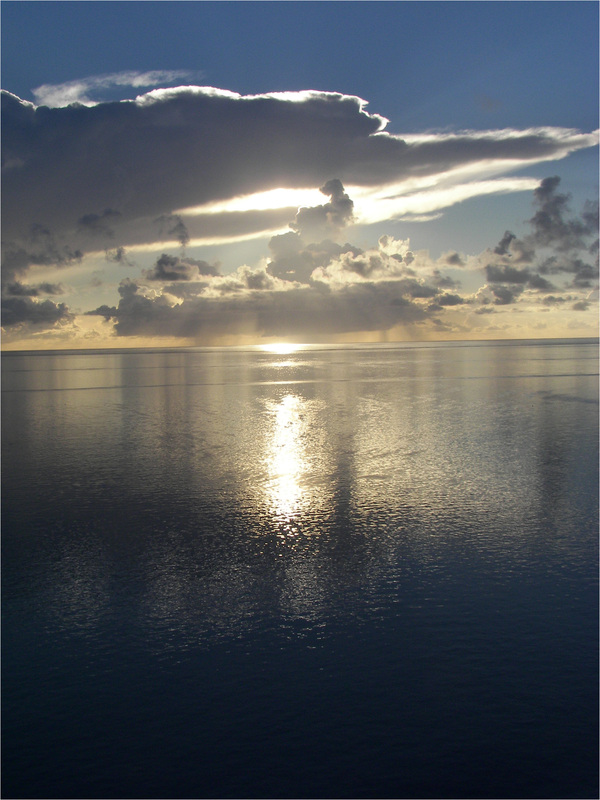 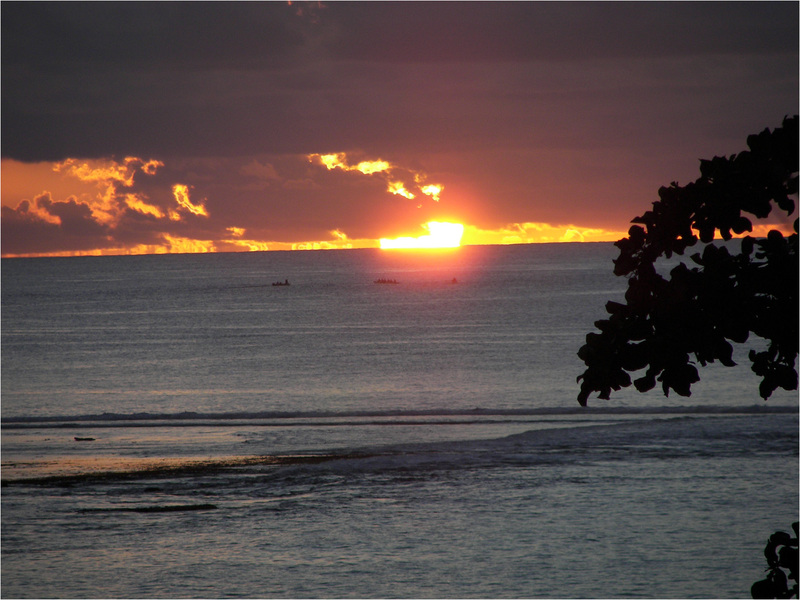 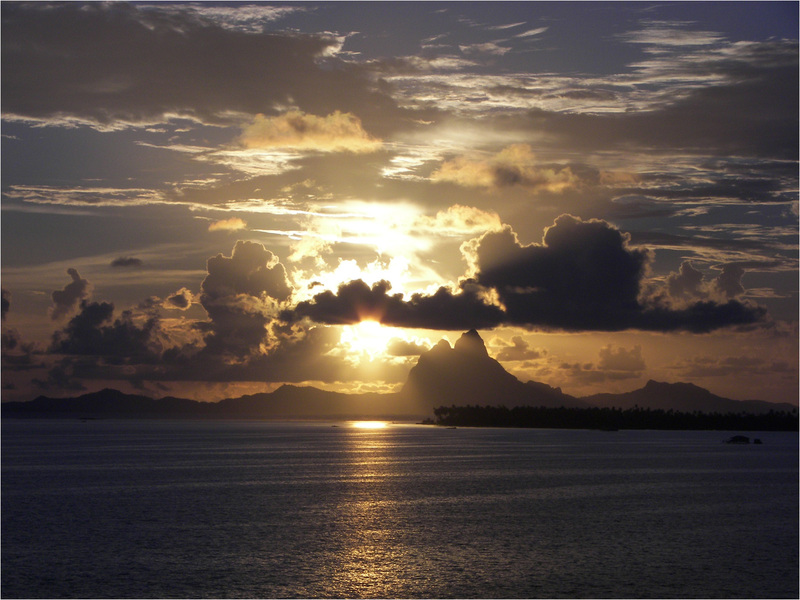 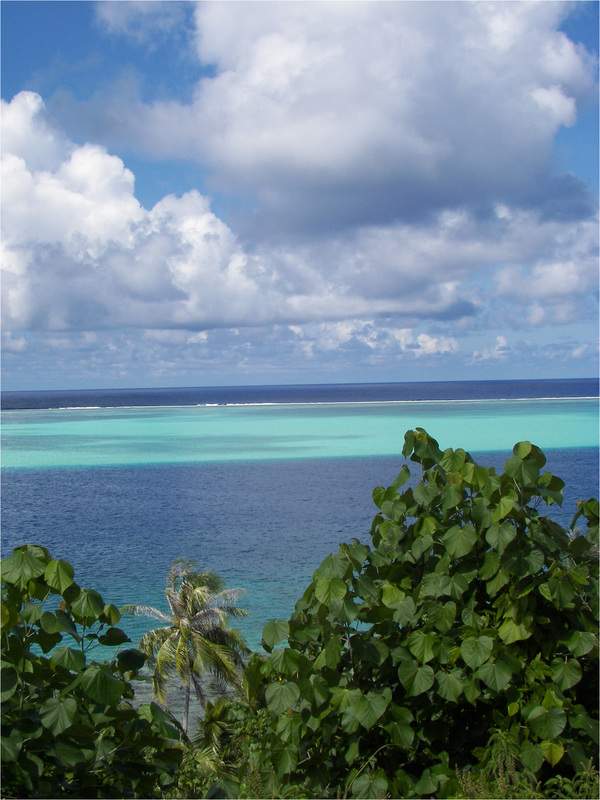 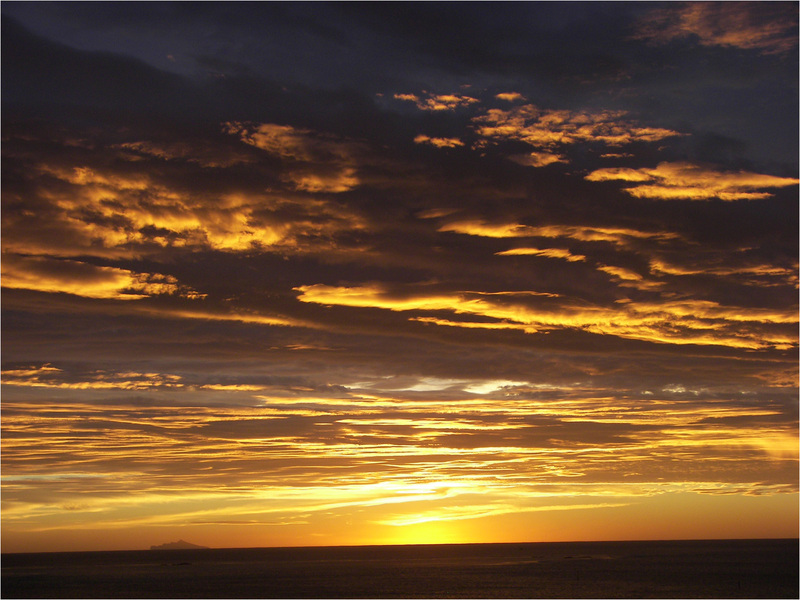 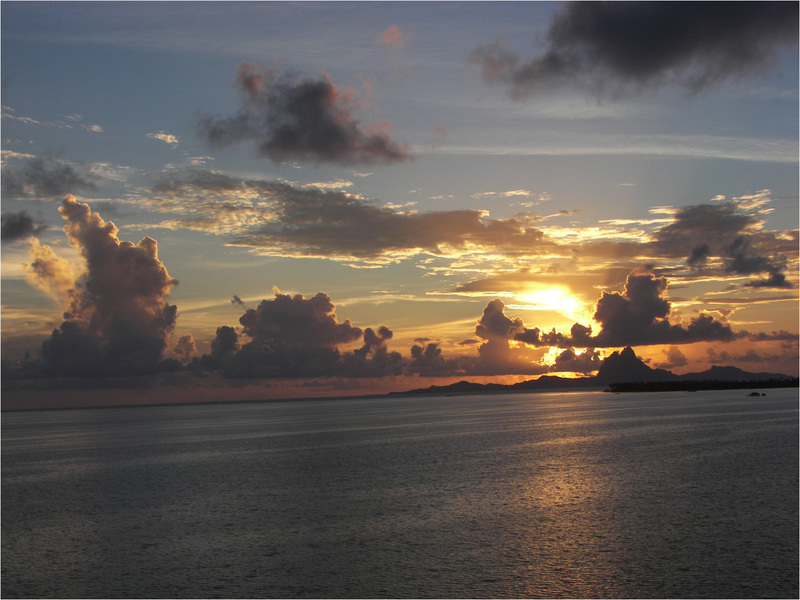 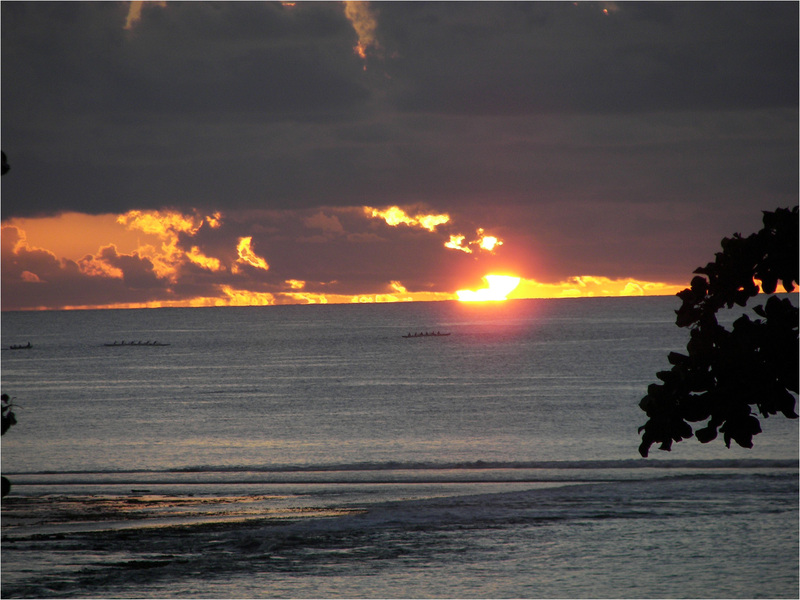 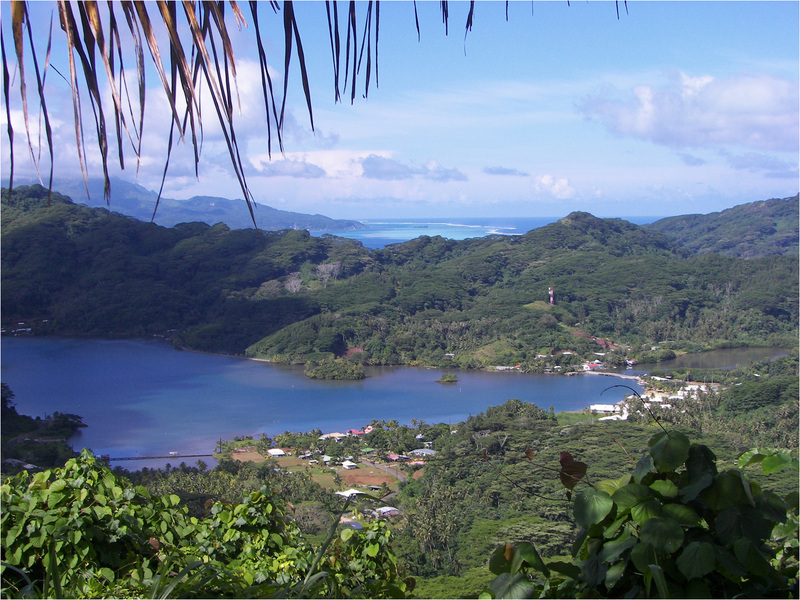 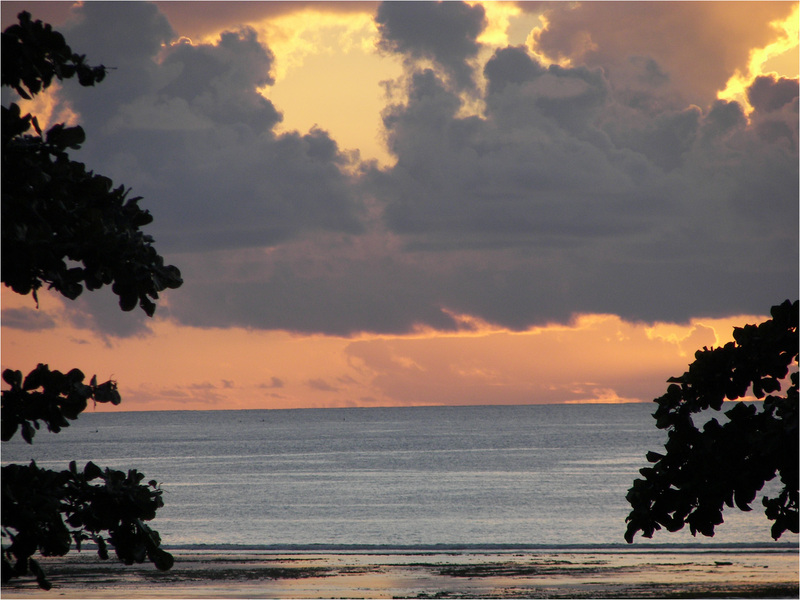 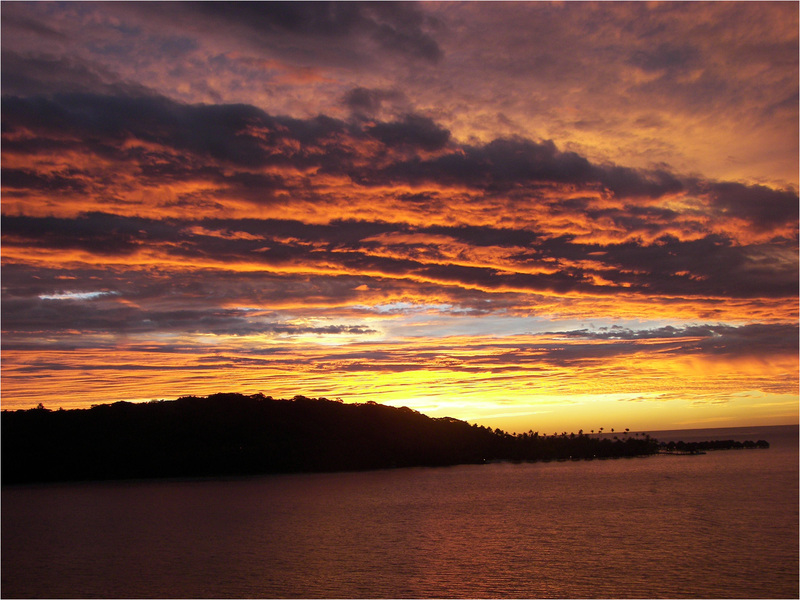 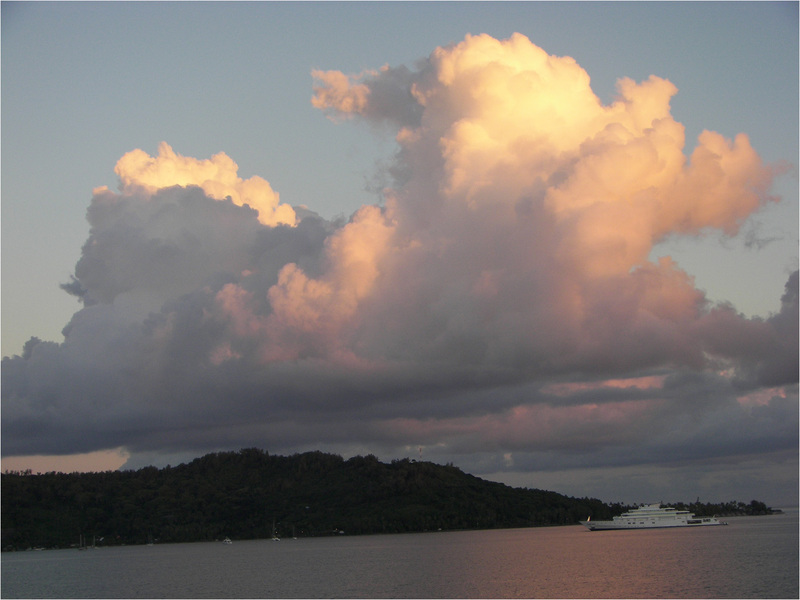 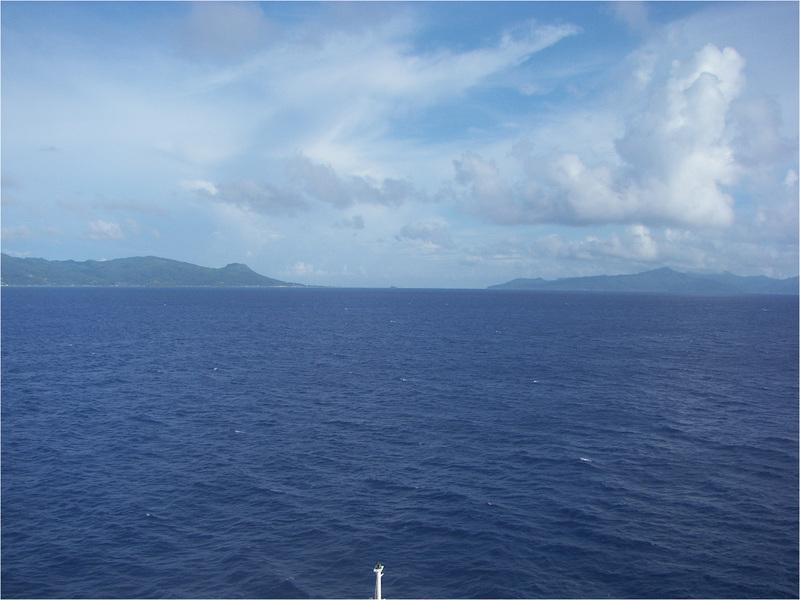 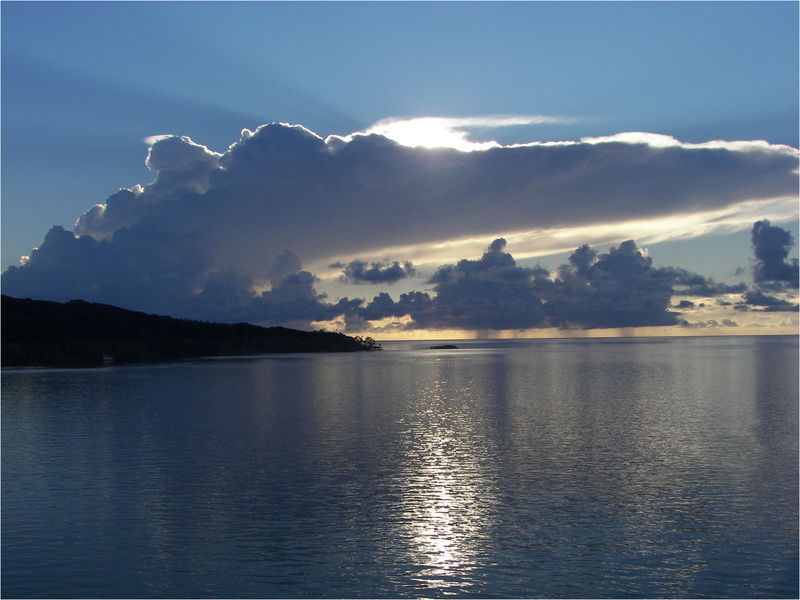 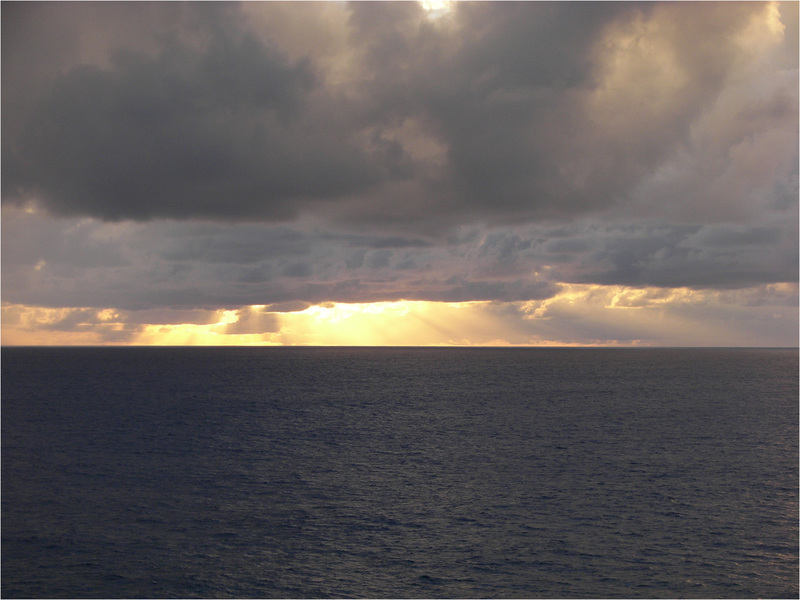 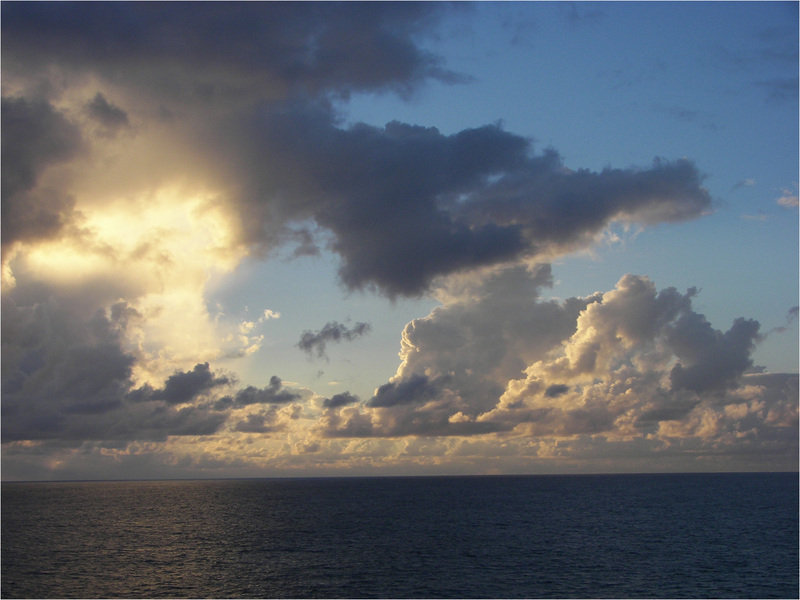 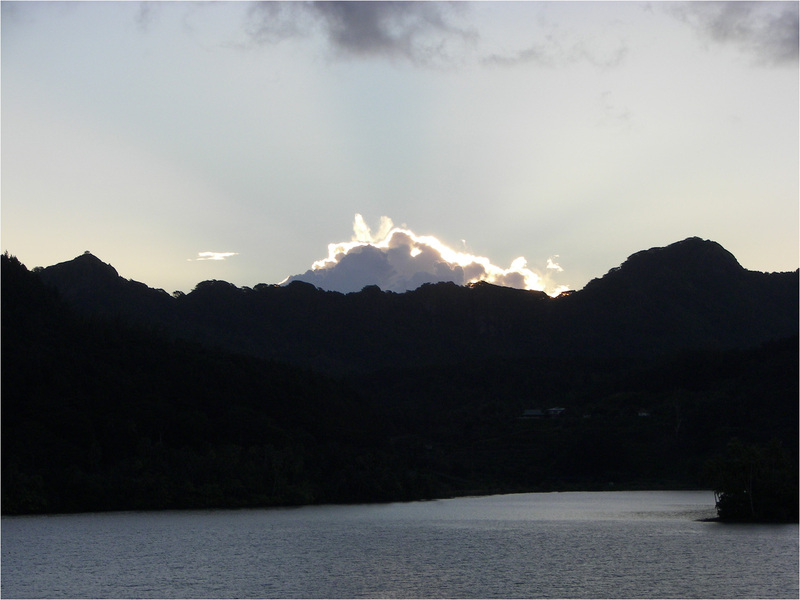 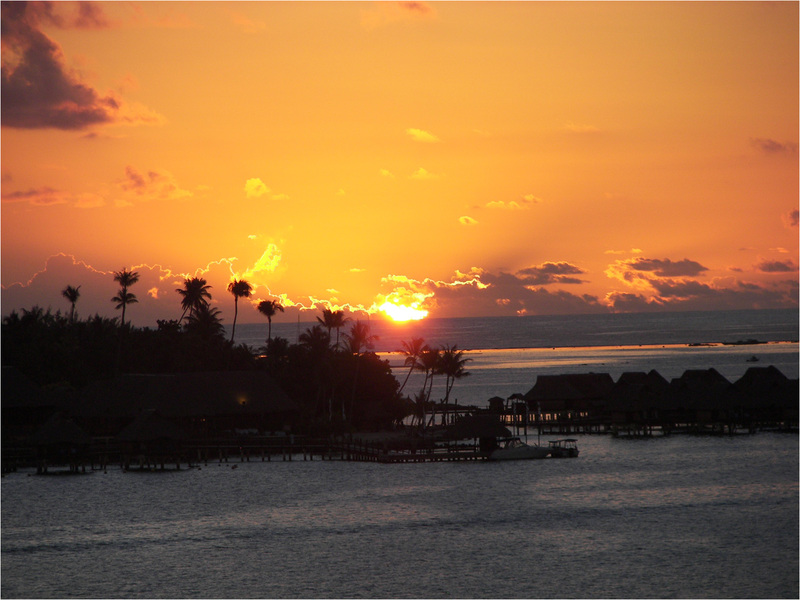 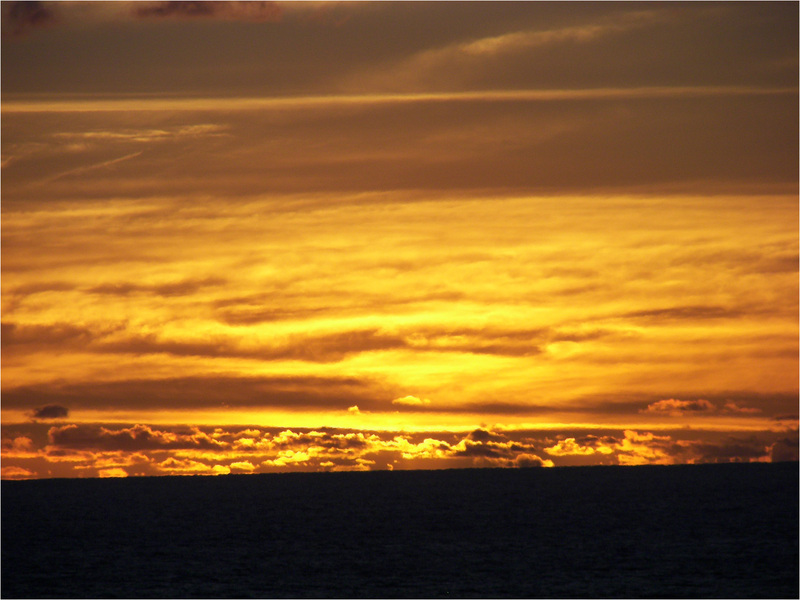 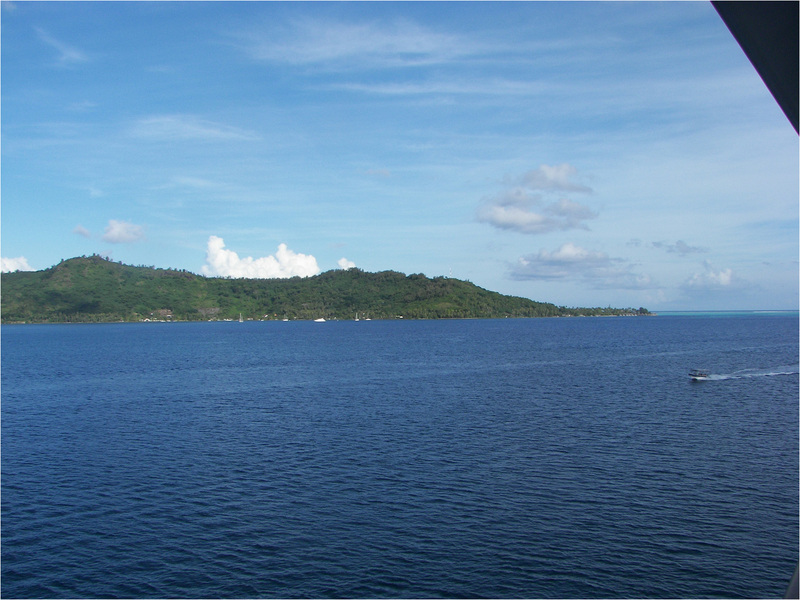 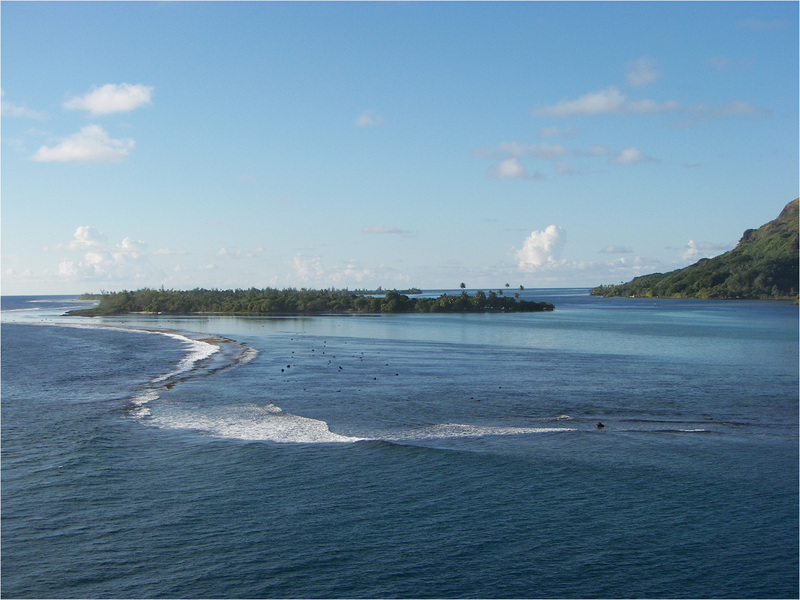 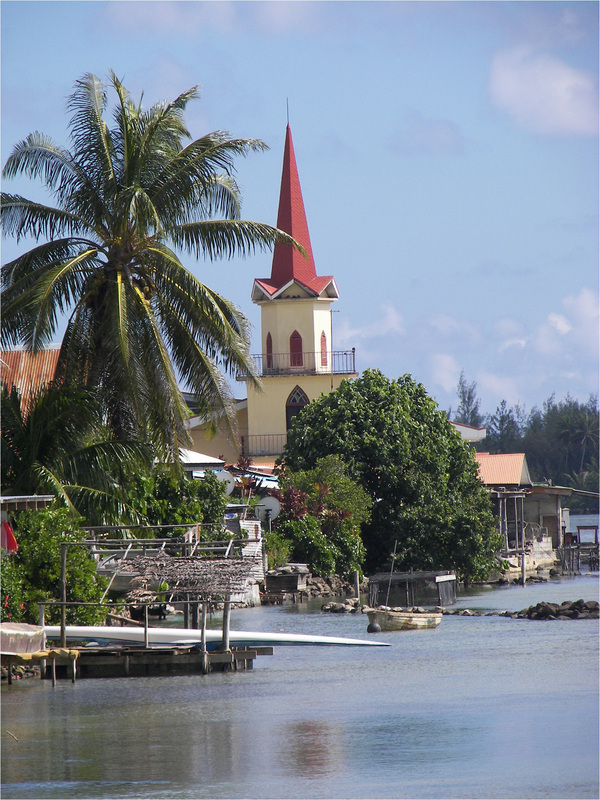 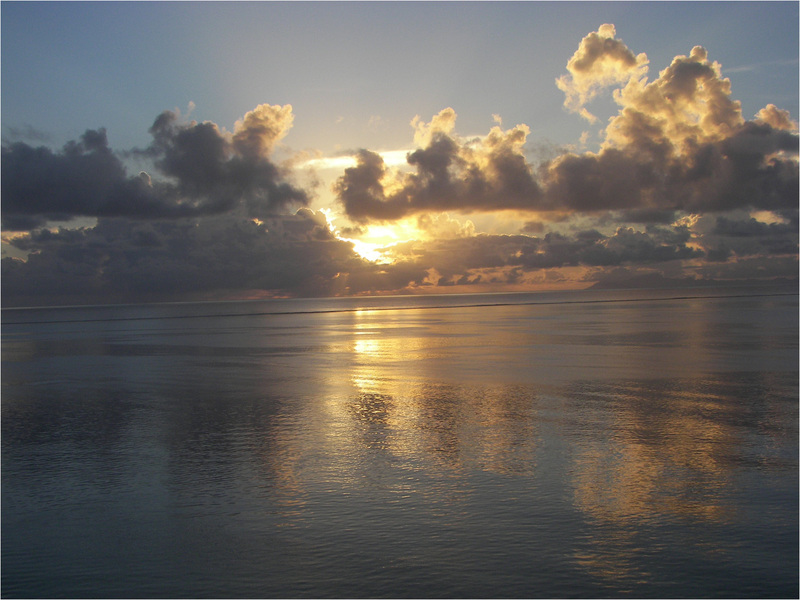 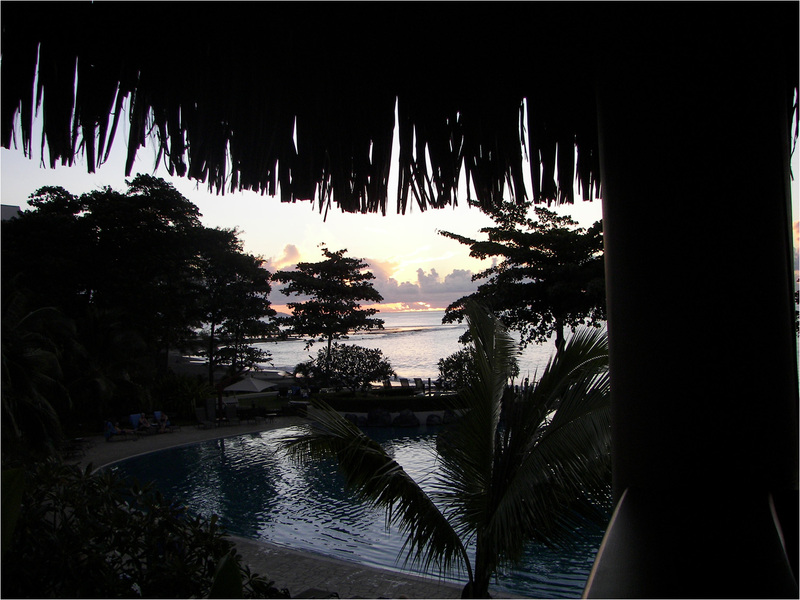 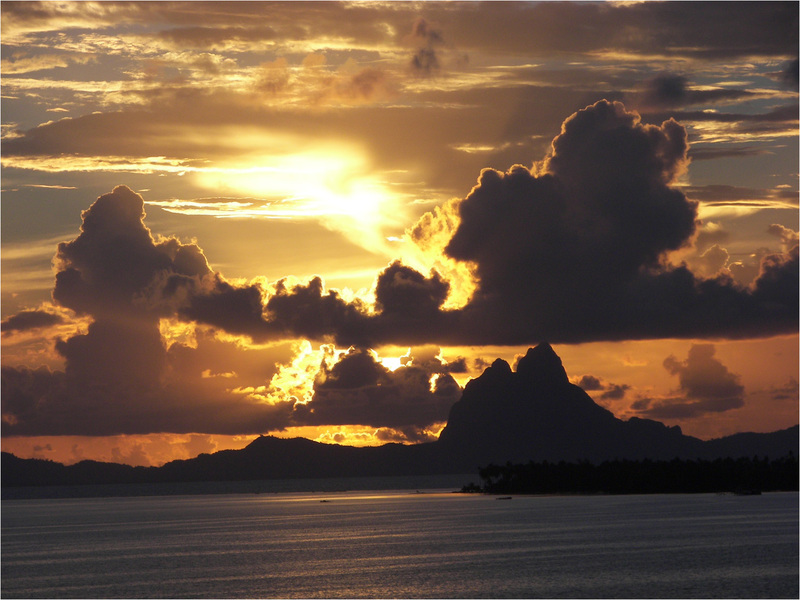 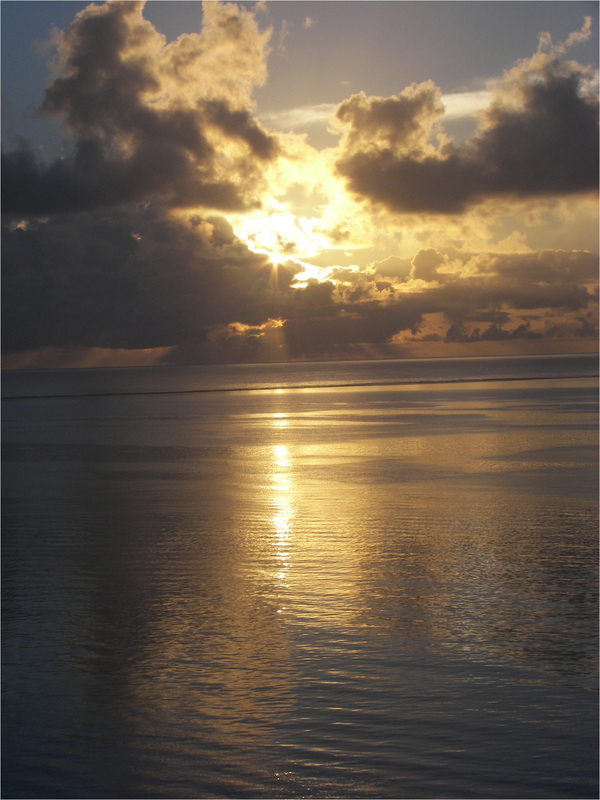 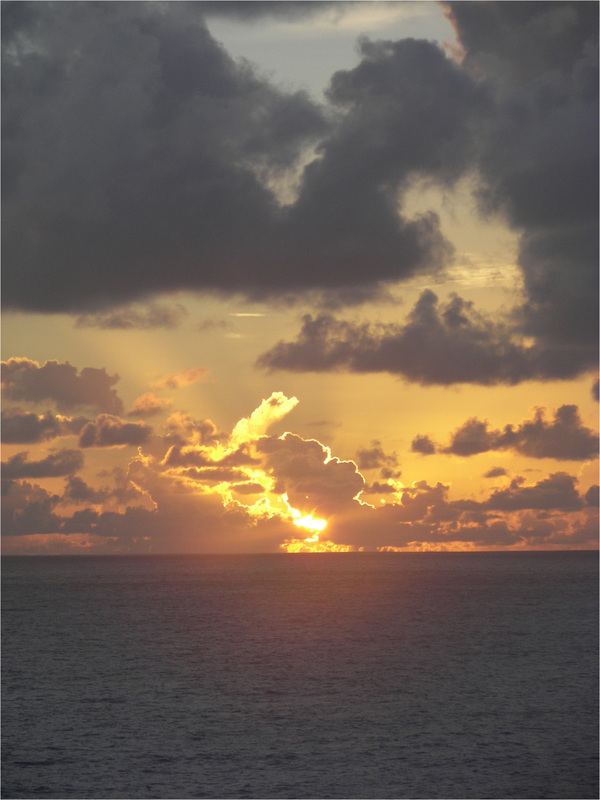 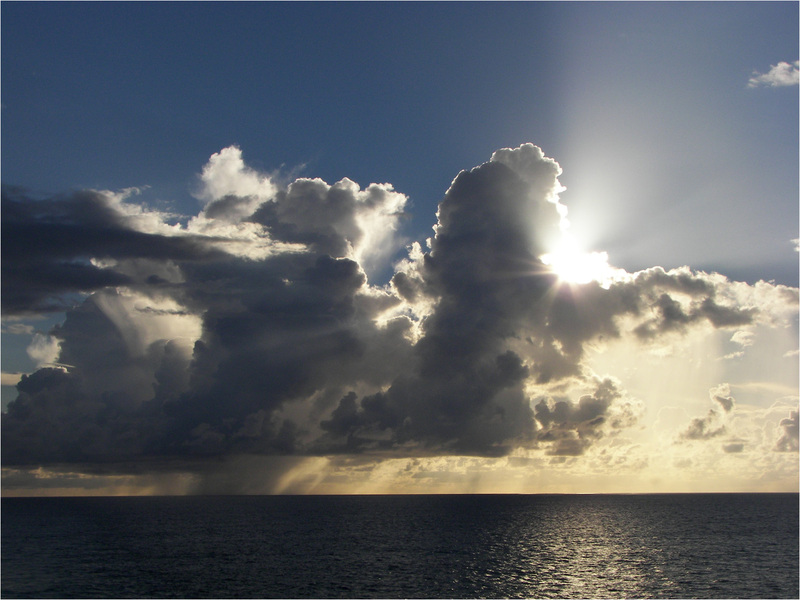 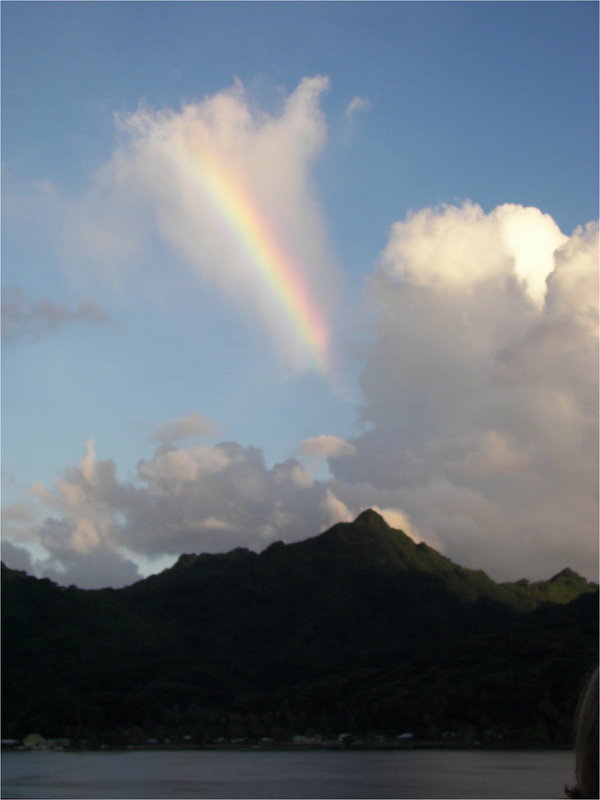 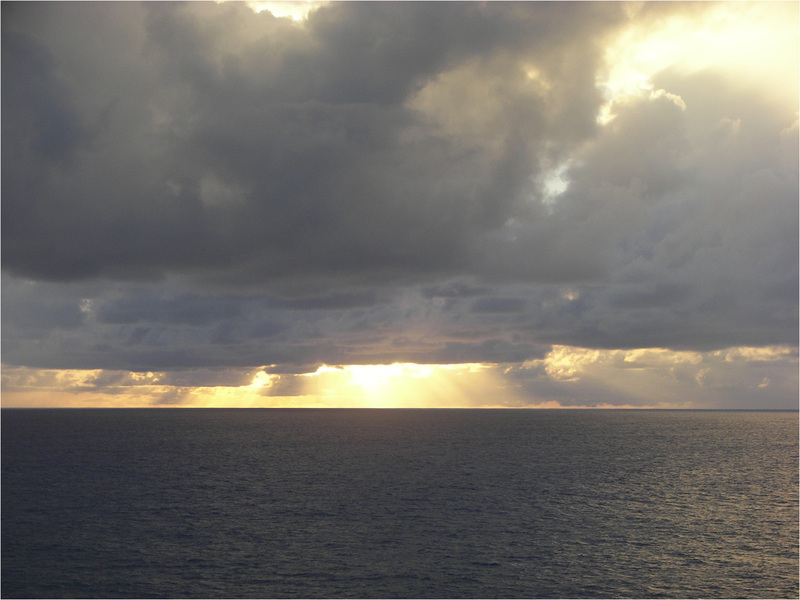 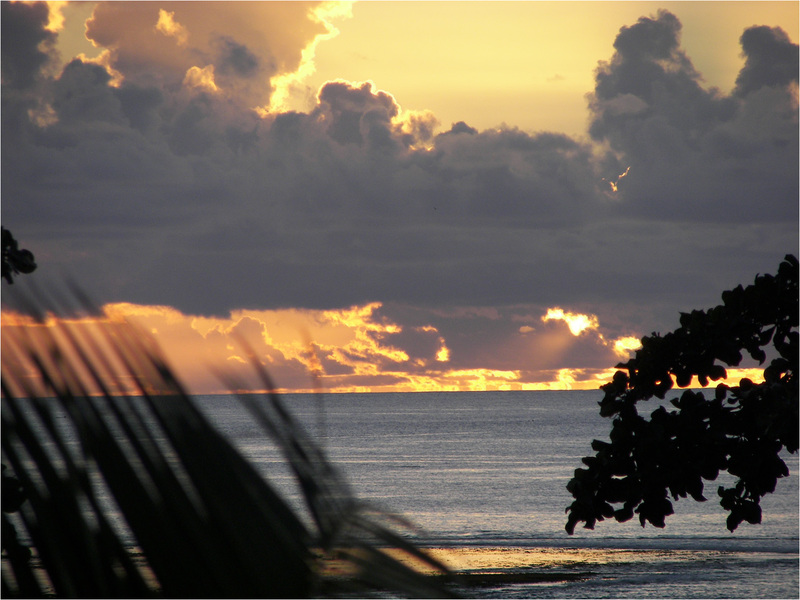 An early morning view of the island of Raiatea. 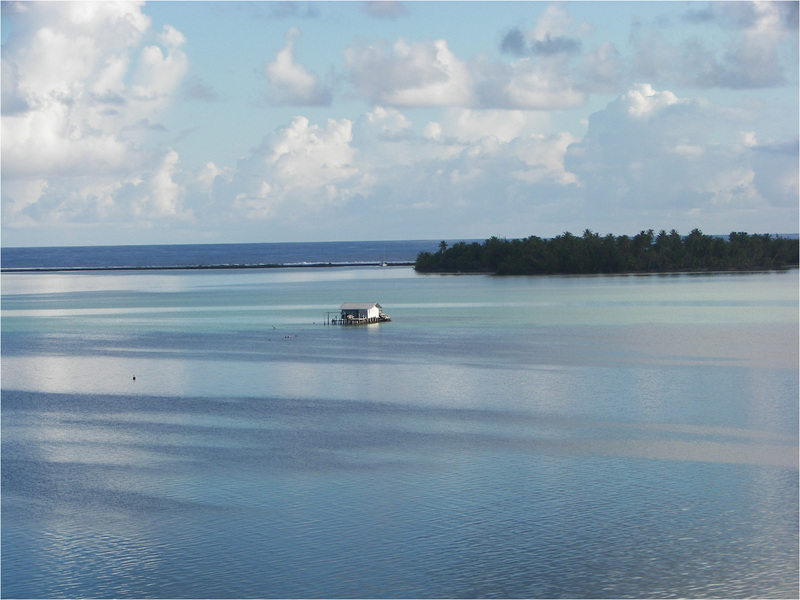 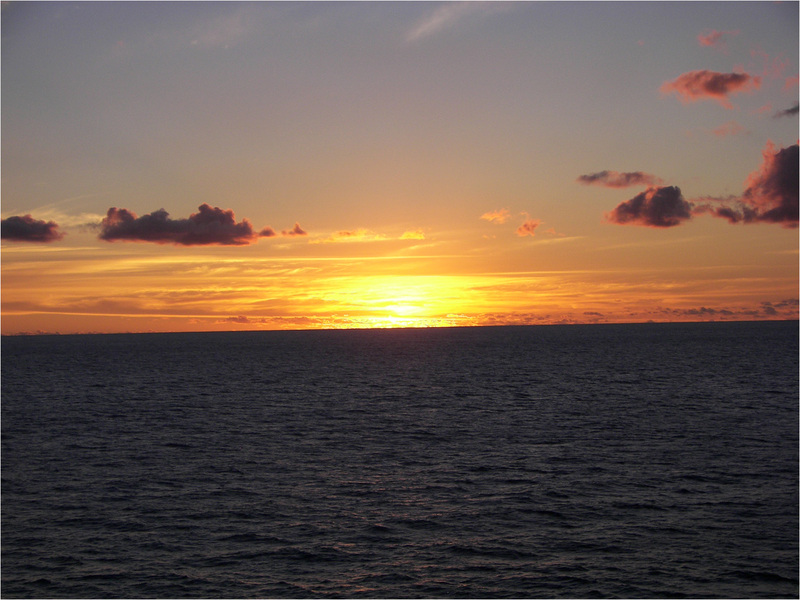 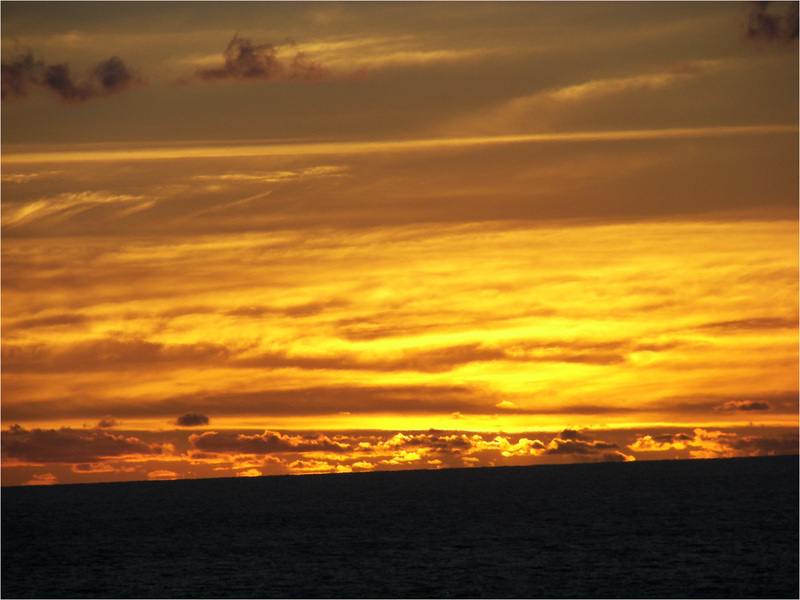 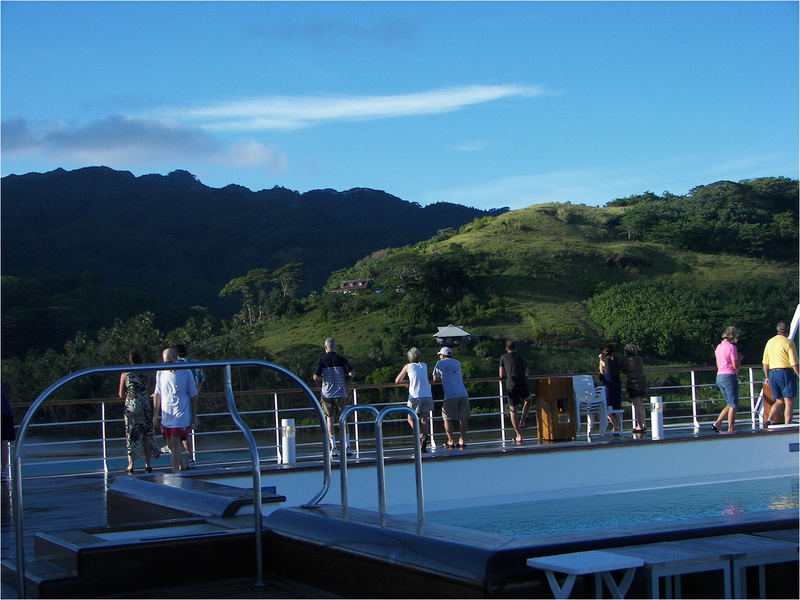 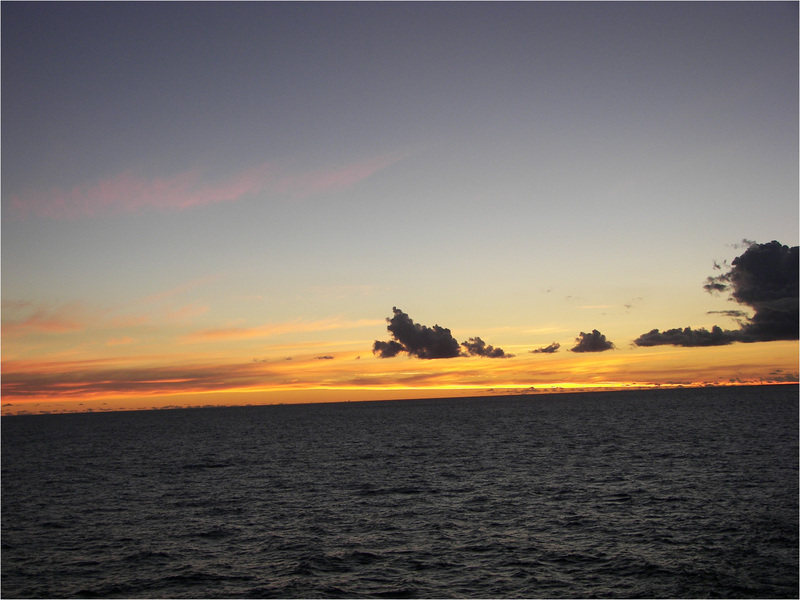 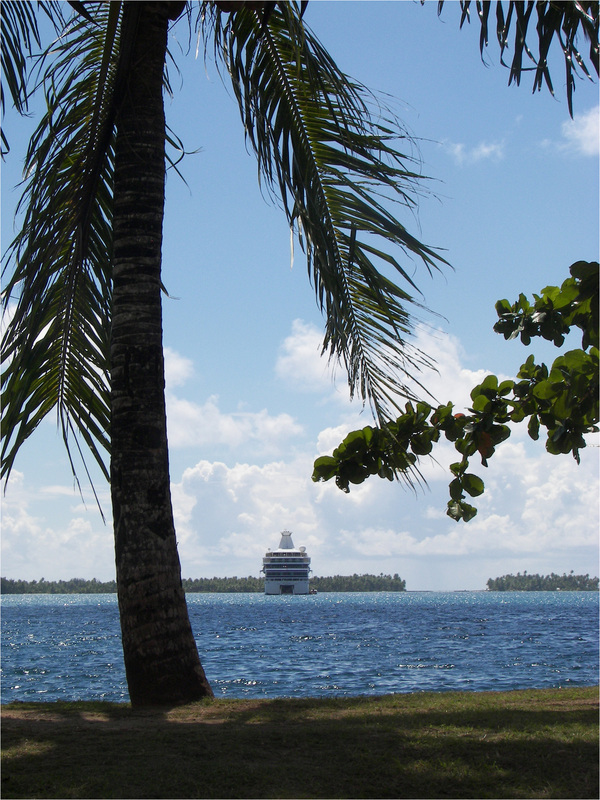 Photo taken from the pool deck (deck 8) looking at Tahaa. 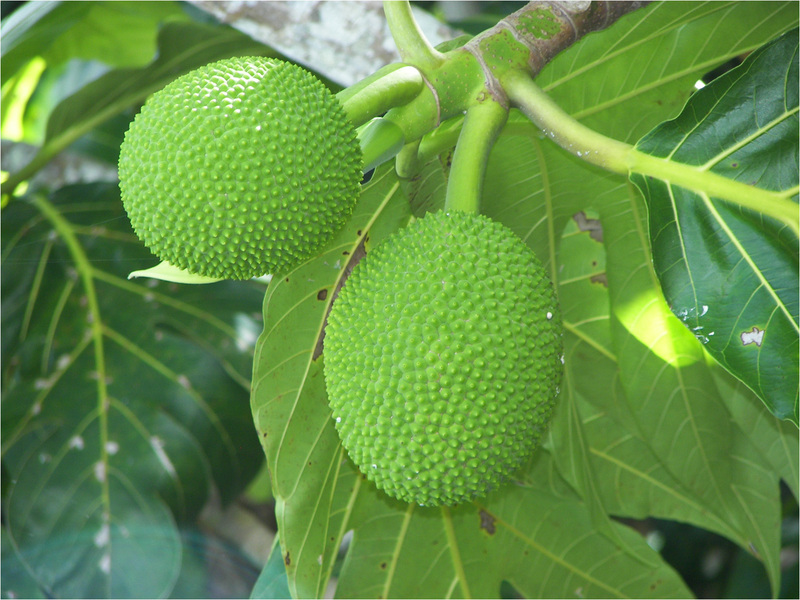 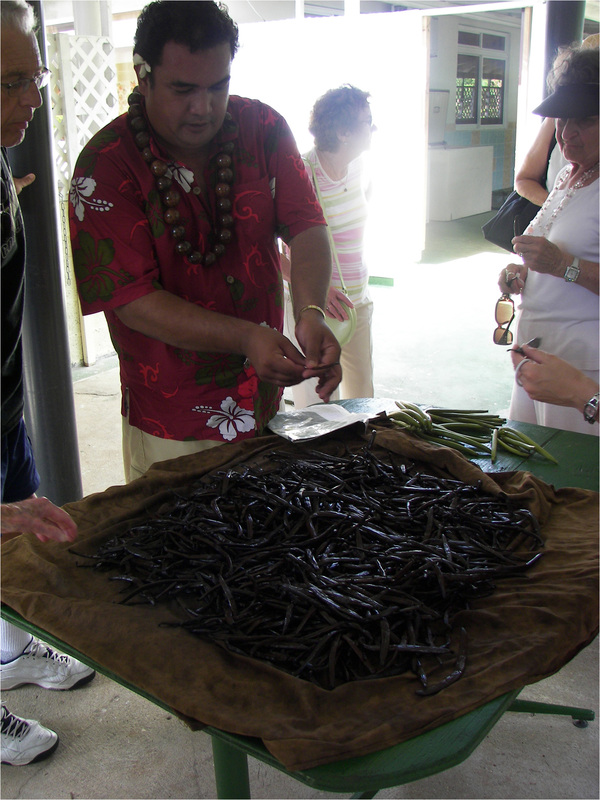 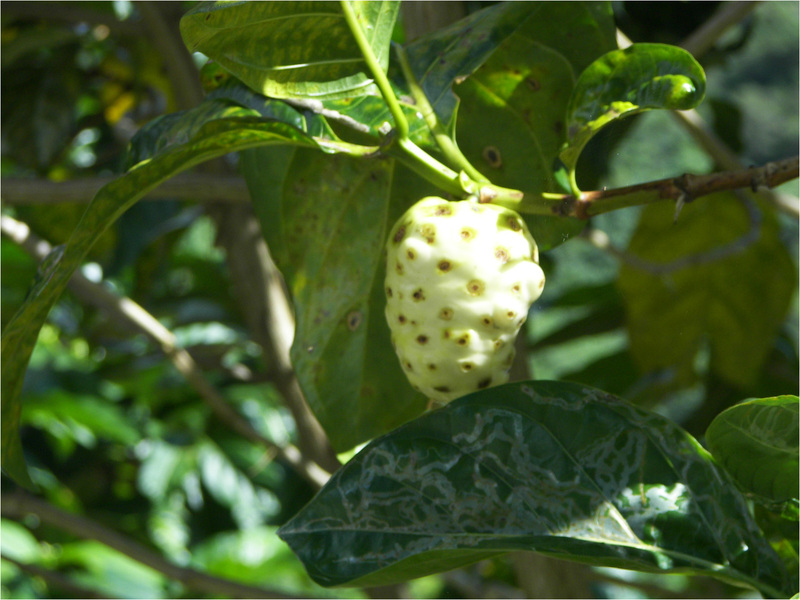 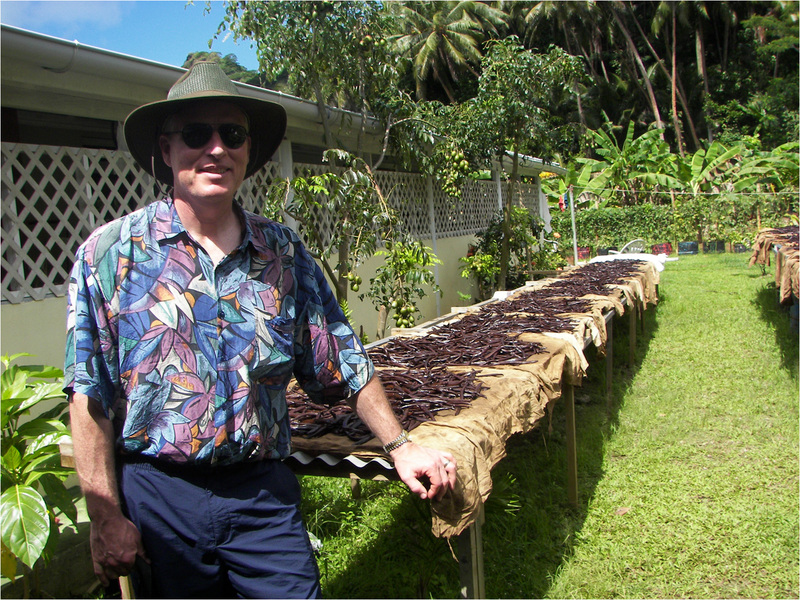 Our Tahaa tour guide explaining about the vanilla beans. 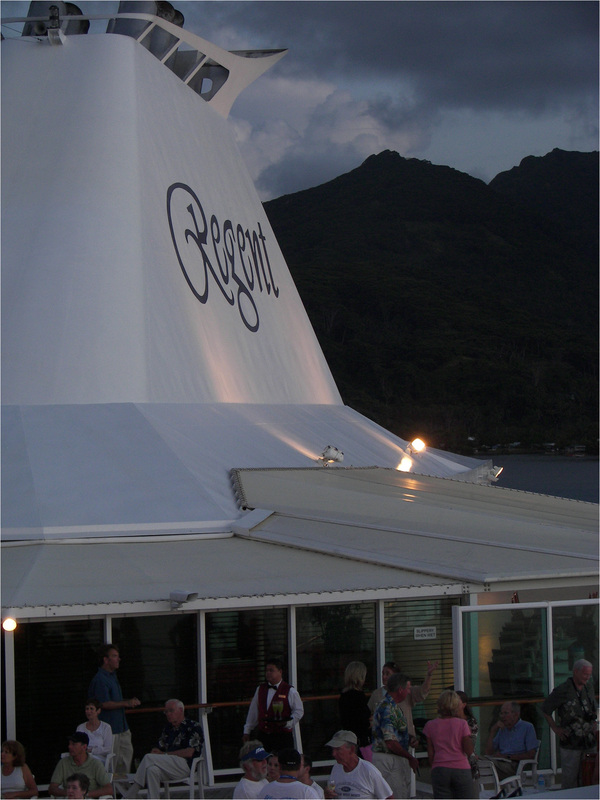 Not only were we fed, we were entertained. 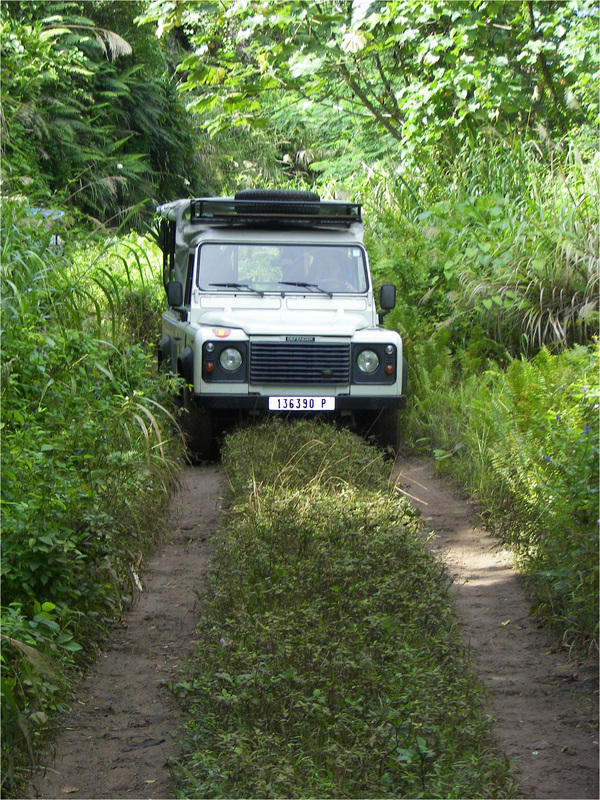 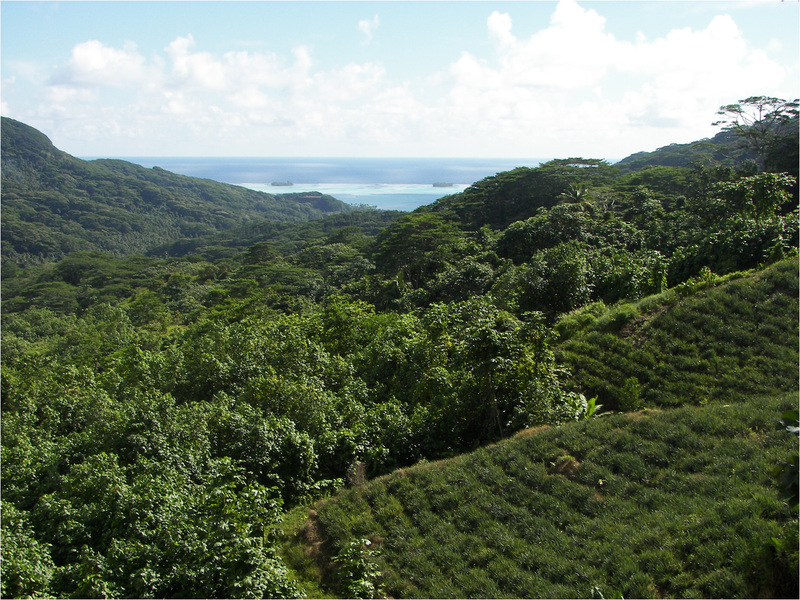 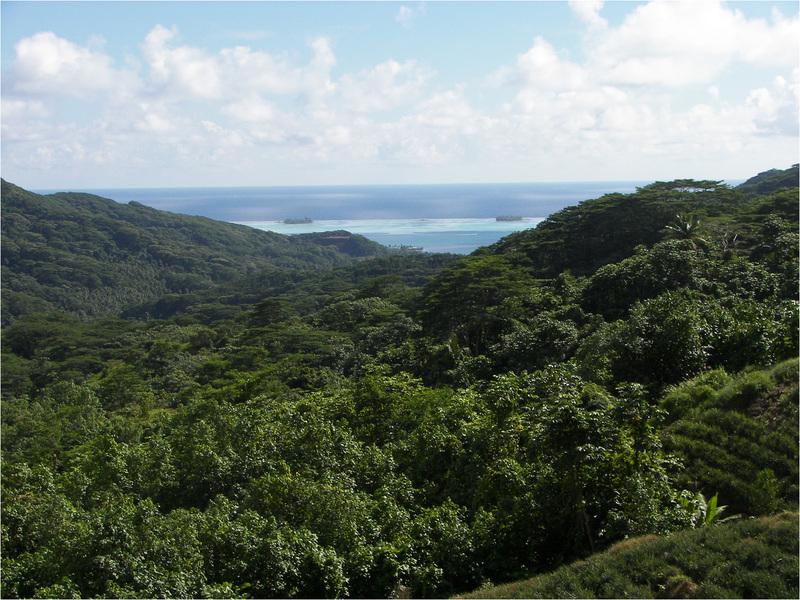 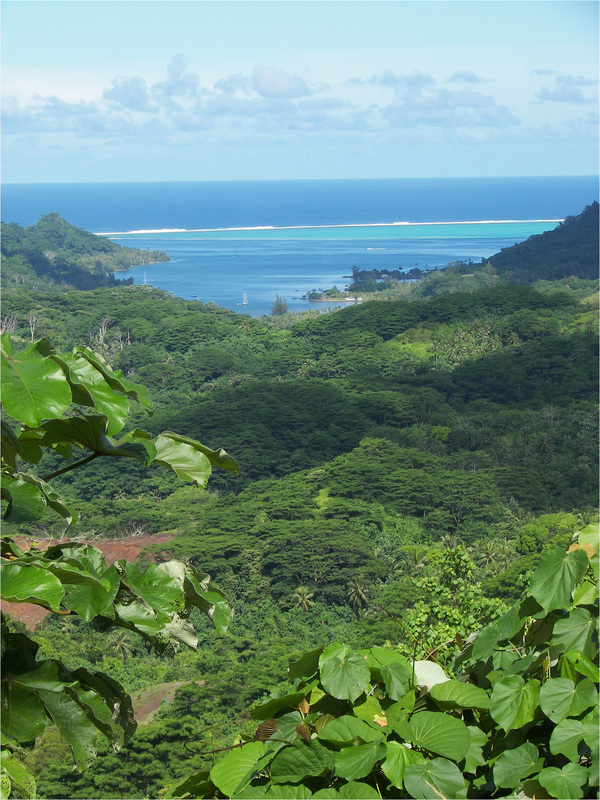 This was a good section of road on Tahaa. 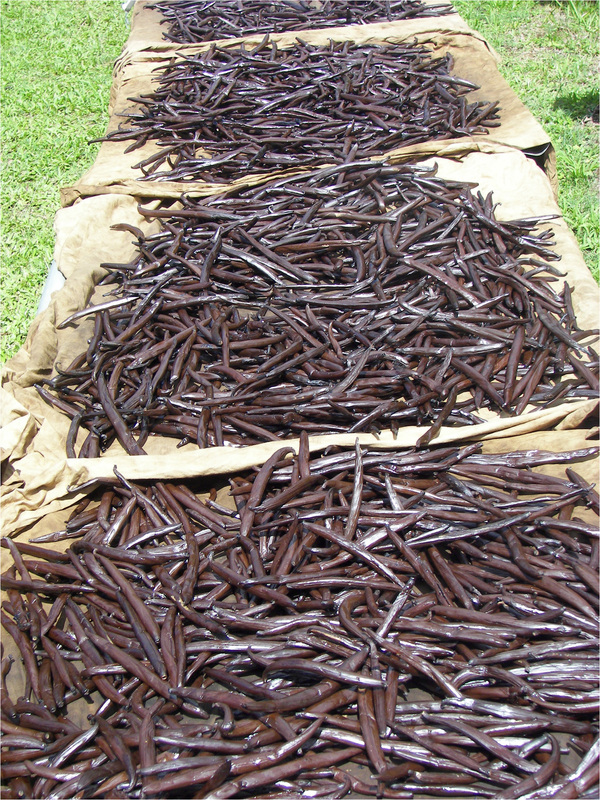 Vanilla beans baking in the sun. 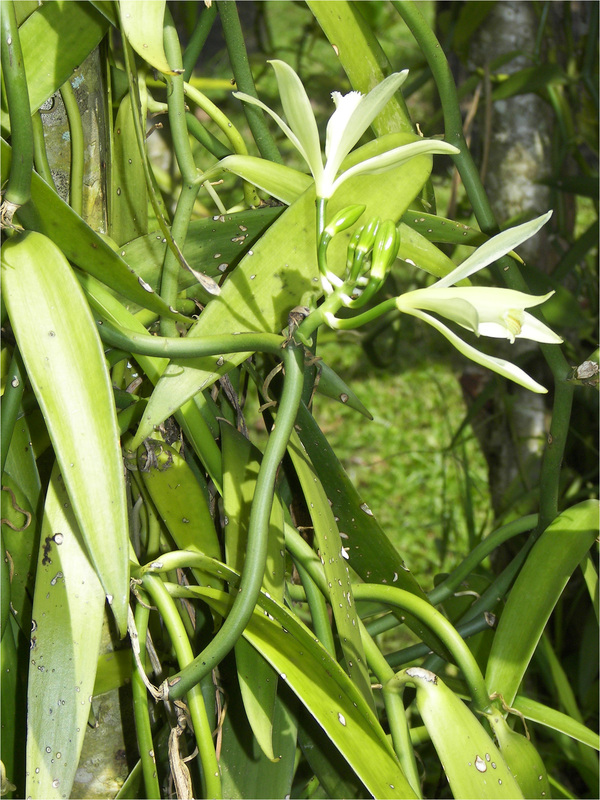 Vanilla vine with flower. 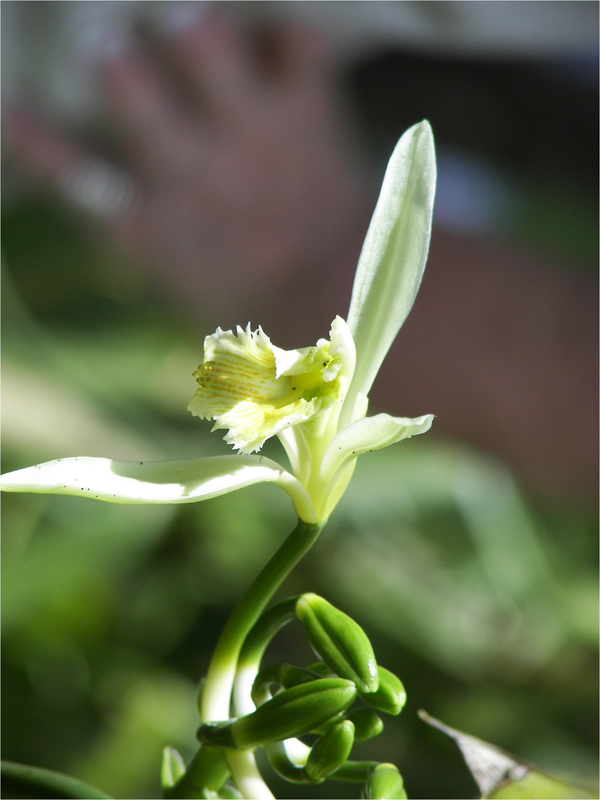 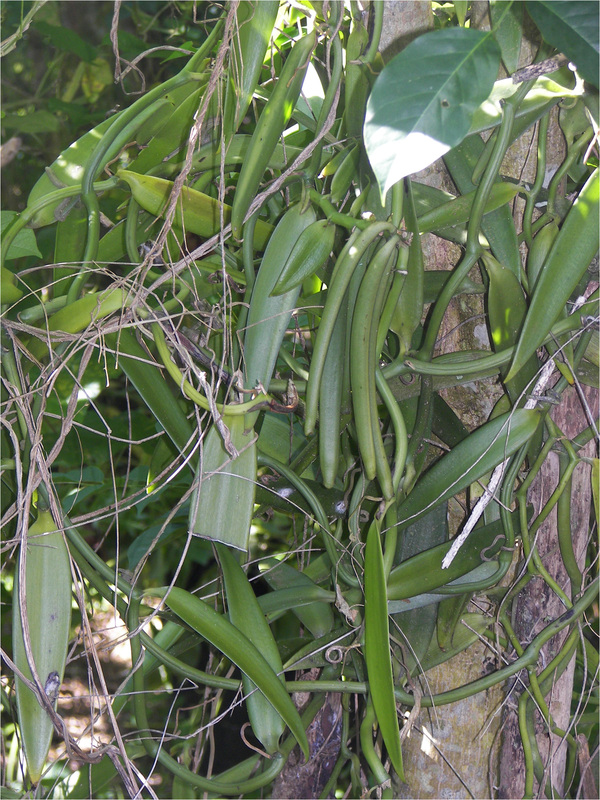 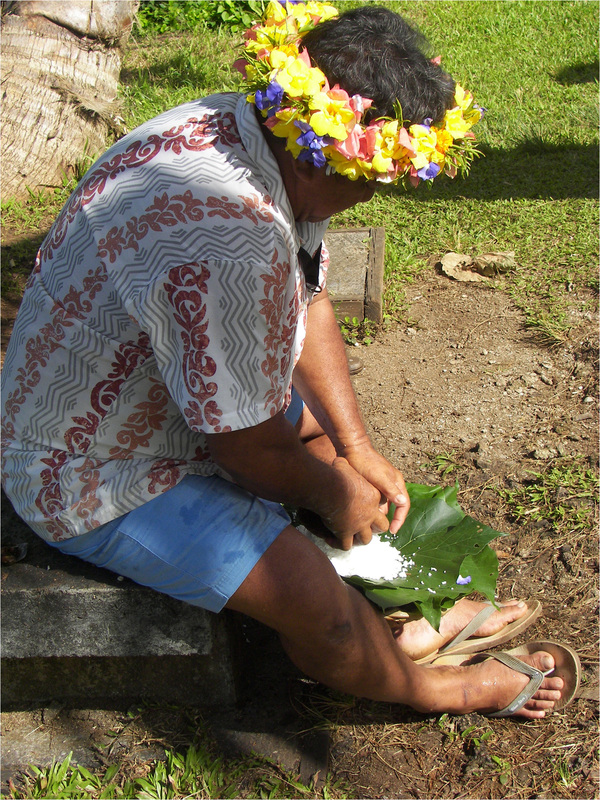 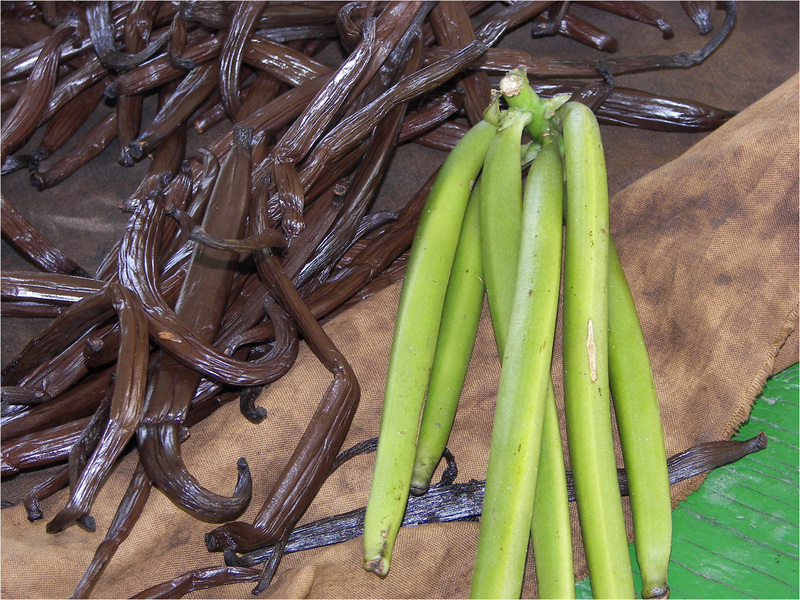 The vanilla flowers are pollinated by hand. 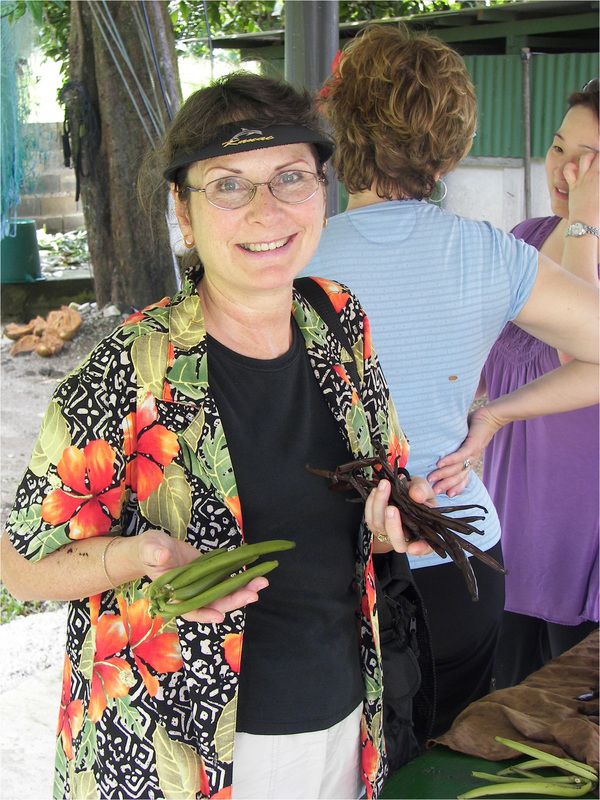 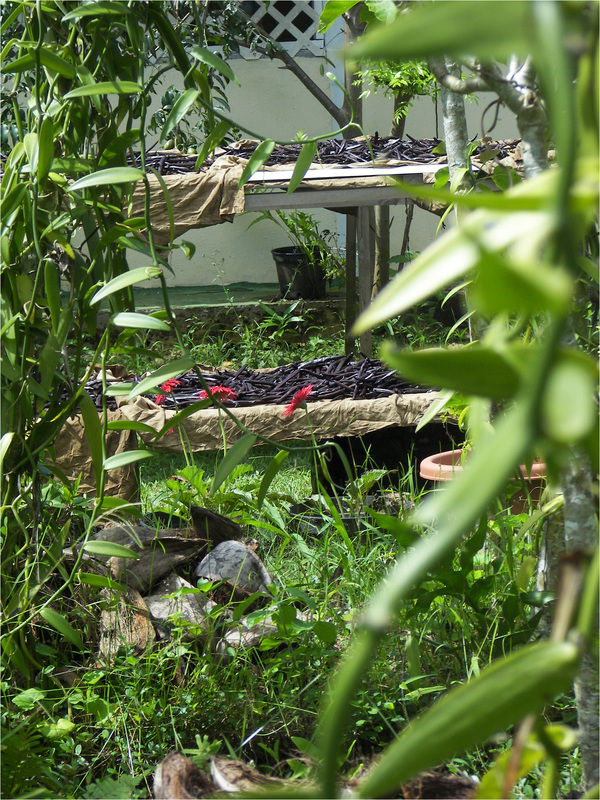 Katherine holding vanilla beans before and after ripening process. 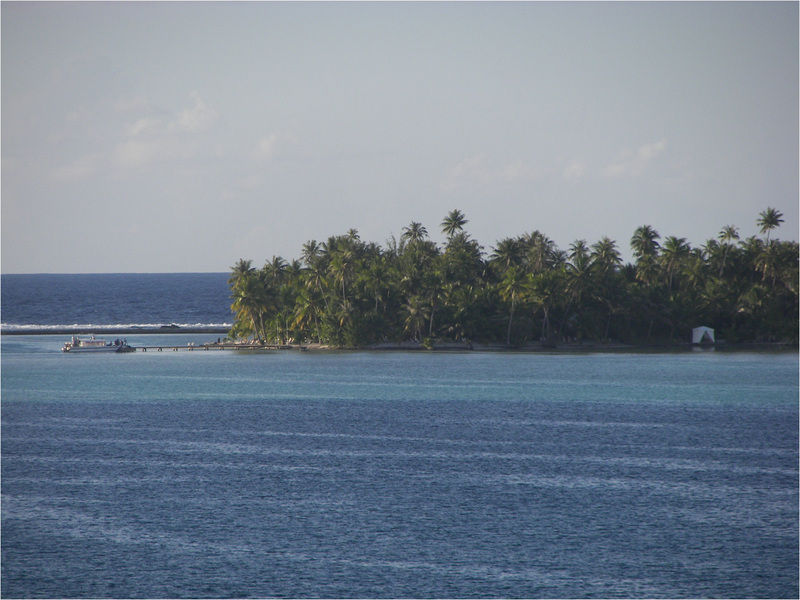 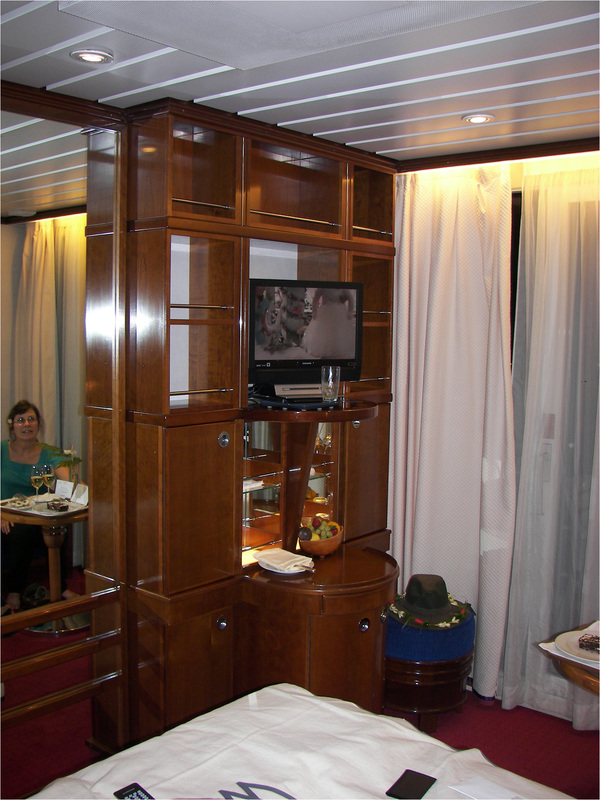 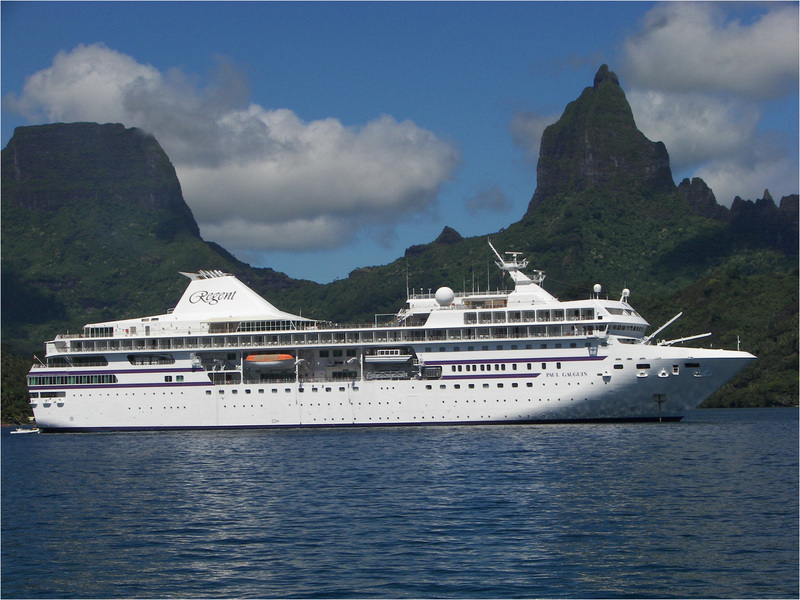 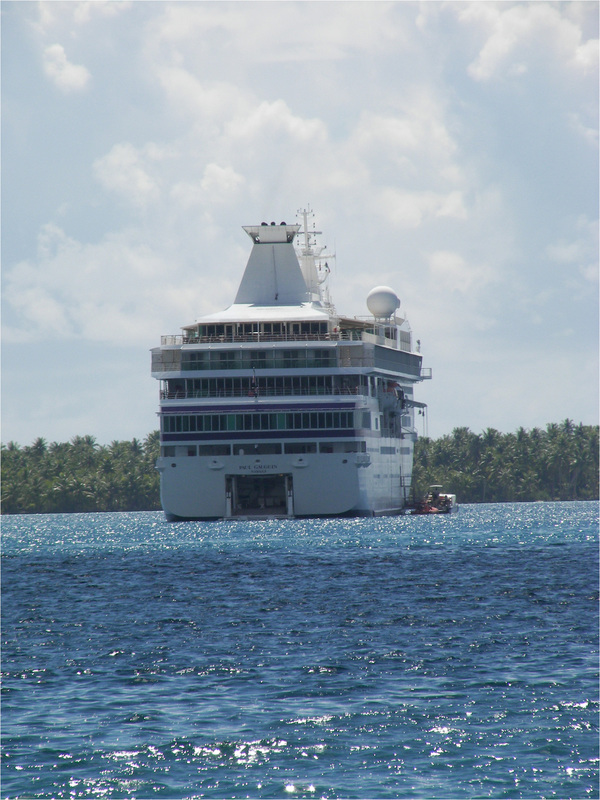 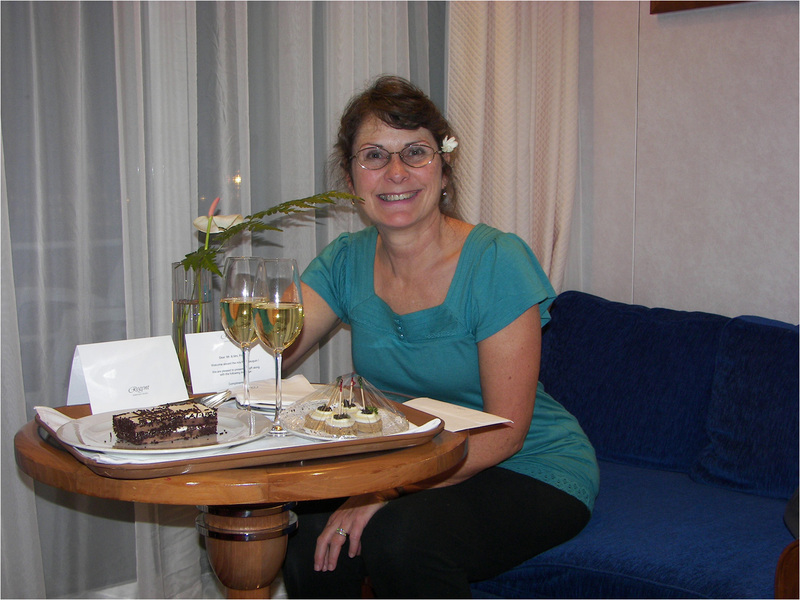 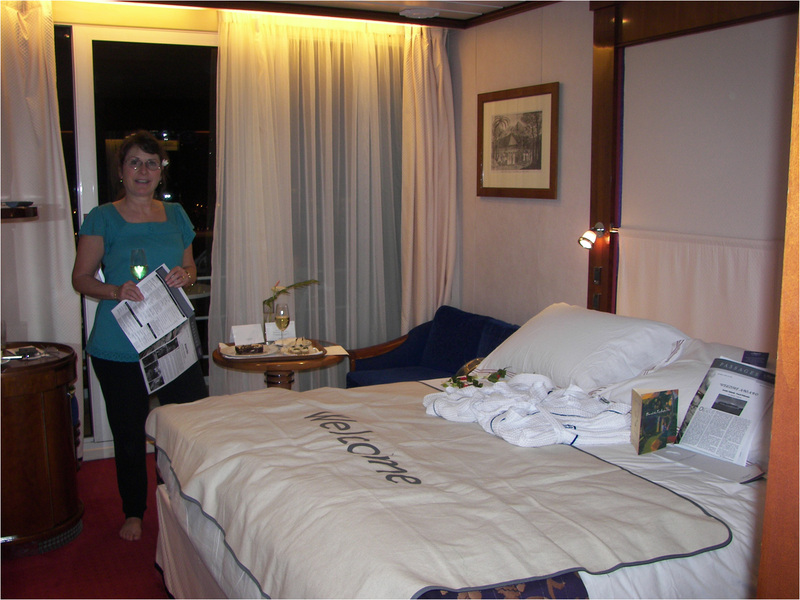 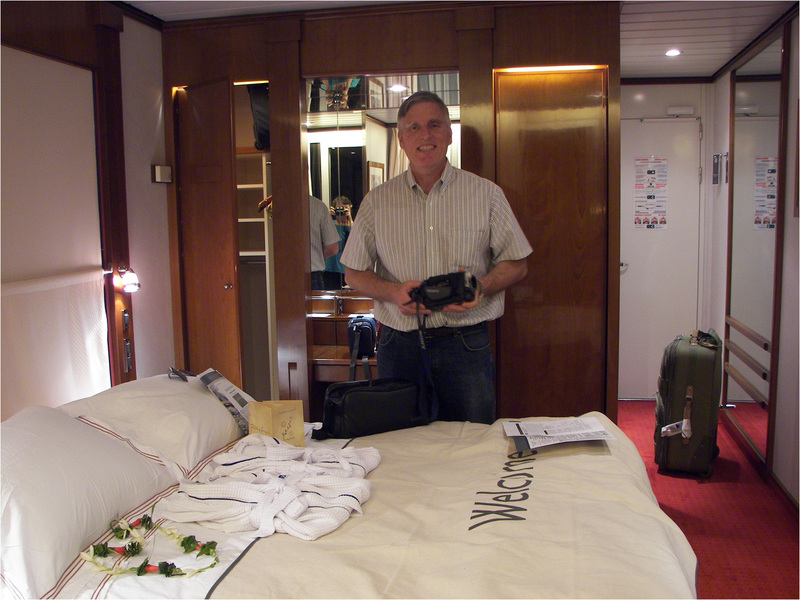 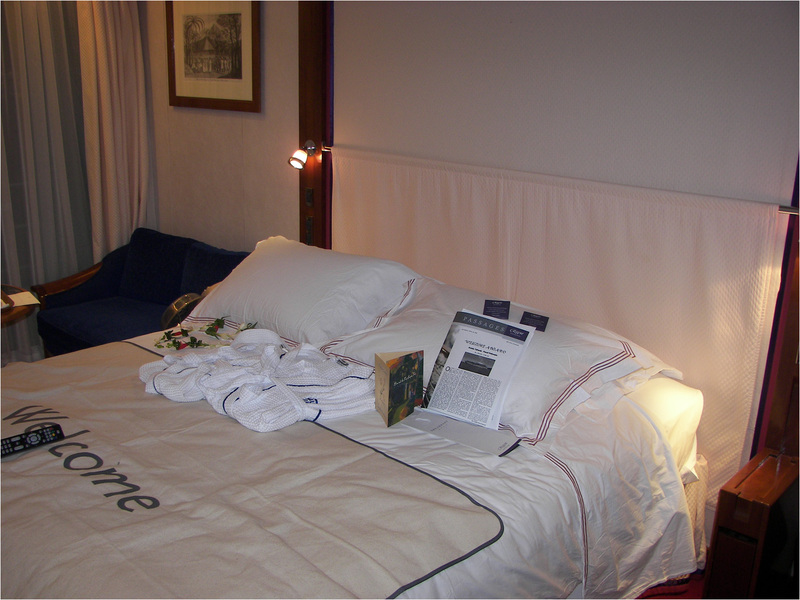 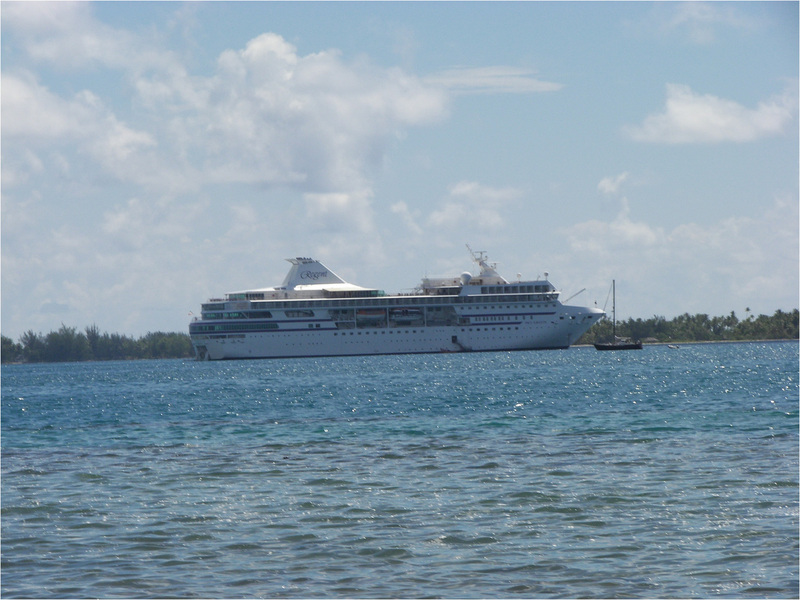 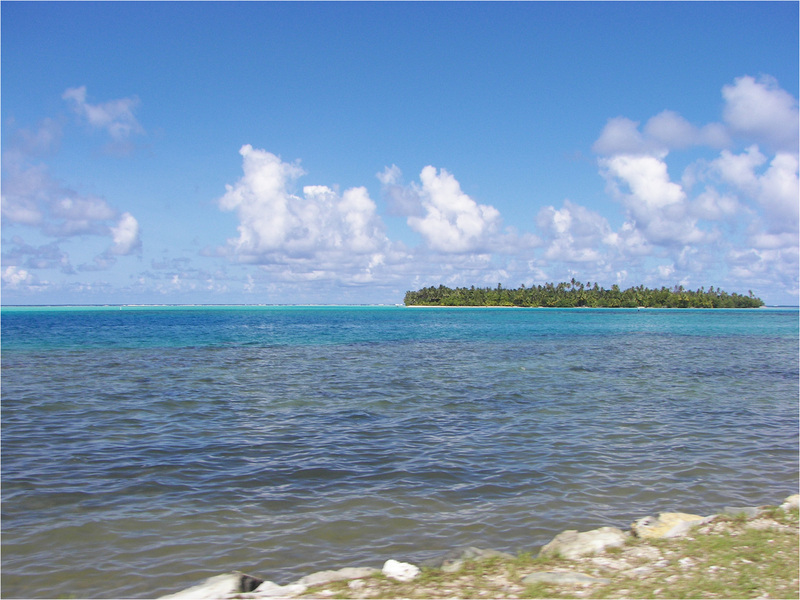 Private motu (small island) of Regent Seven Seas Cruise Lines, in the Tahaa lagoon. 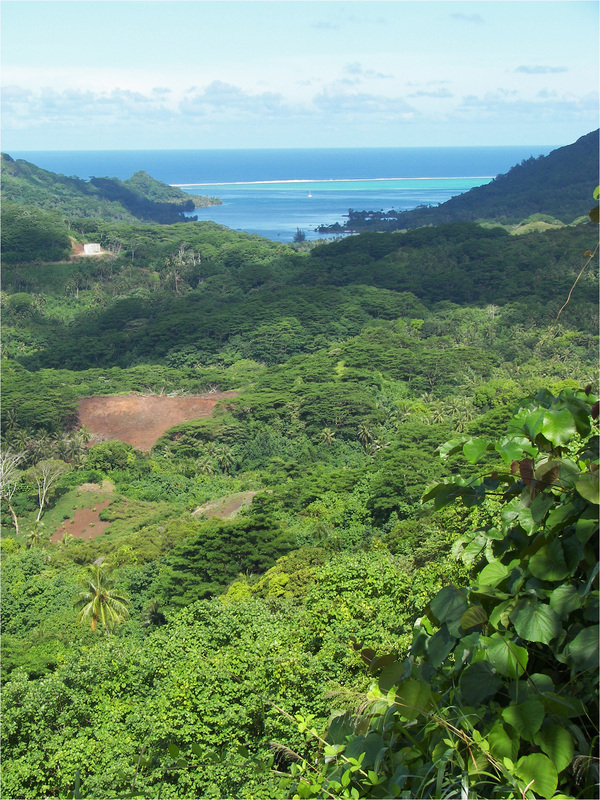 We spent part of the day there enjoying a barbecue lunch before snorkeling. 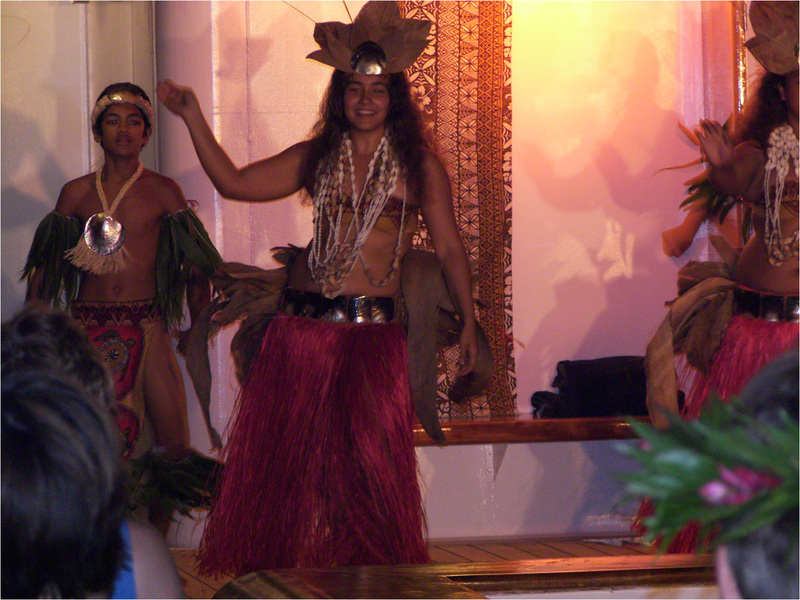 Some entertainment from the Le Guagines Monday evening by the pool. 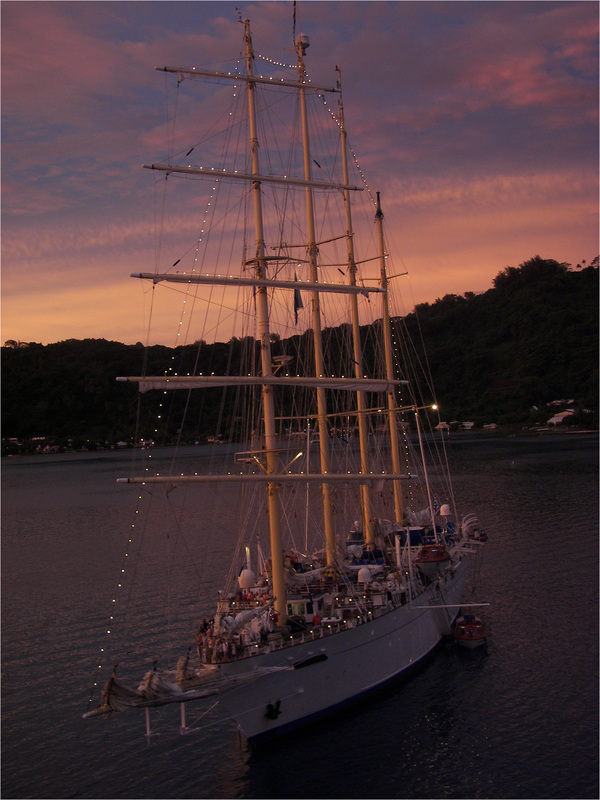 Sail boat which we had last seen at the port in Tahiti. 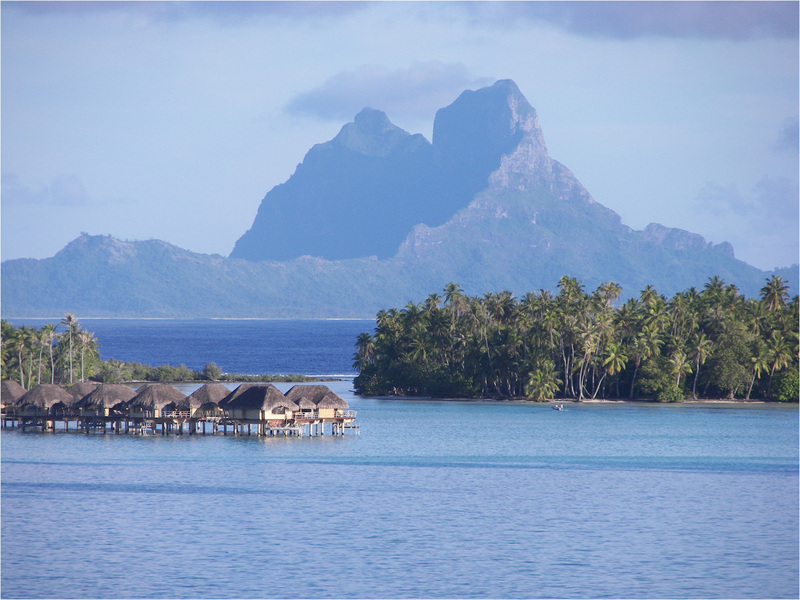 9:30 Thursday morning stopped for some pictures during our drive around Bora Bora. 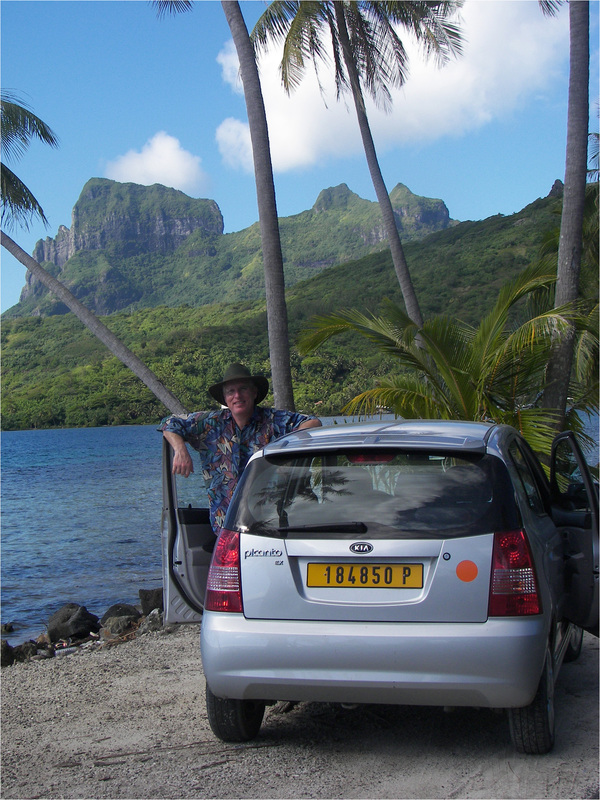 Bob with the rental car. 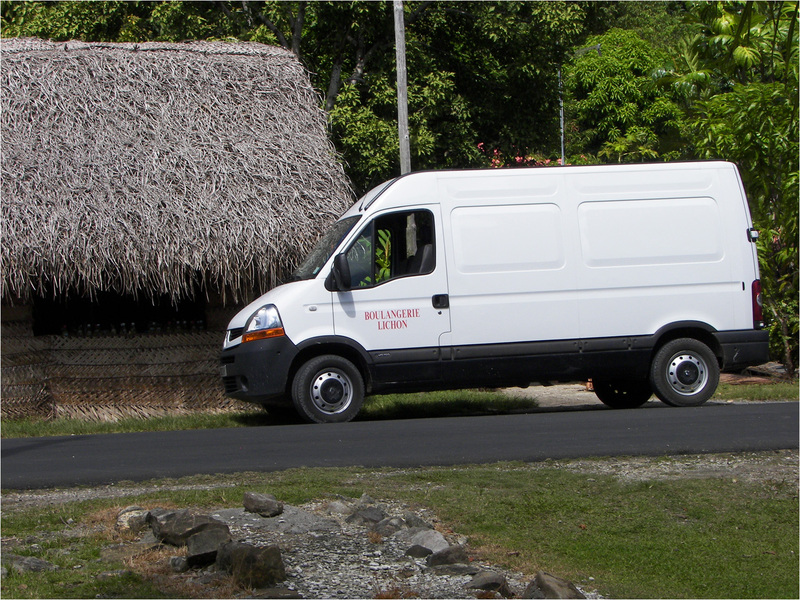 An upgrade from our Euro car of 1998. 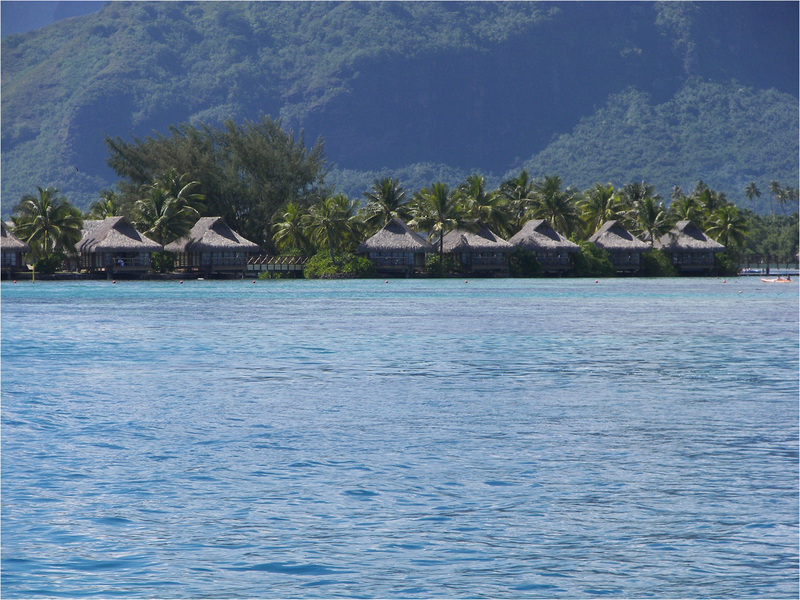 Over the water bungalos at the Intercontinental Bora Bora Le Moana Resort. 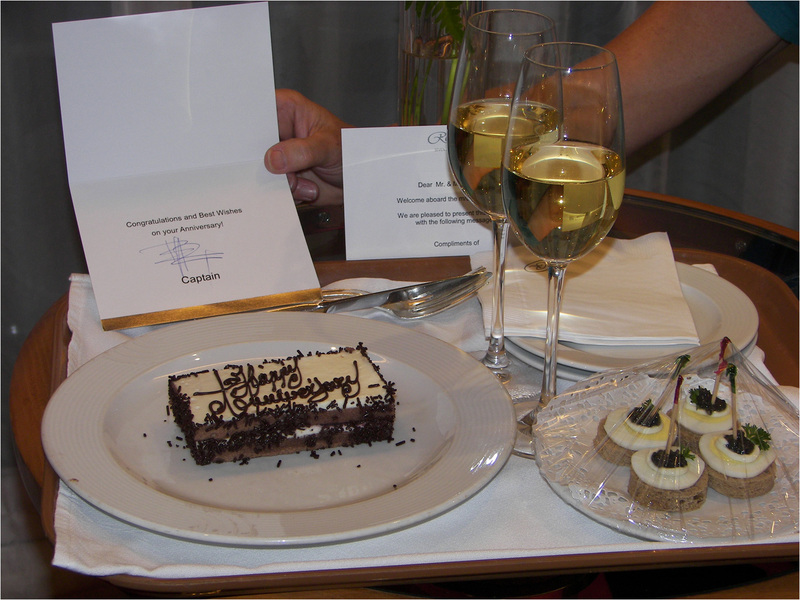 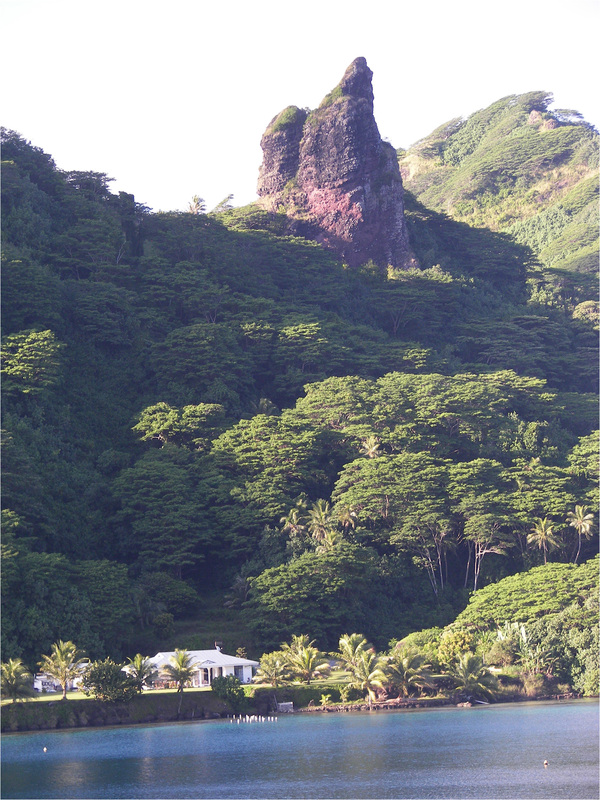 This was where we had stayed 10 years ago. 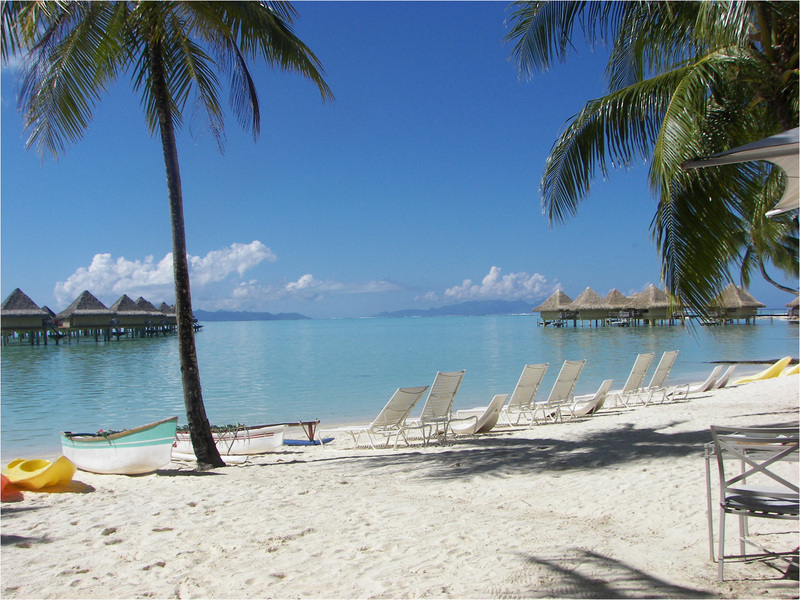 Swimming pool at the Intercontinental Bora Bora Le Moana Resort. 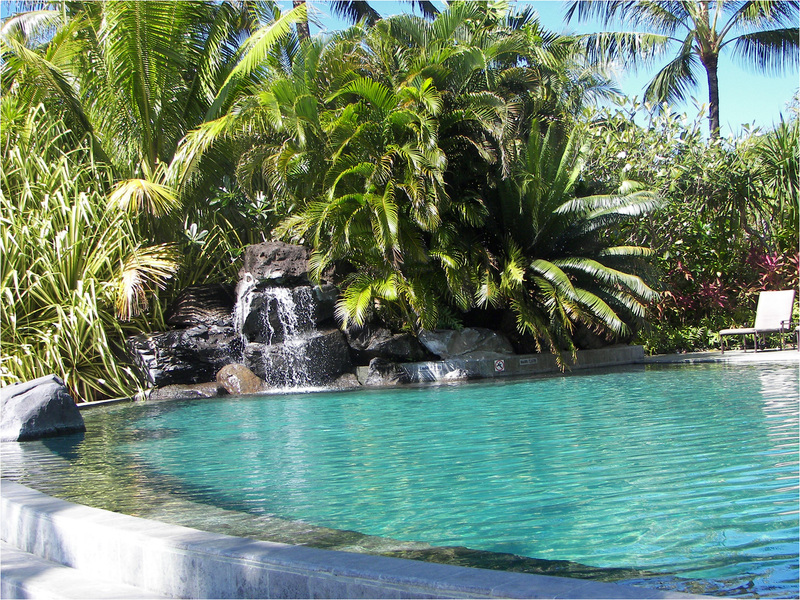 The pool was not there 10 years ago. 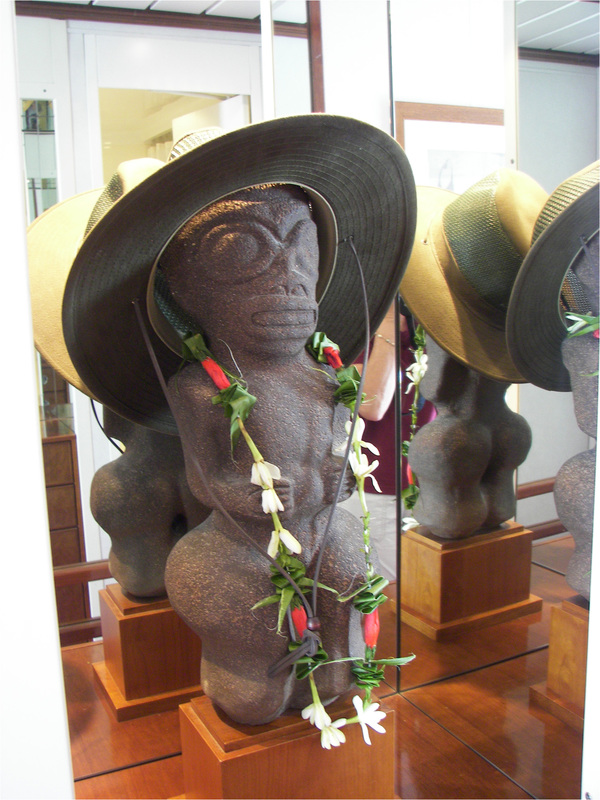 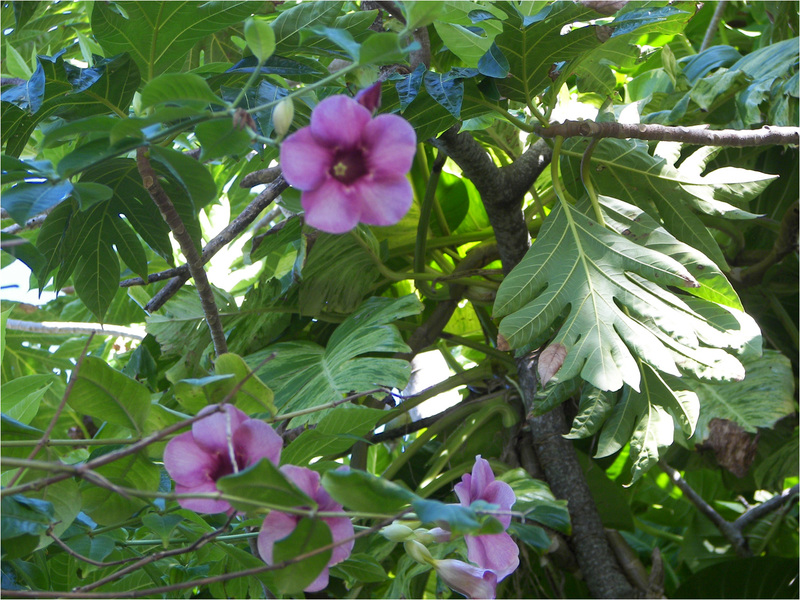 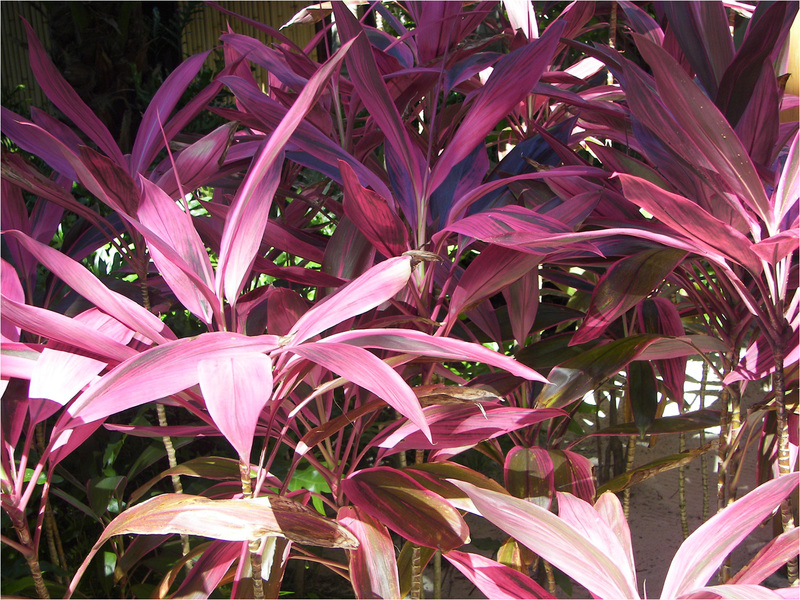 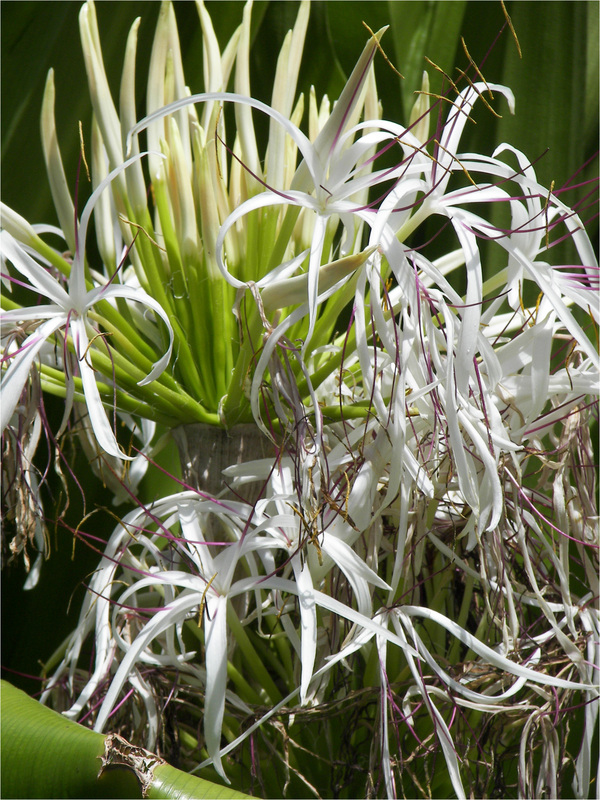 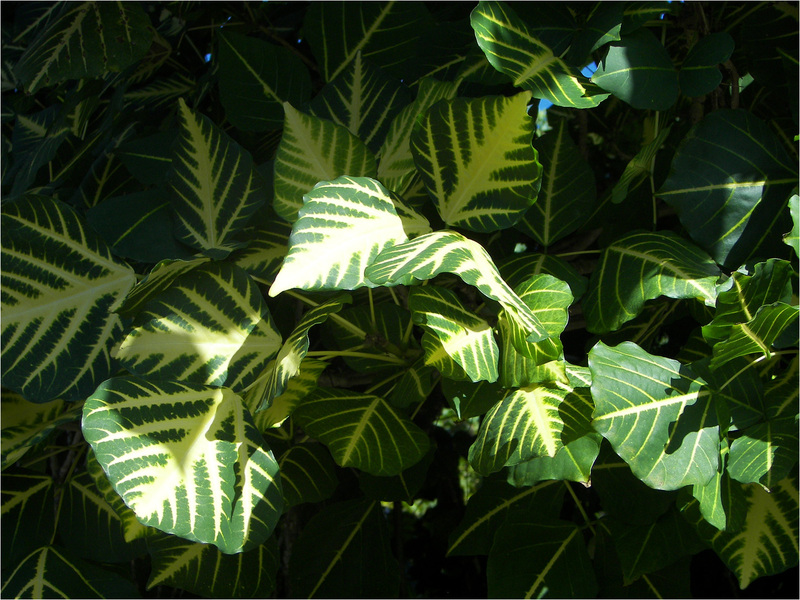 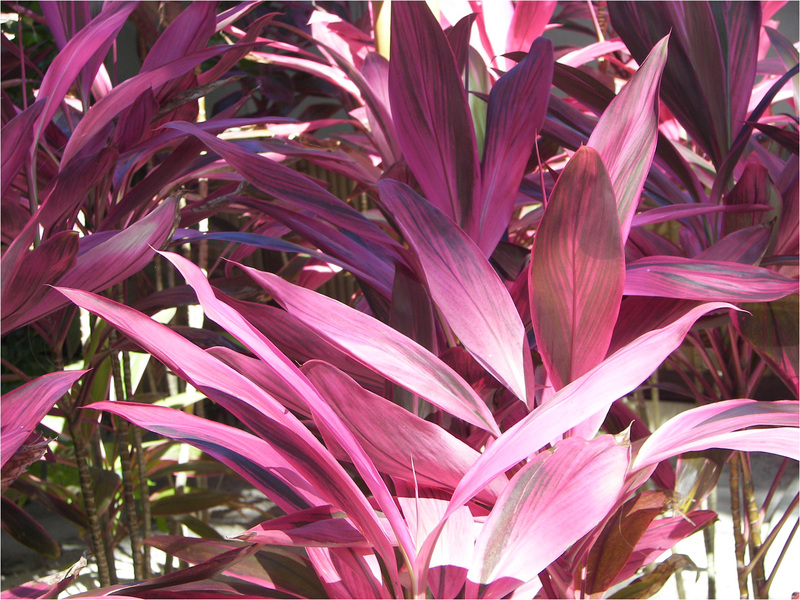 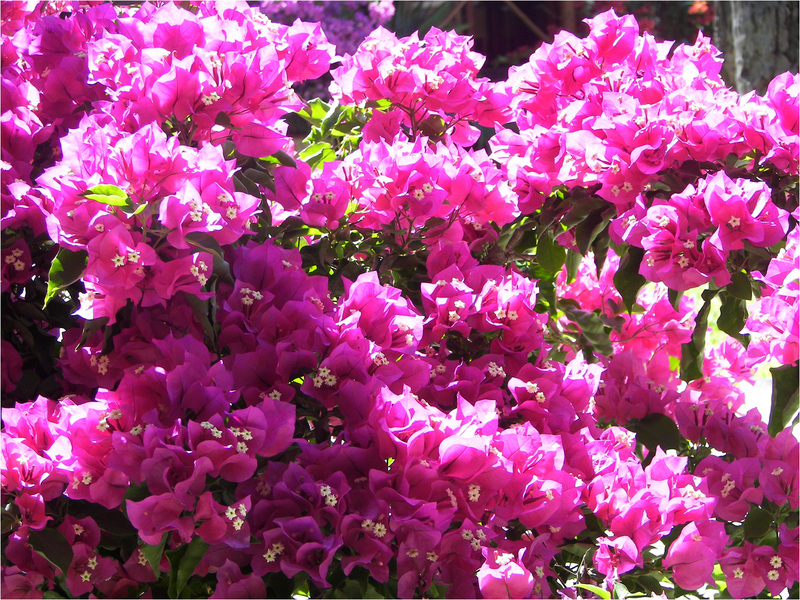 Some of the flowers at the Intercontinental Bora Bora Le Moana Resort. 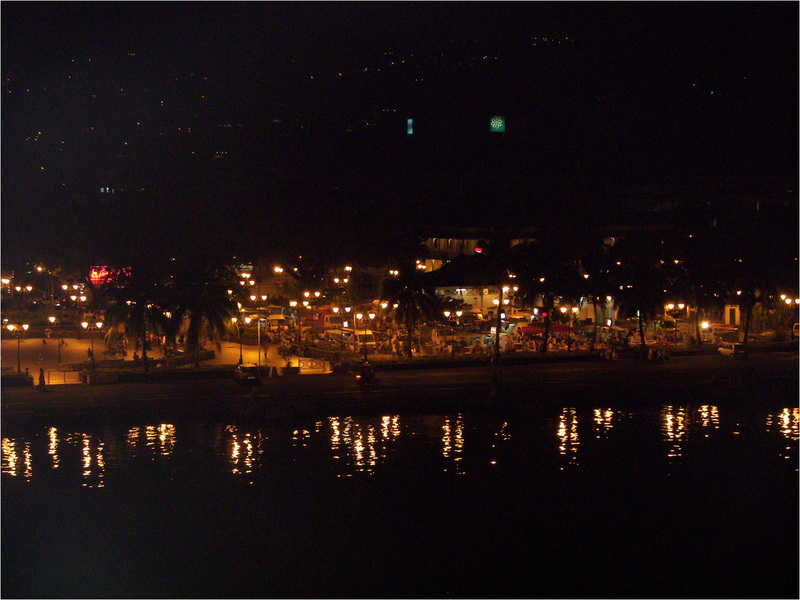 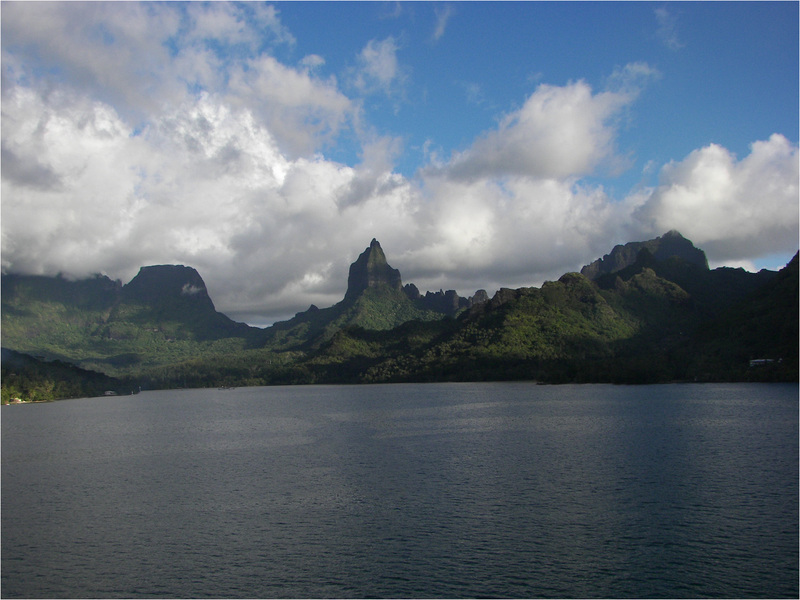 Another view of Bora Bora from our stateroom. 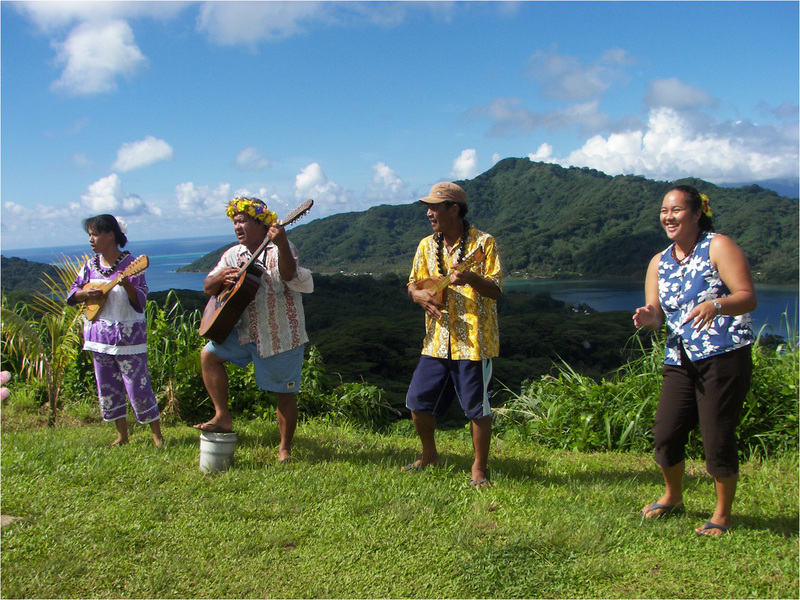 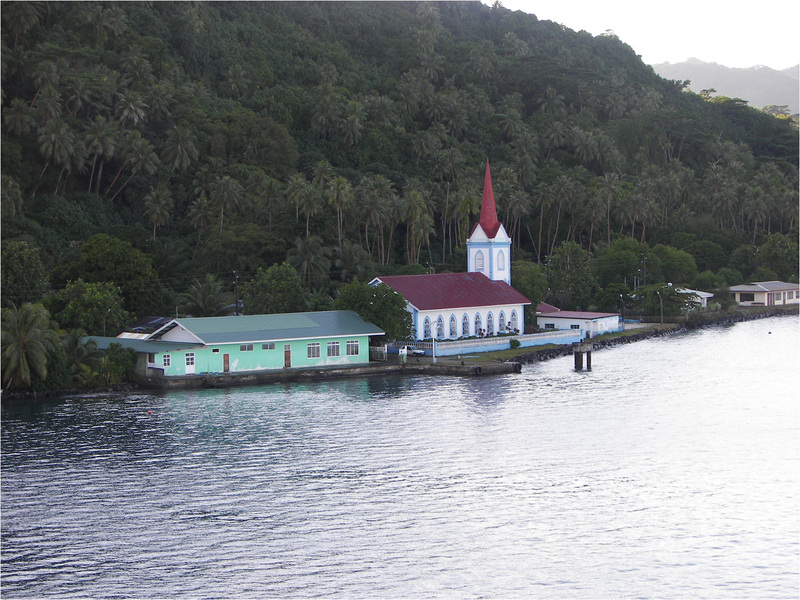 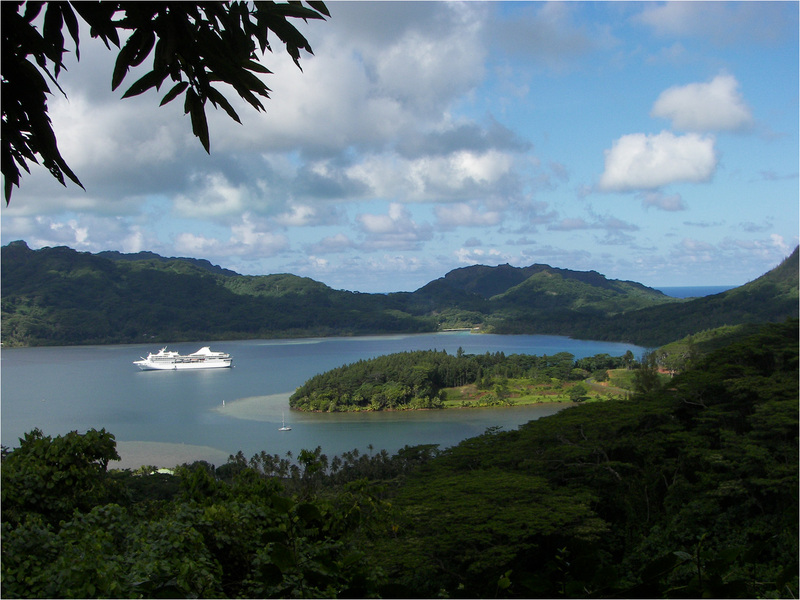 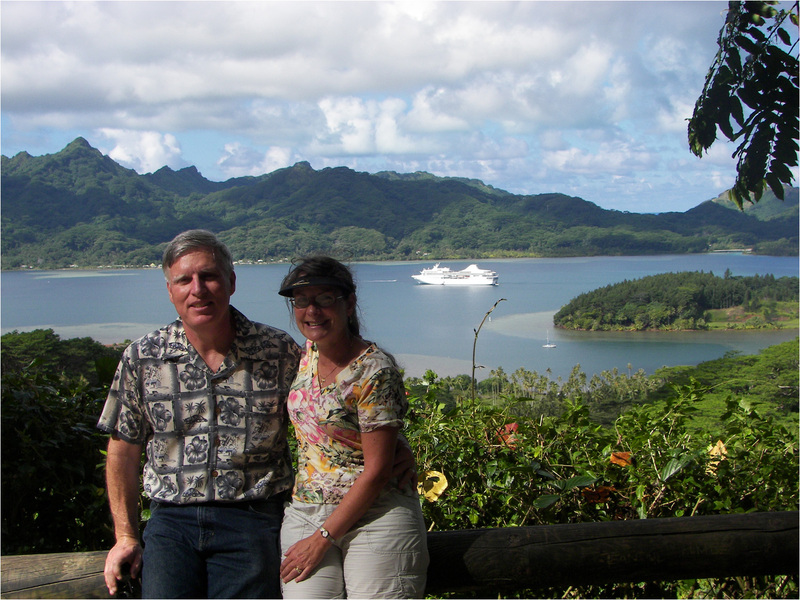 Scenic stop on our tour of Huahine with ship anchored in the lagoon. 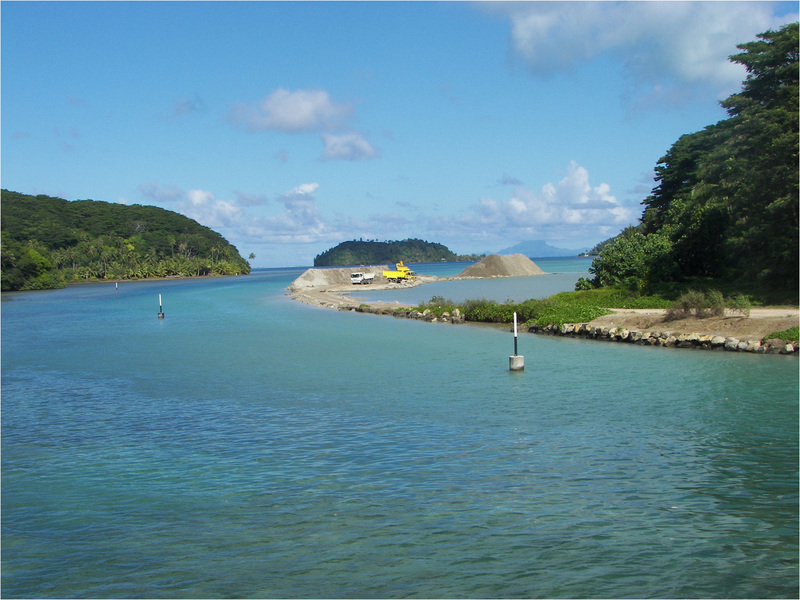 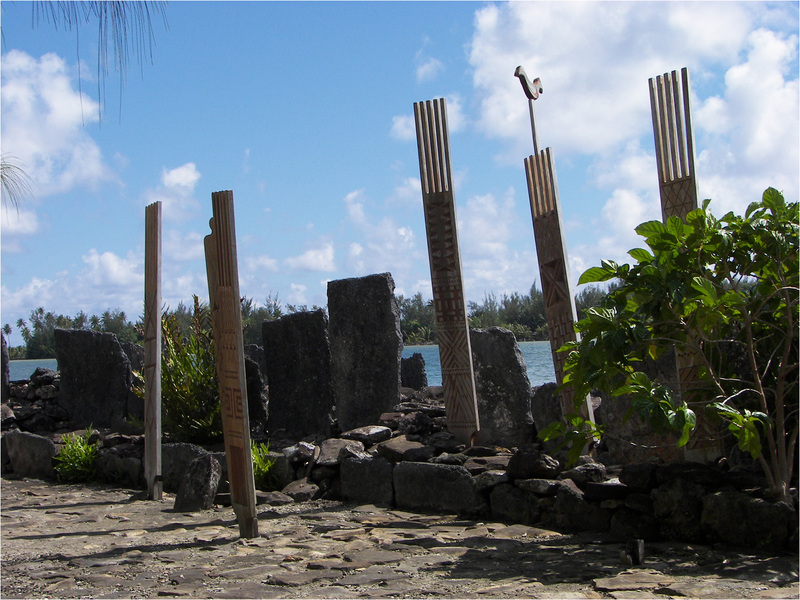 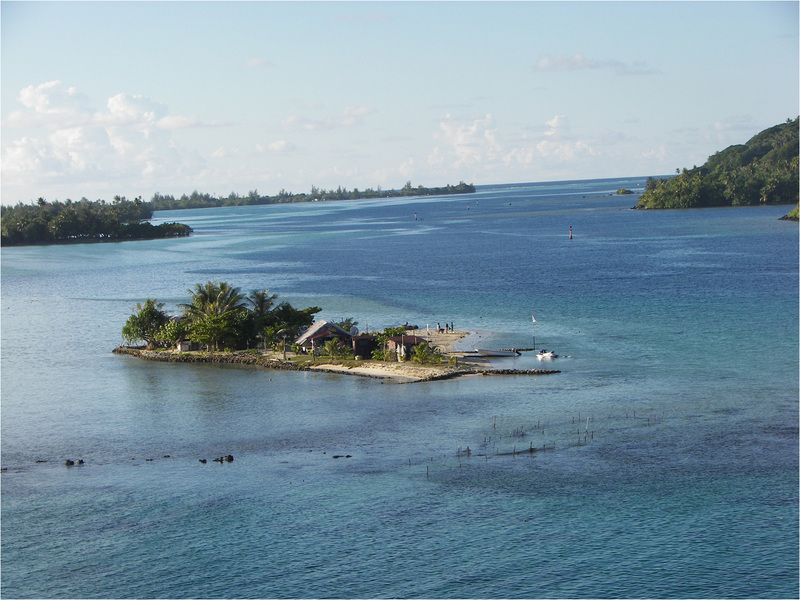 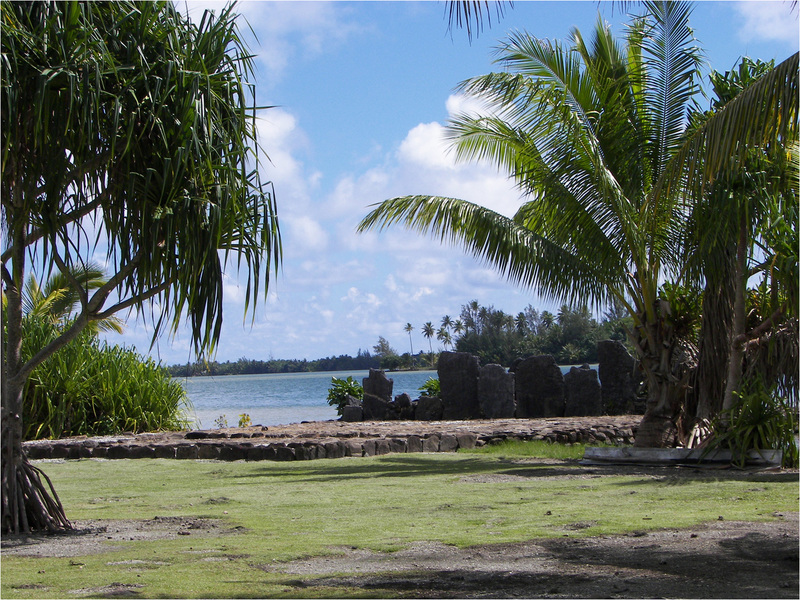 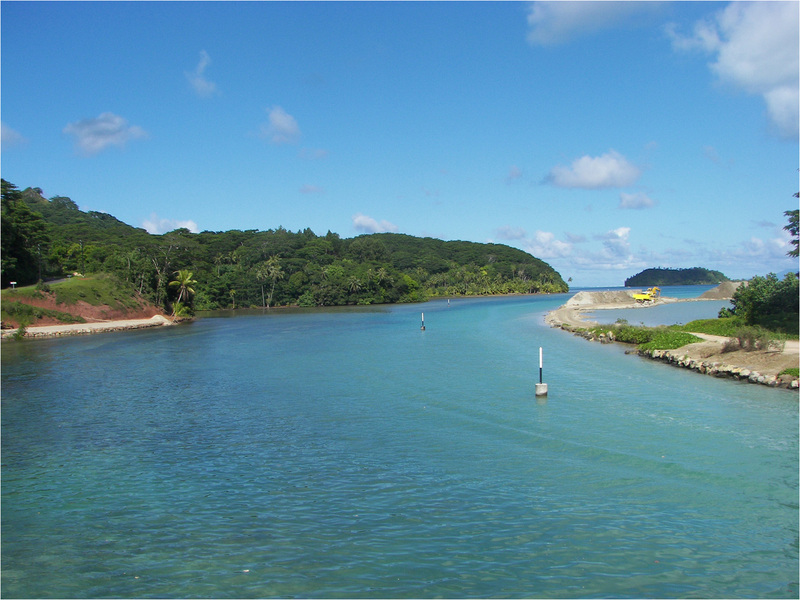 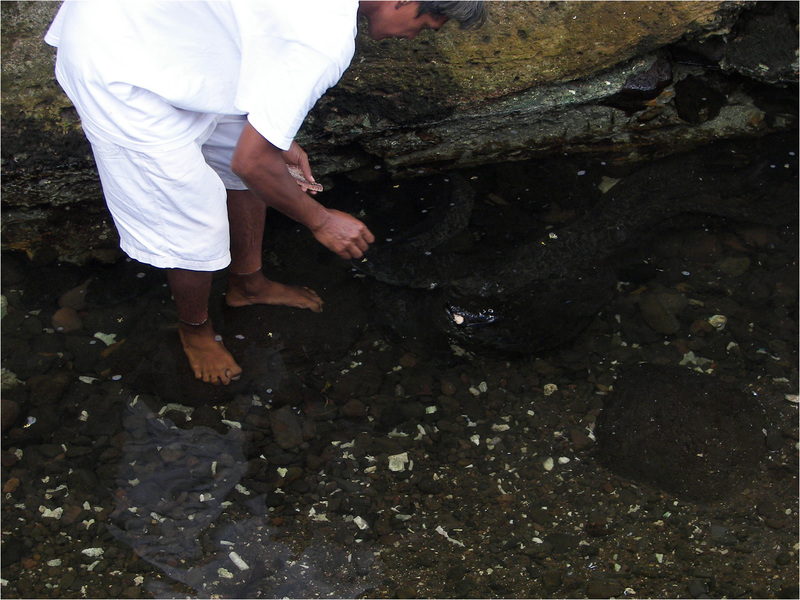 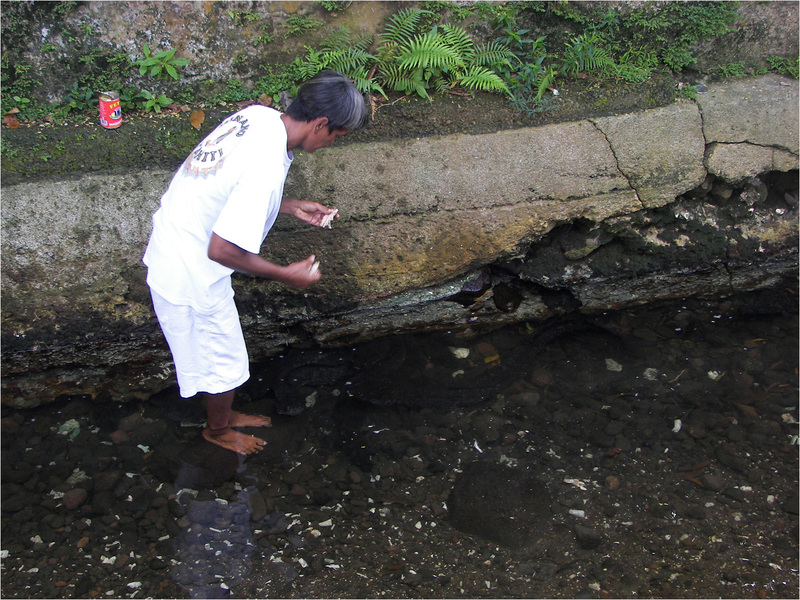 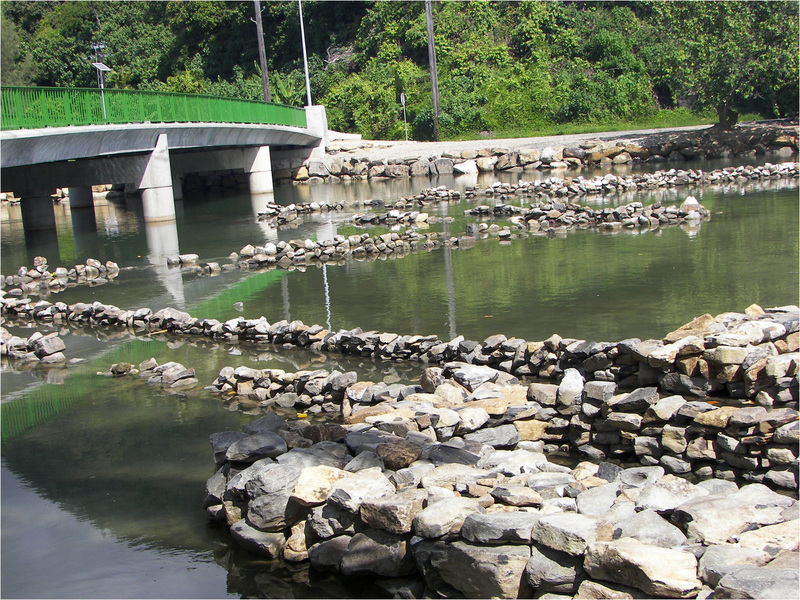 A series of fish traps set up near the bridge which connects the two islands of Huahine. 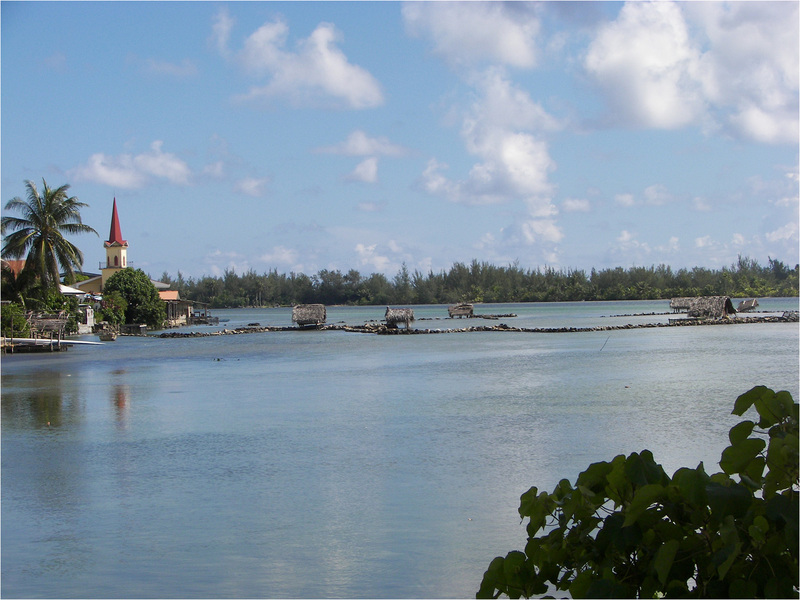 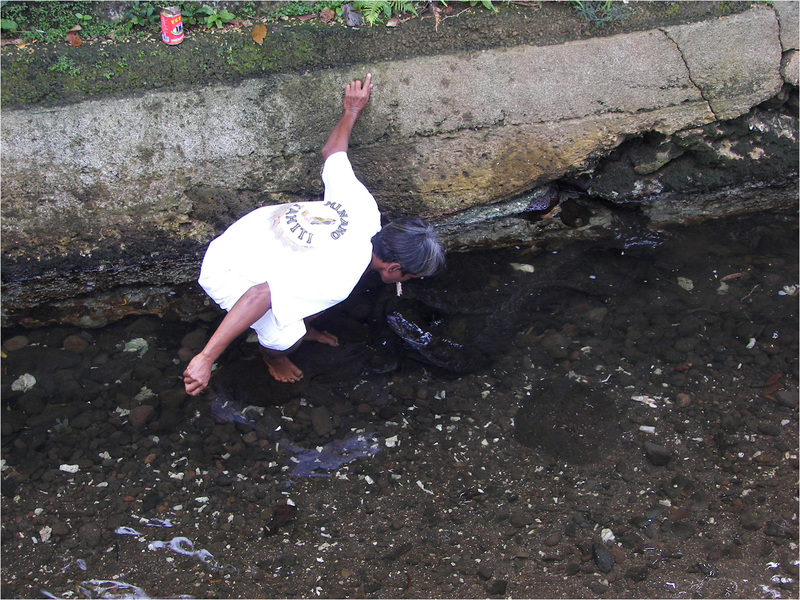 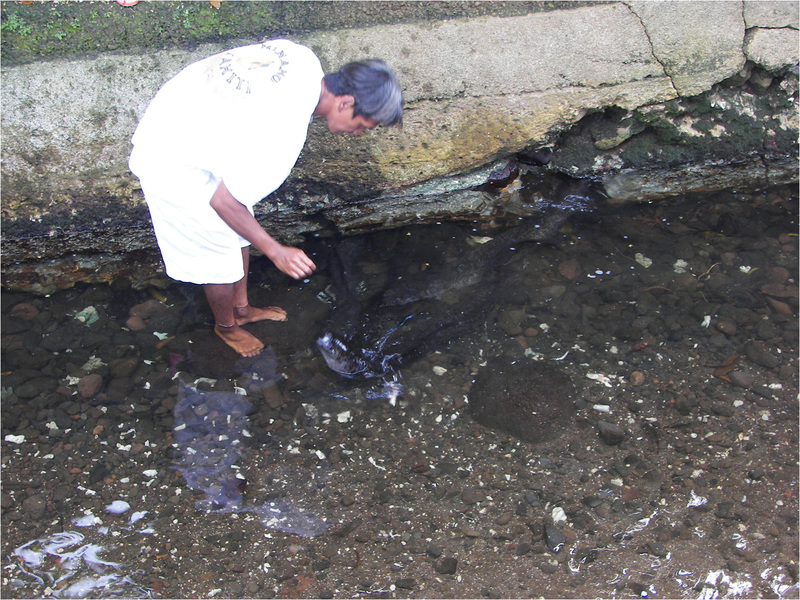 As much as 400 fish are caught in a single day in these traps. 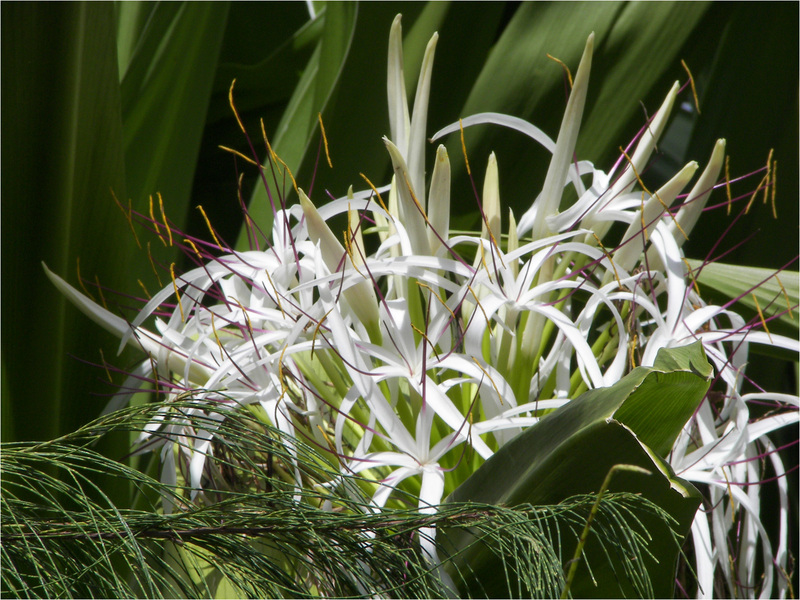 Not sure what these are called, but they made for a good picture. 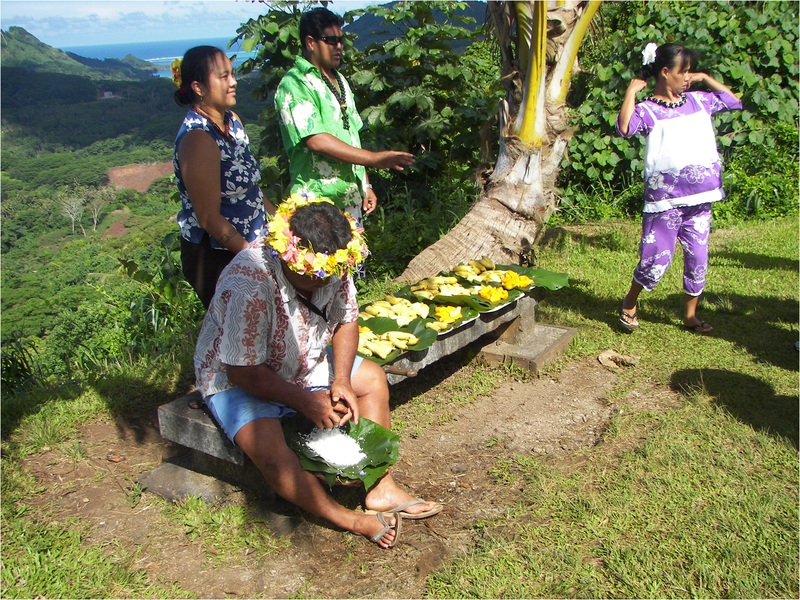 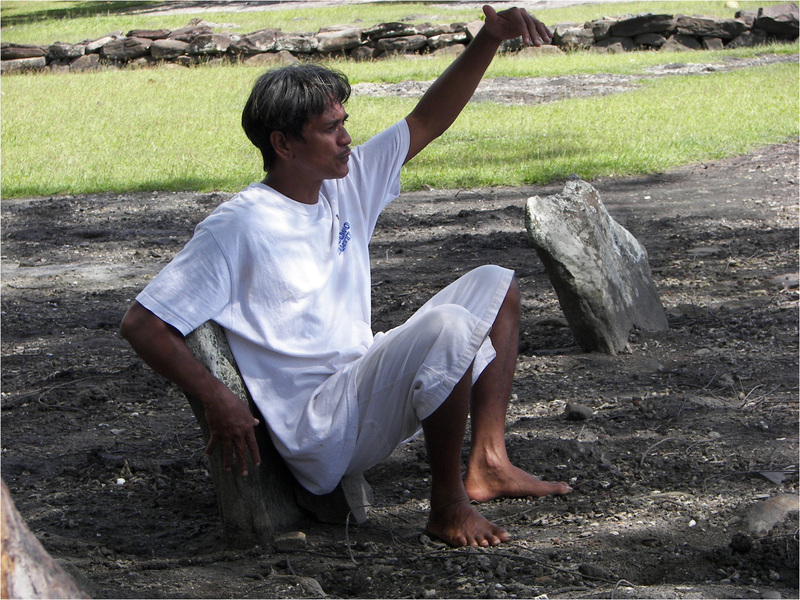 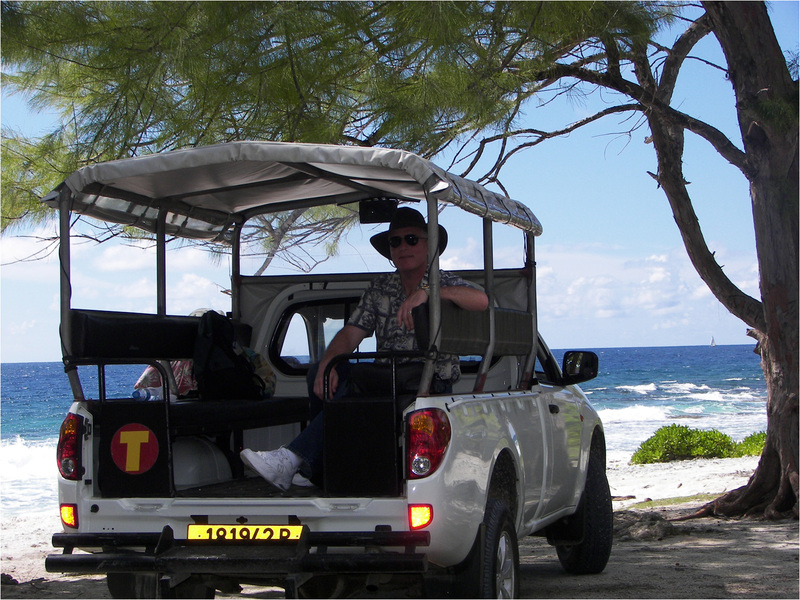 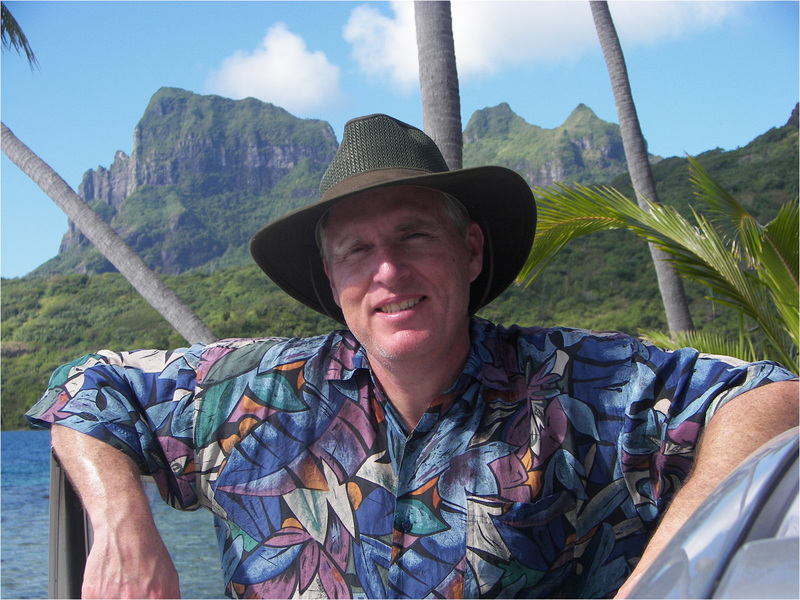 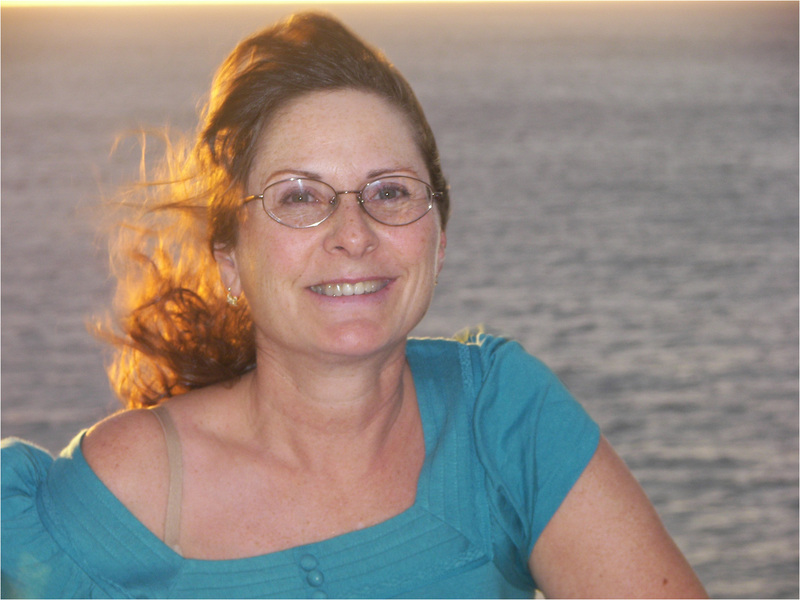 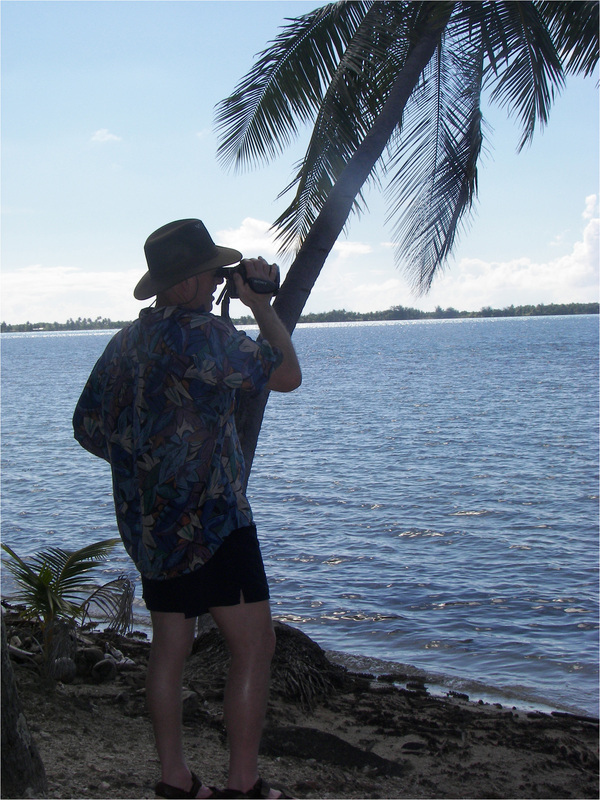 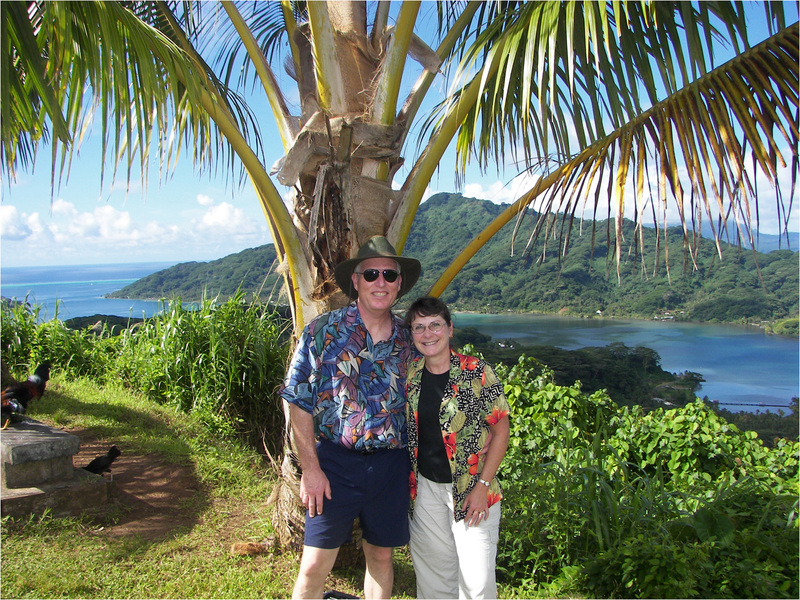 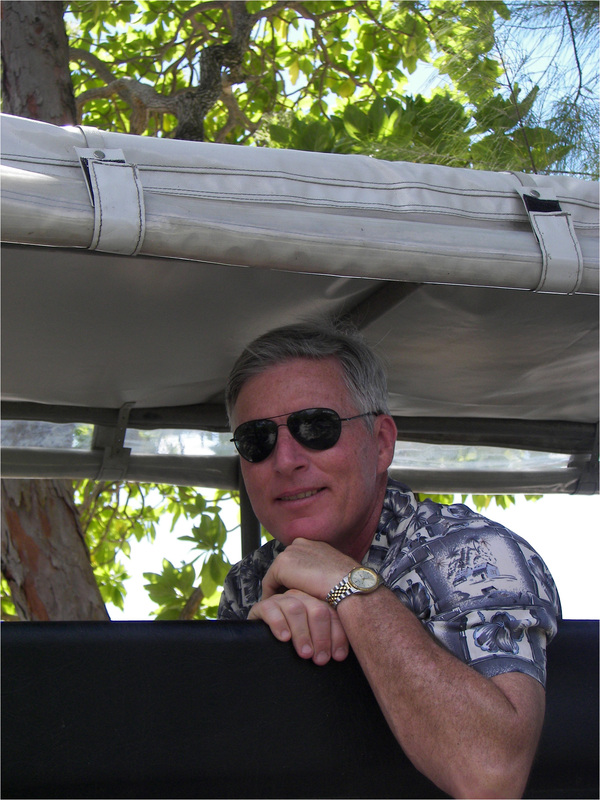 Taking a break at the beach on our tour of Huahine. 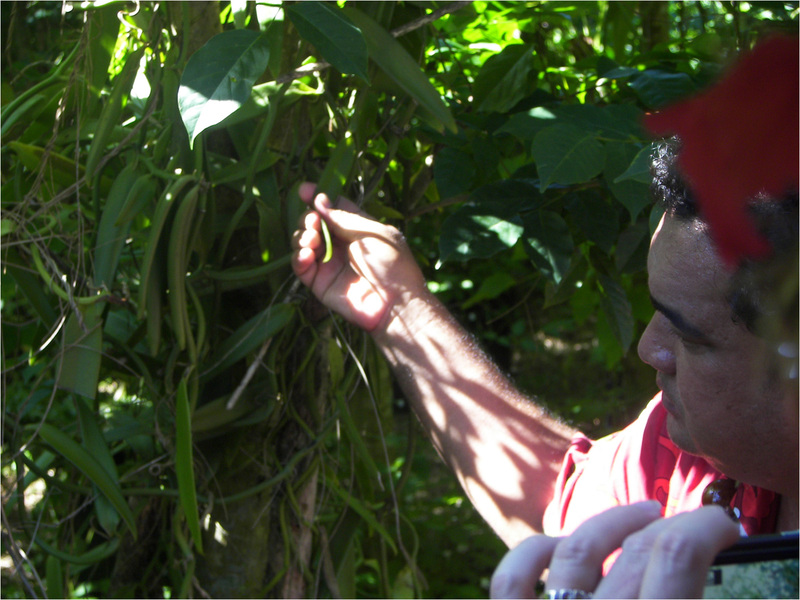 Receiving instruction about the Marae's which were sacred meeting areas and included both animal and human sacrifices. 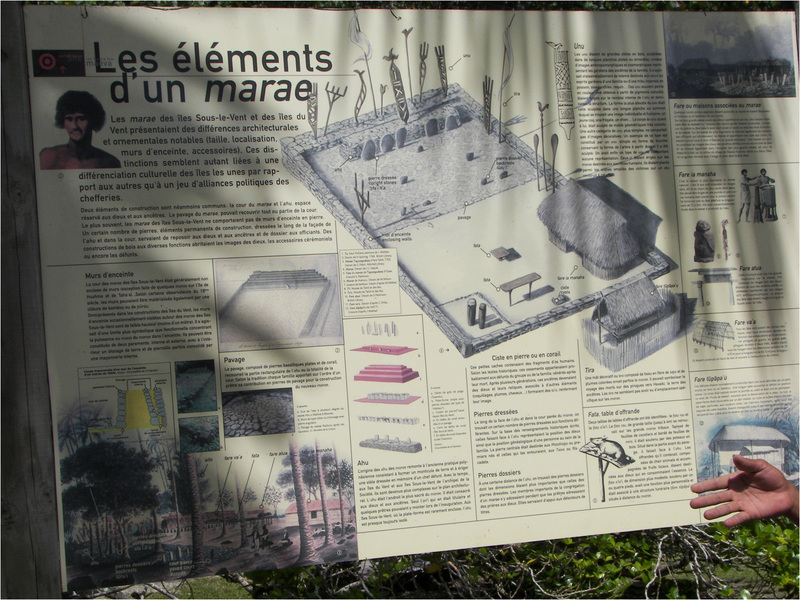 Receiving instruction about the Marae's which were sacred meeting areas and included both animal and human sacrifices. 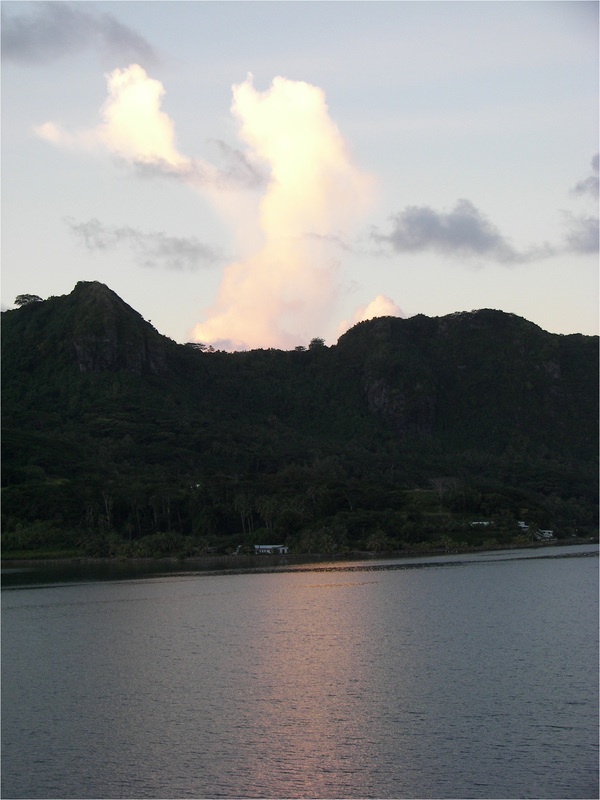 The man on the drawing resembling George Washington is Captain Cook who was killed on the Big Island Hawaii and was supposedly cooked himself. 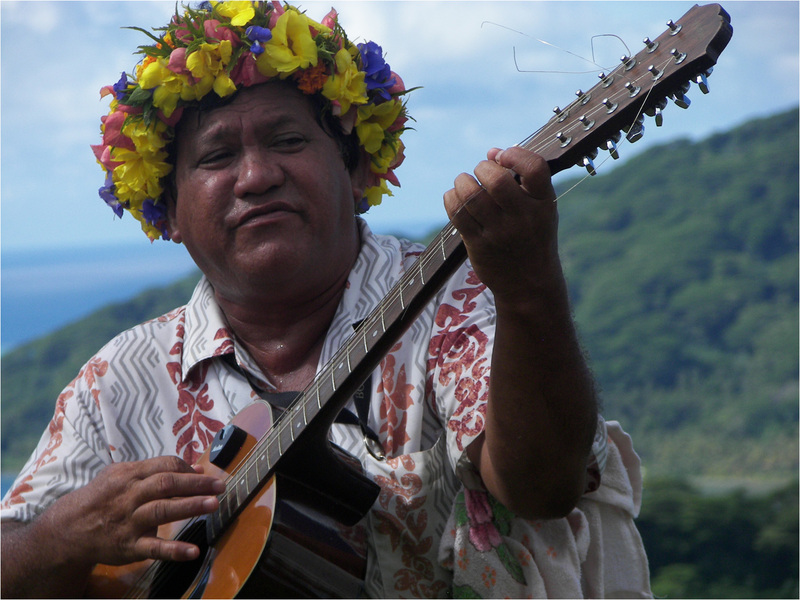 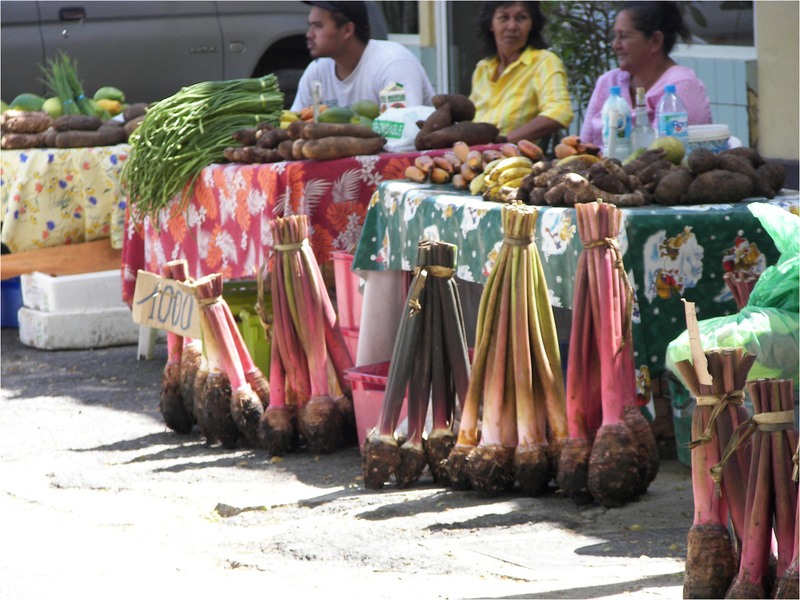 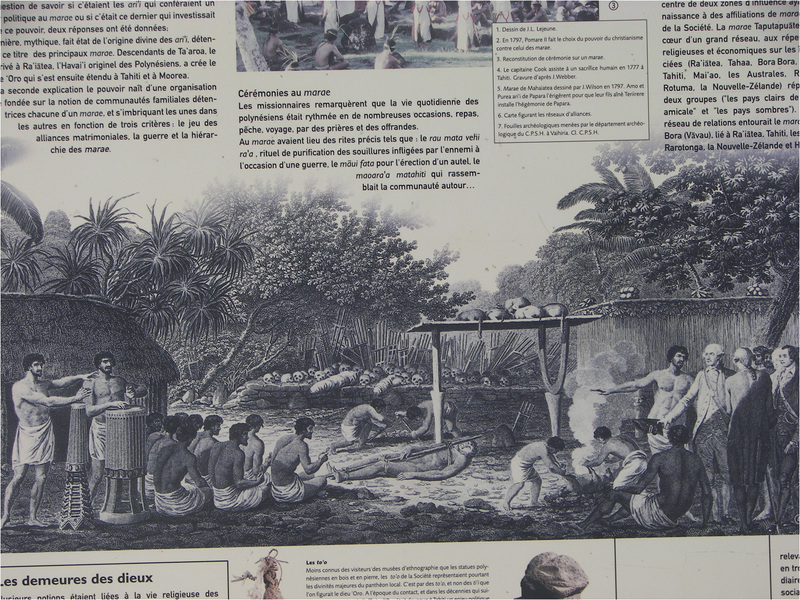 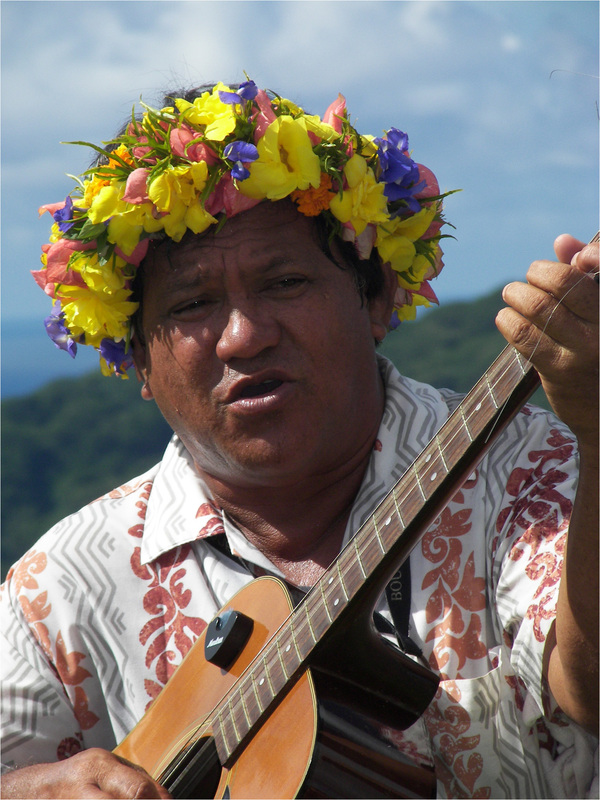 Market in Parea on Huahine Iti. 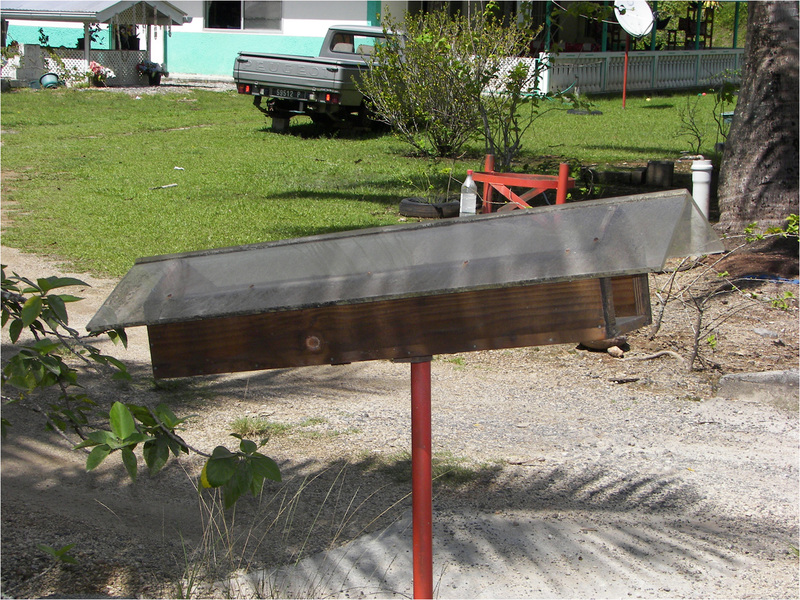 Bread boxes located in front of homes. 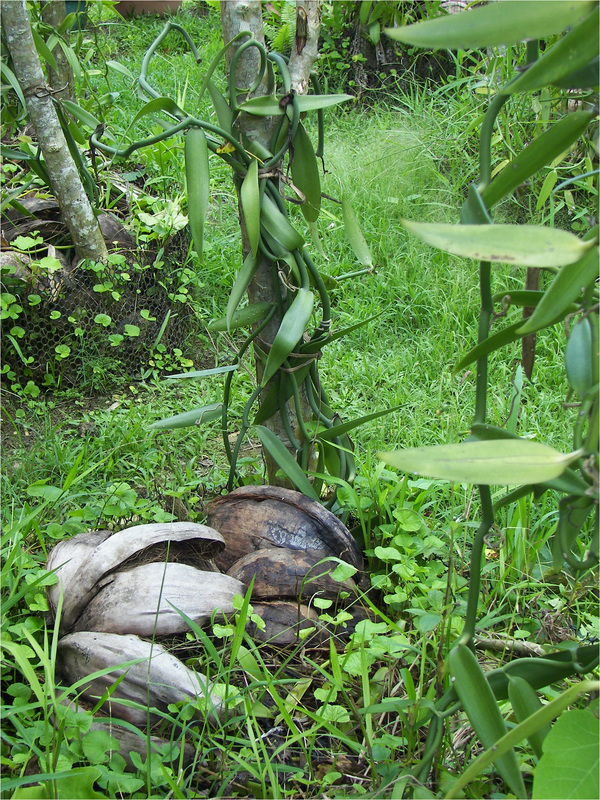 Local birds have also learned the delivery times. 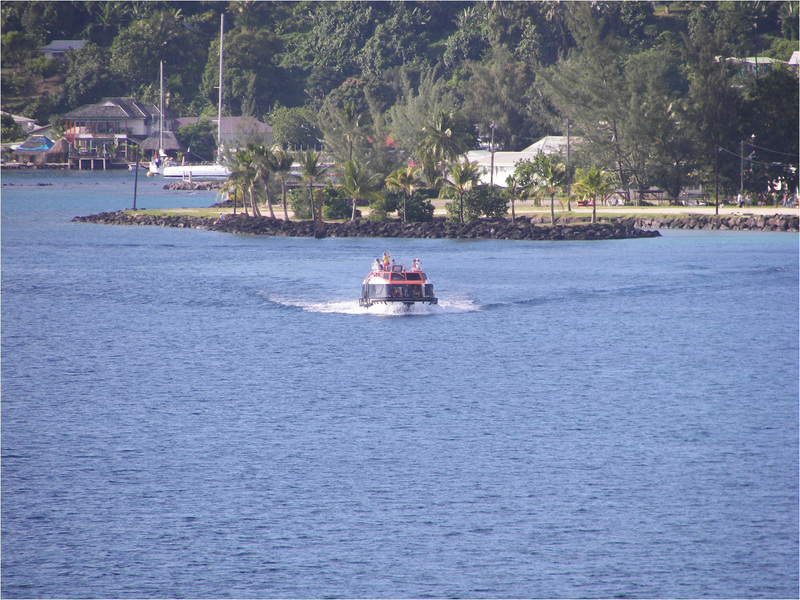 Some local kids swimming from the dock as we waited for our tender back to the ship. 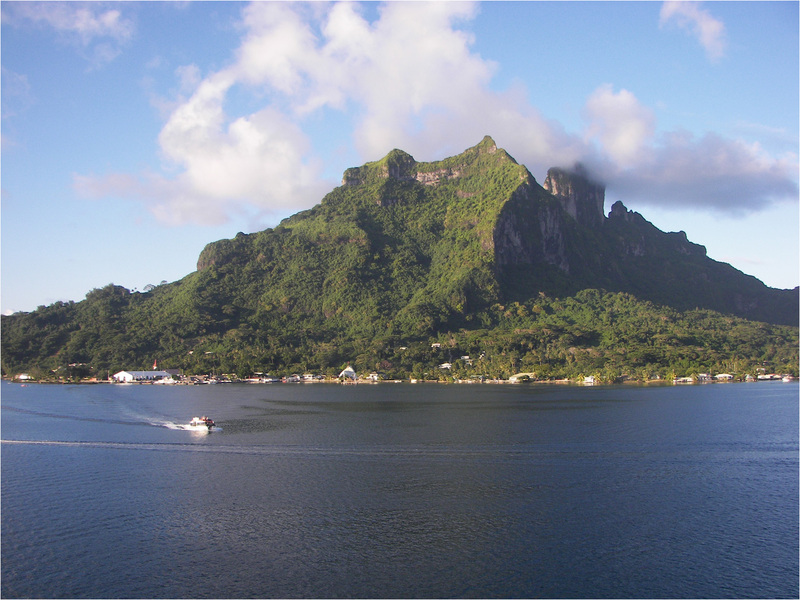 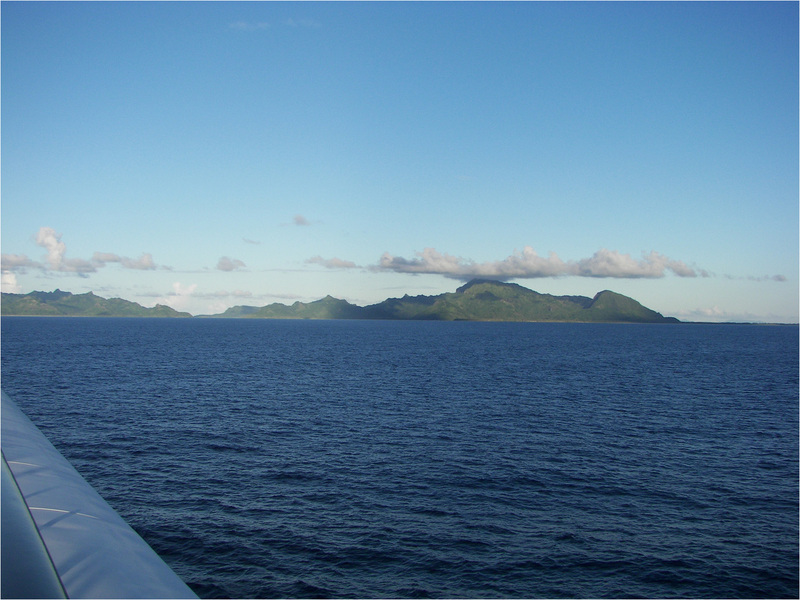 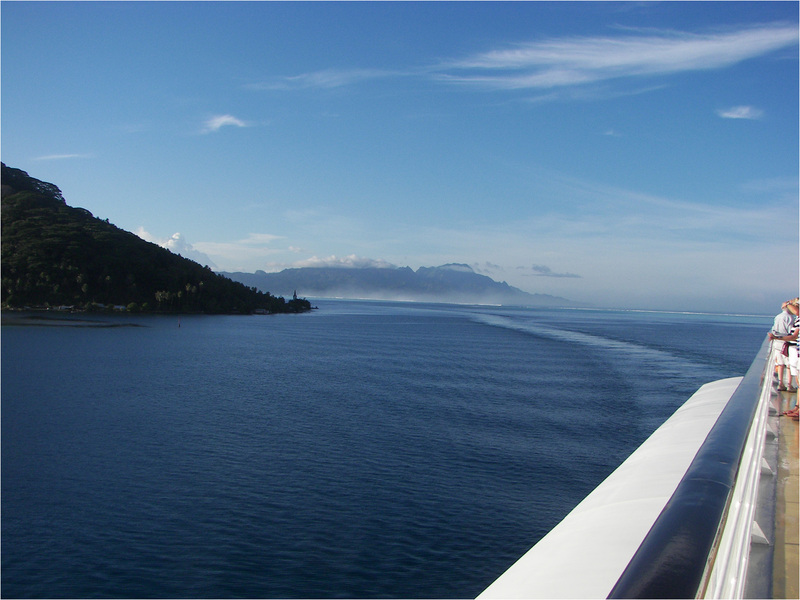 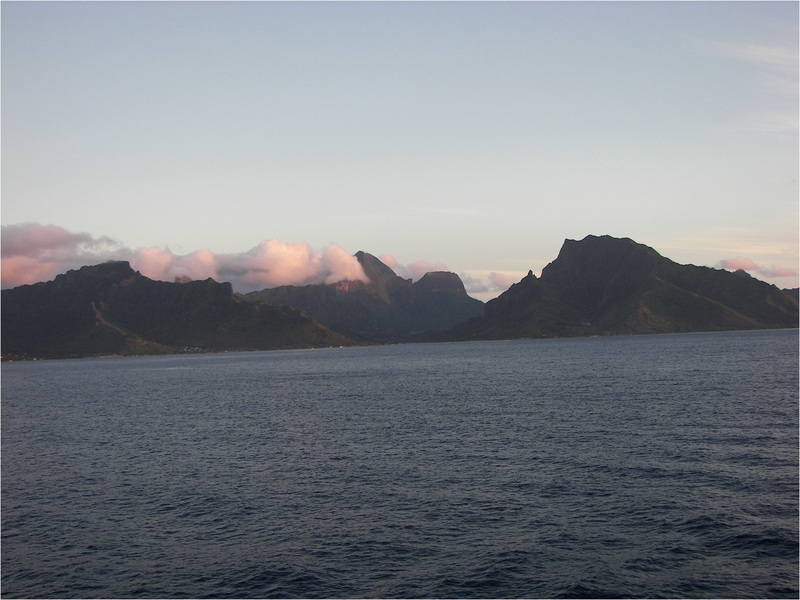 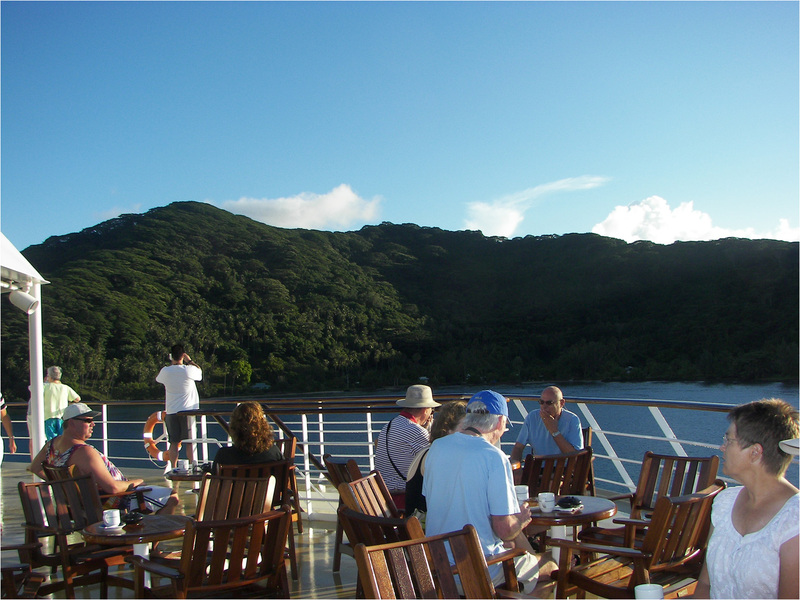 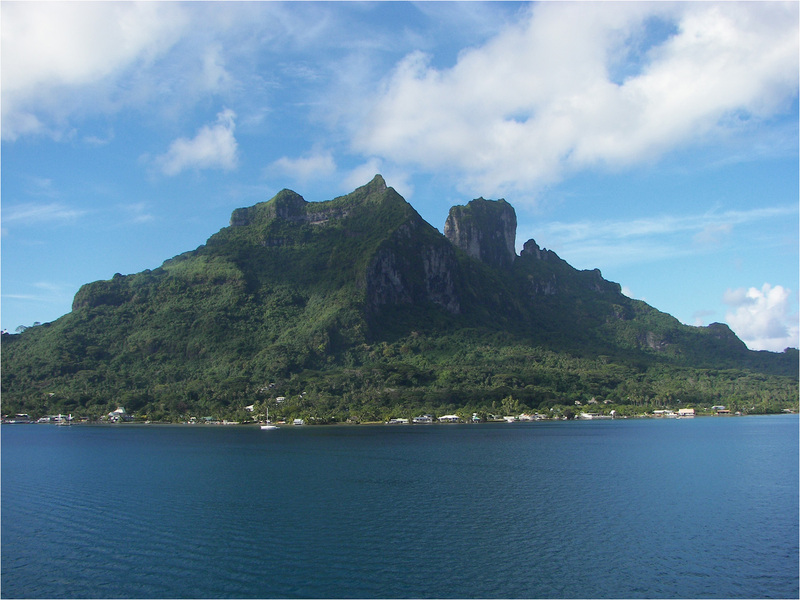 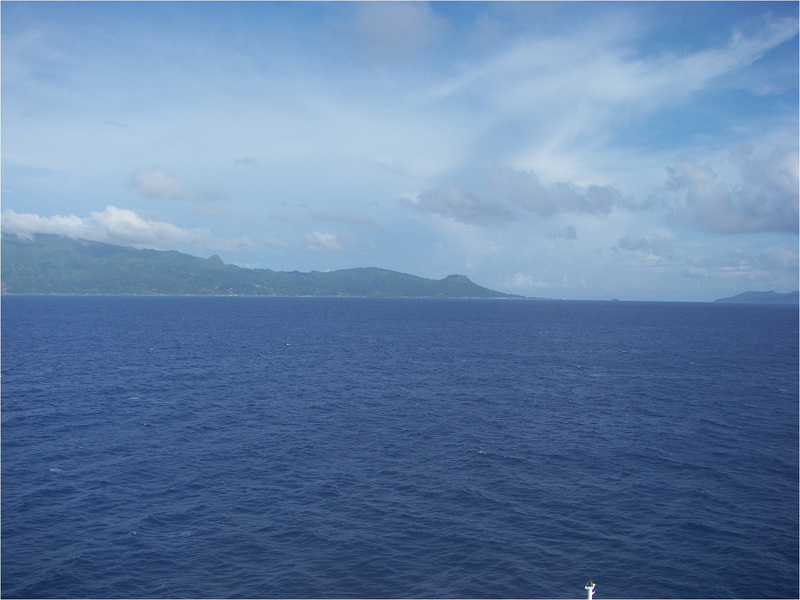 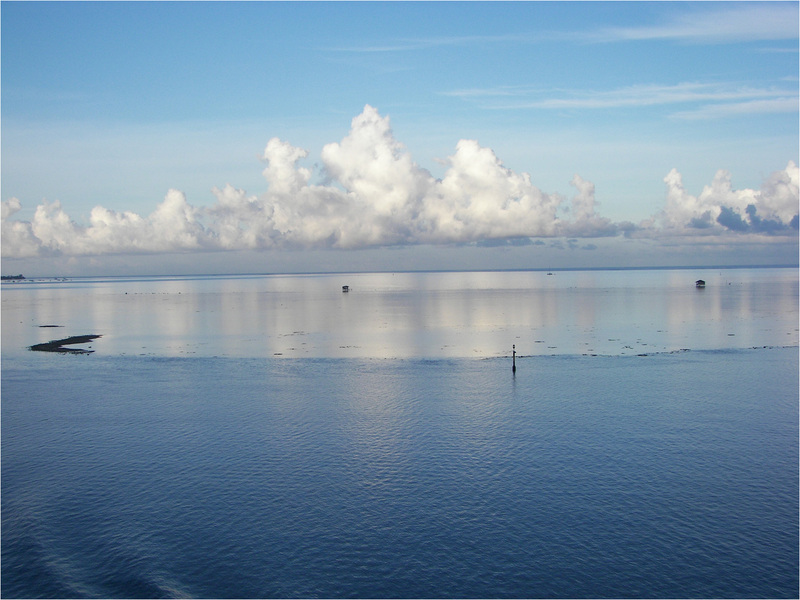 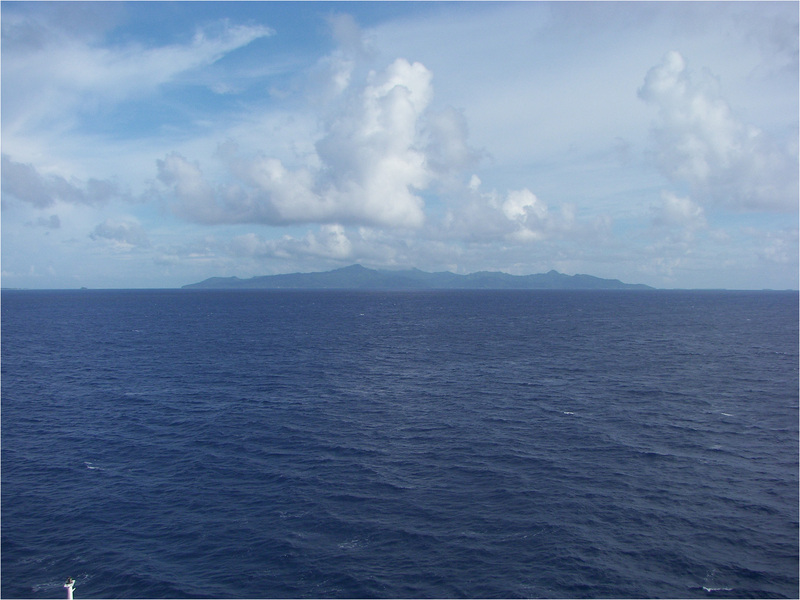 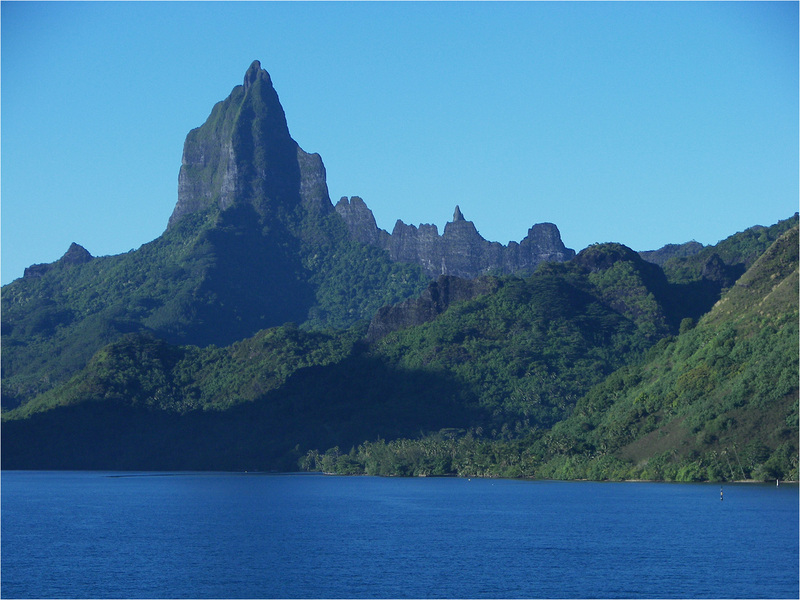 View of Moorea and lagoon from ship just before 8AM Saturday. 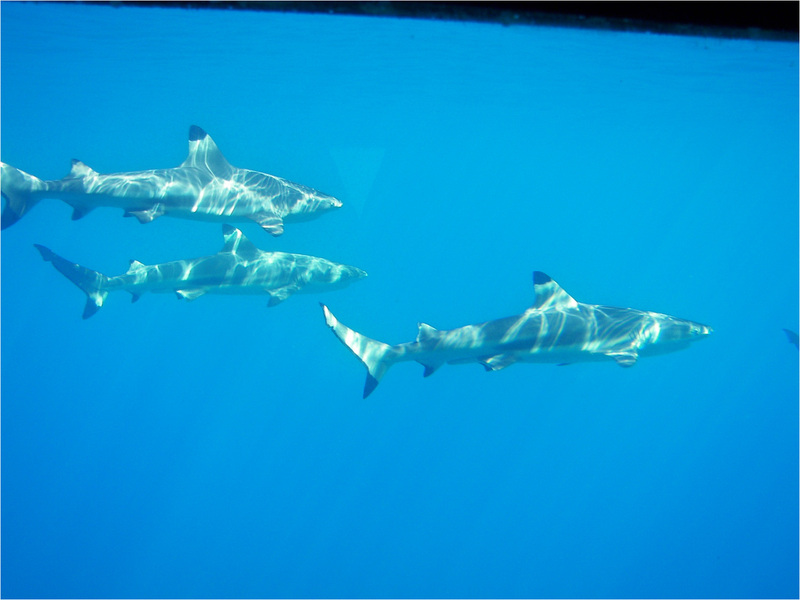 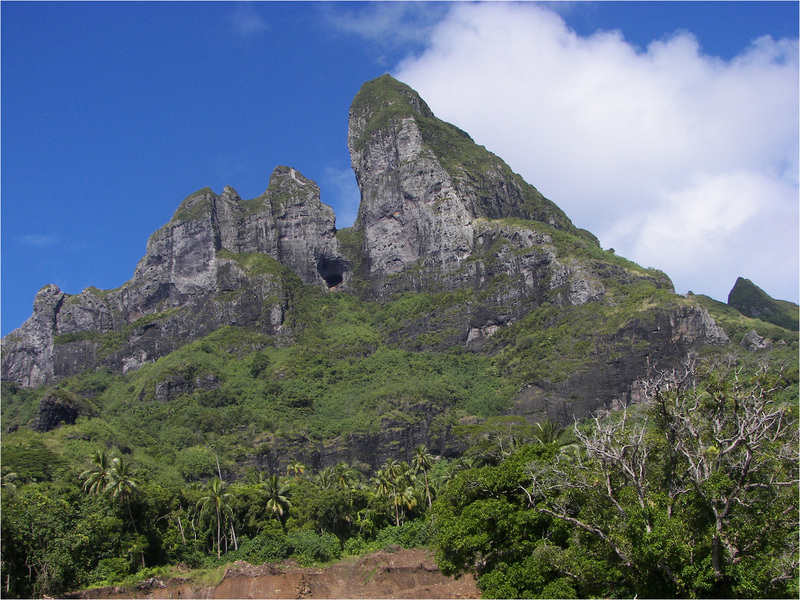 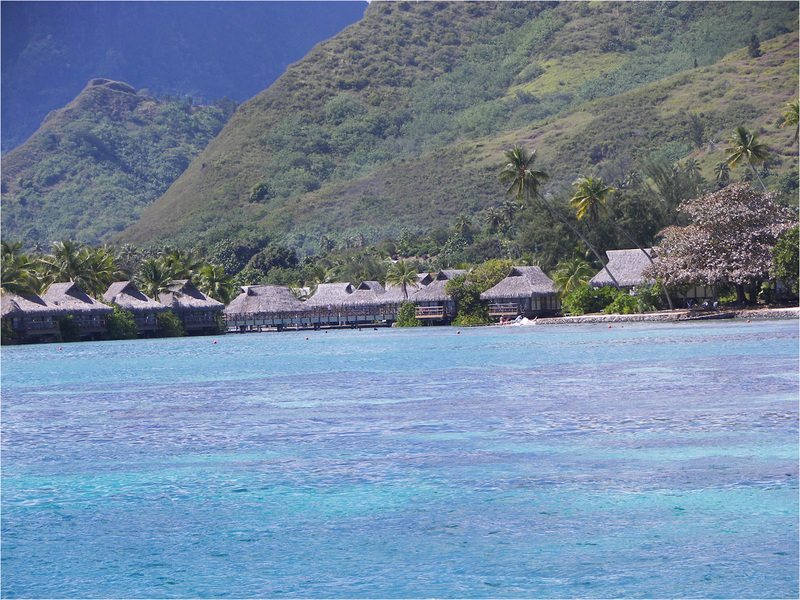 Several views from our glass bottom boat excursion in the lagoon of Moorea. 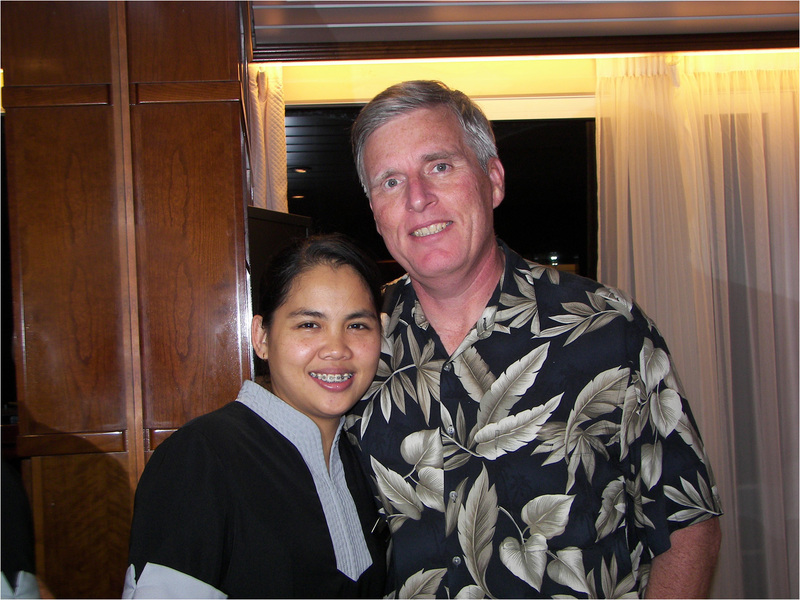 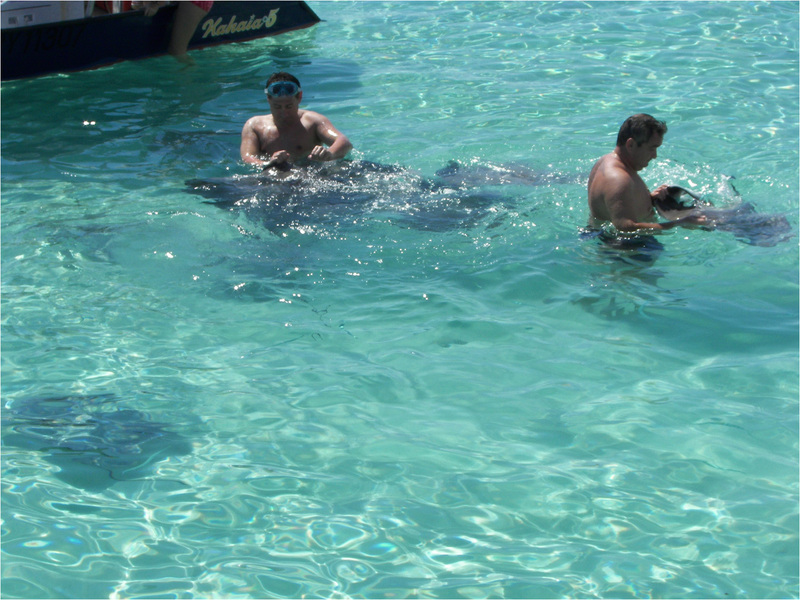 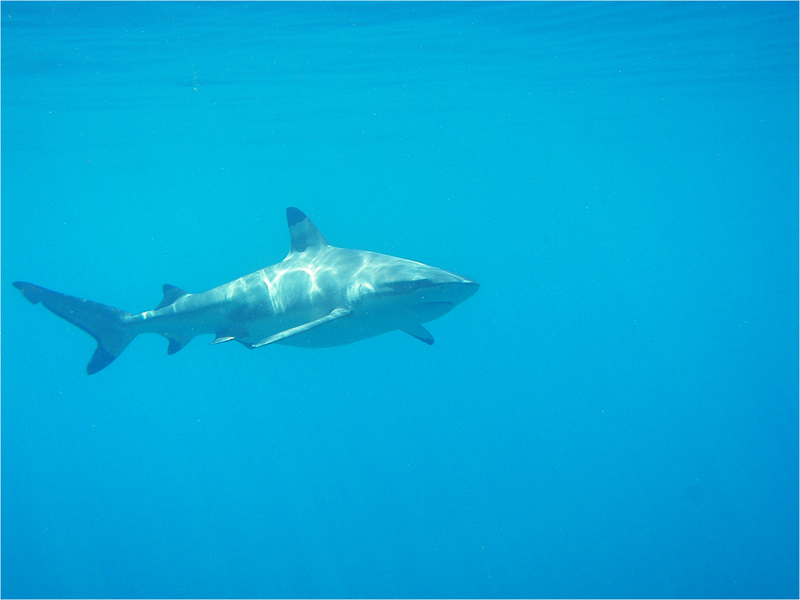 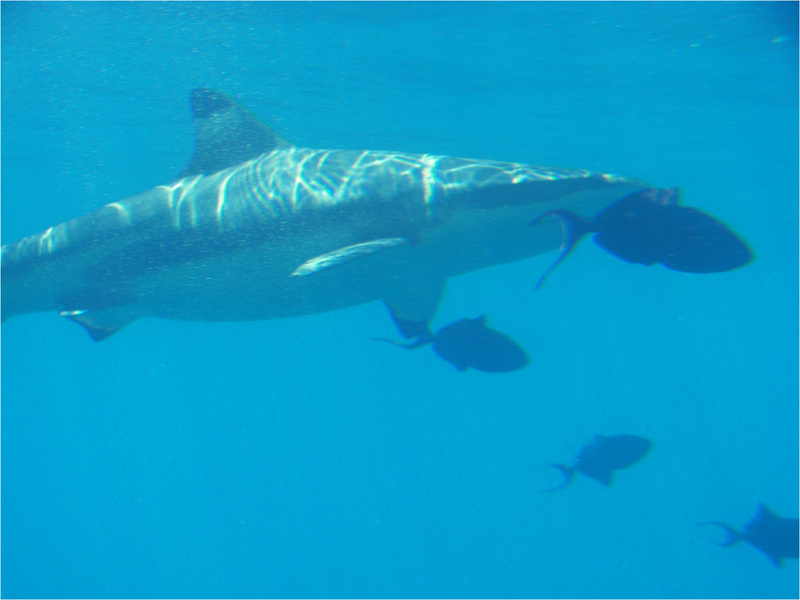 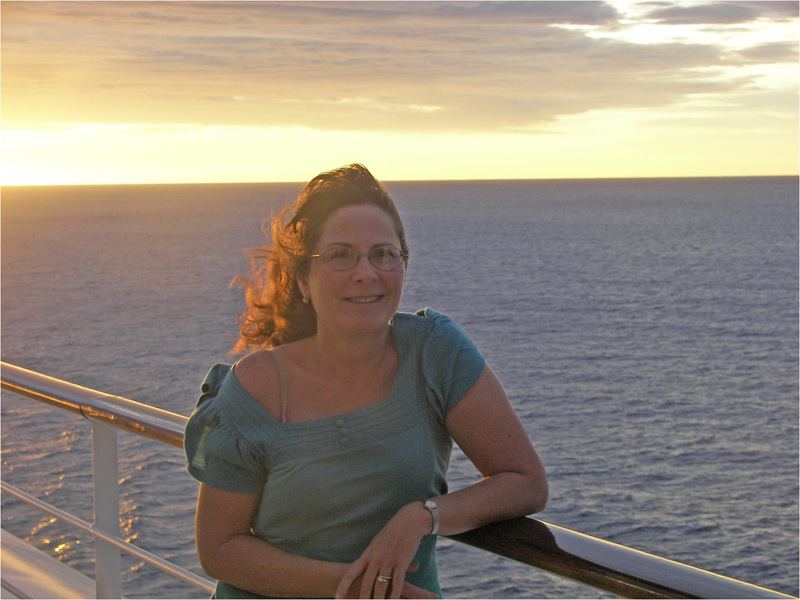 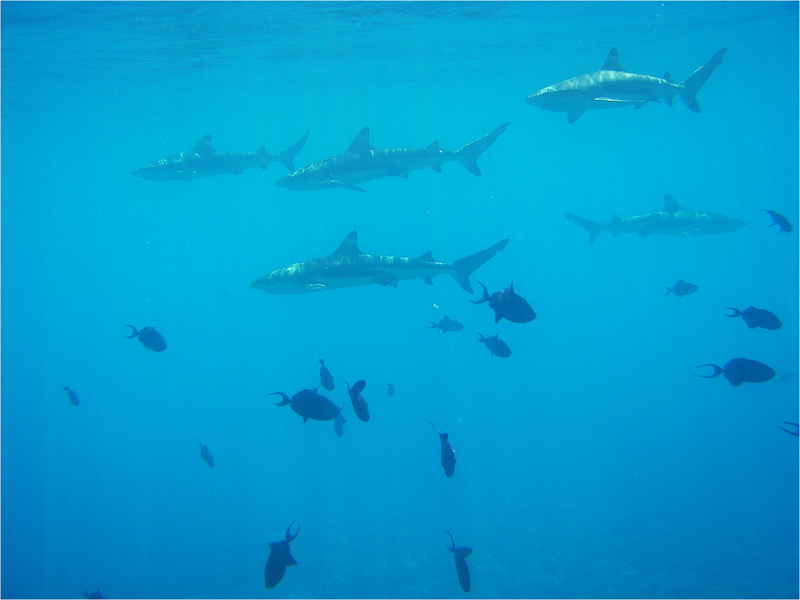 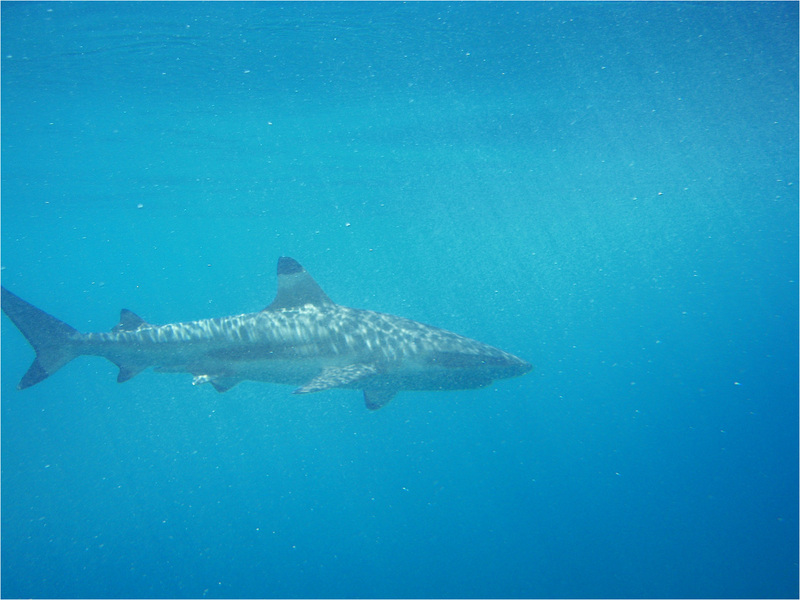 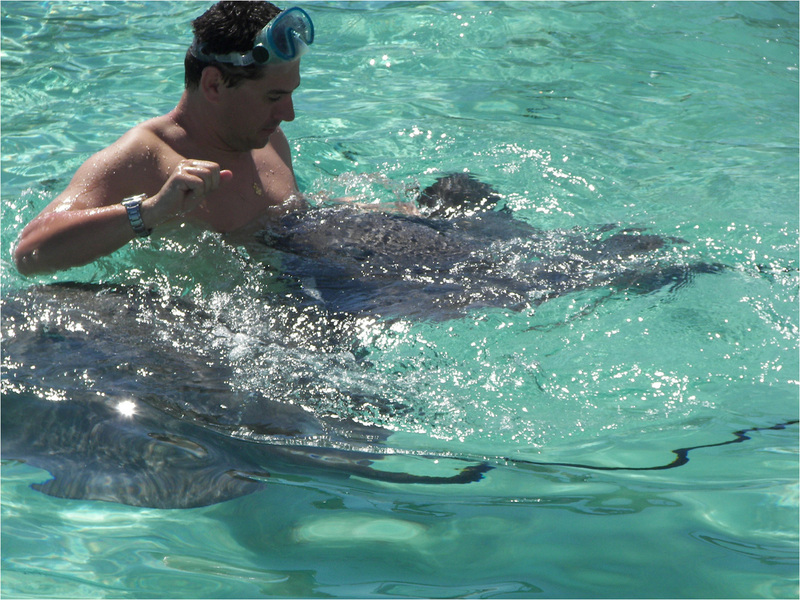 We later had a chance to swim with the black tipped reef sharks and sting rays. 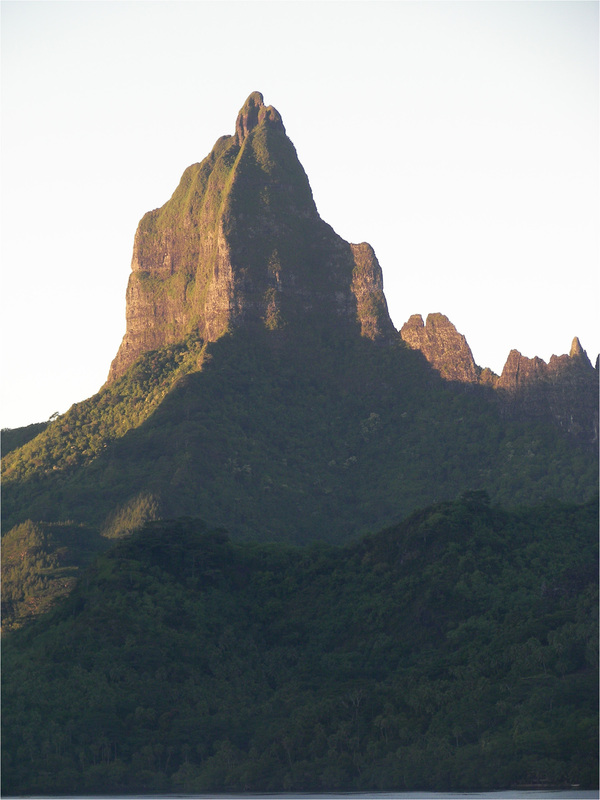 Several views from our glass bottom boat excursion in the lagoon of Moorea. 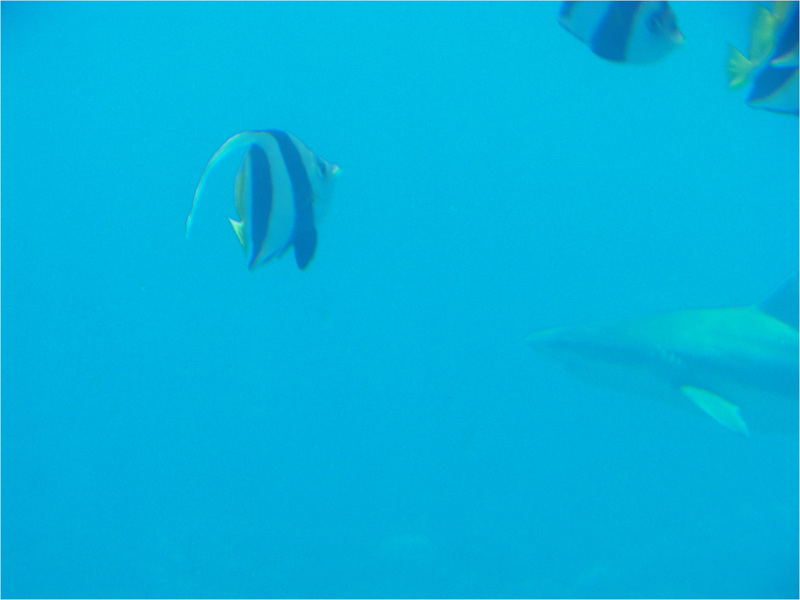 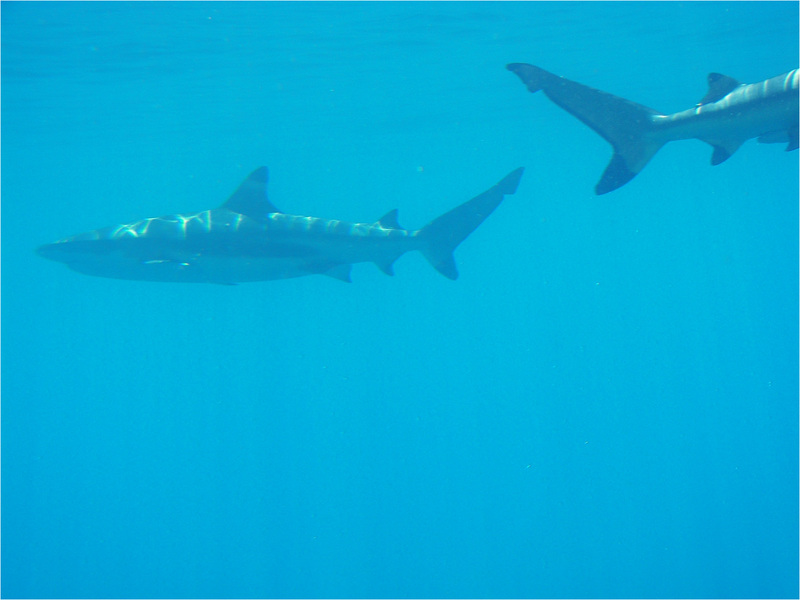 We later had a chance to swim with the black tipped reef sharks and stingrays. 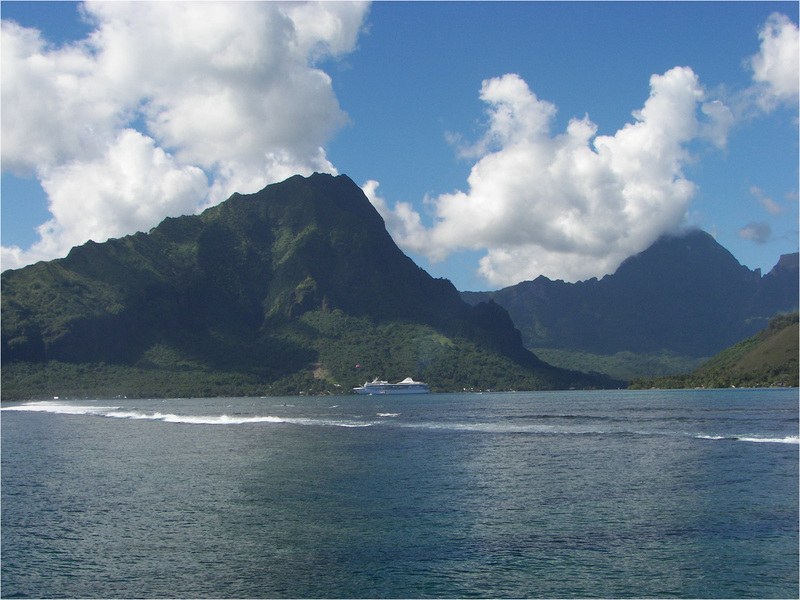 Looking back at the island of Moorea and lagoon from the ocean side of the reef. 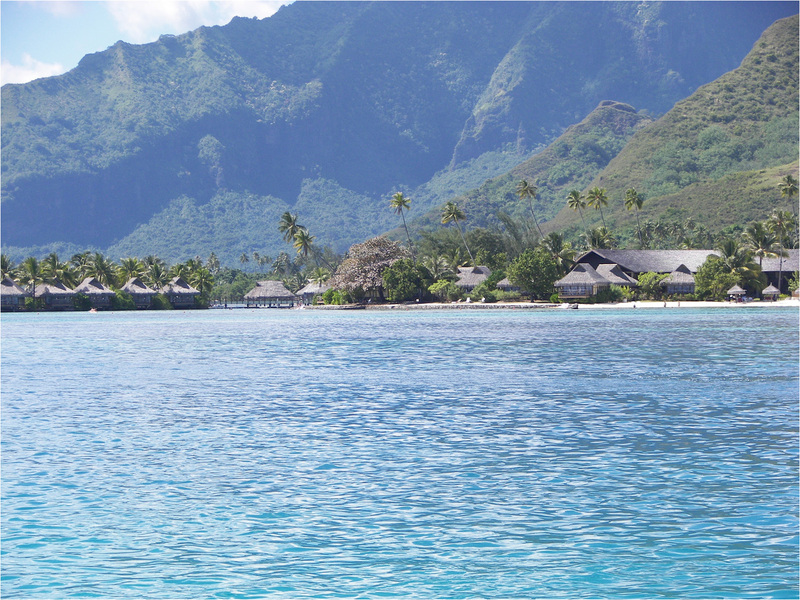 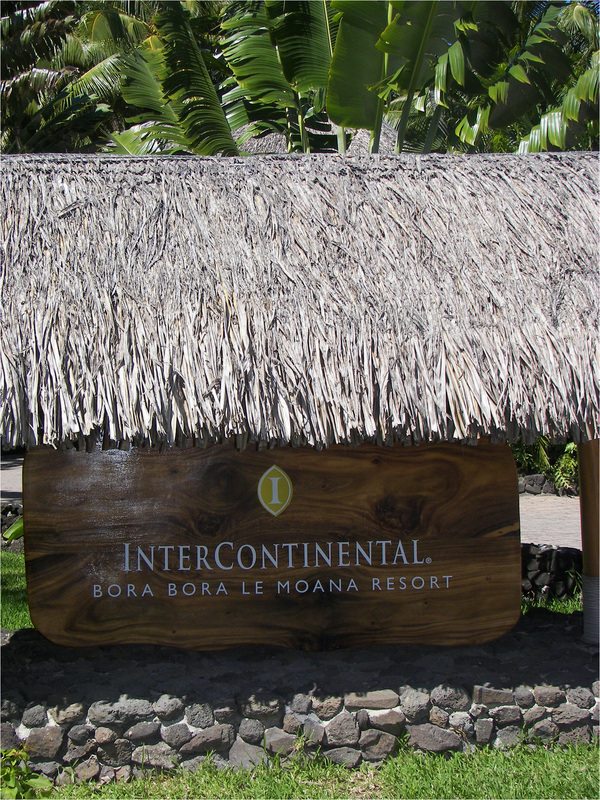 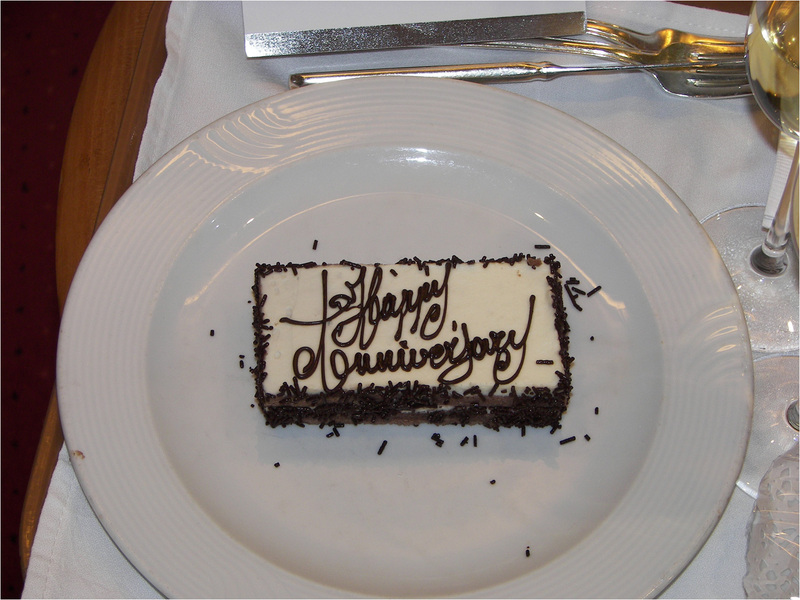 This is the Intercontinental Moorea resort where we stayed 10 years ago. 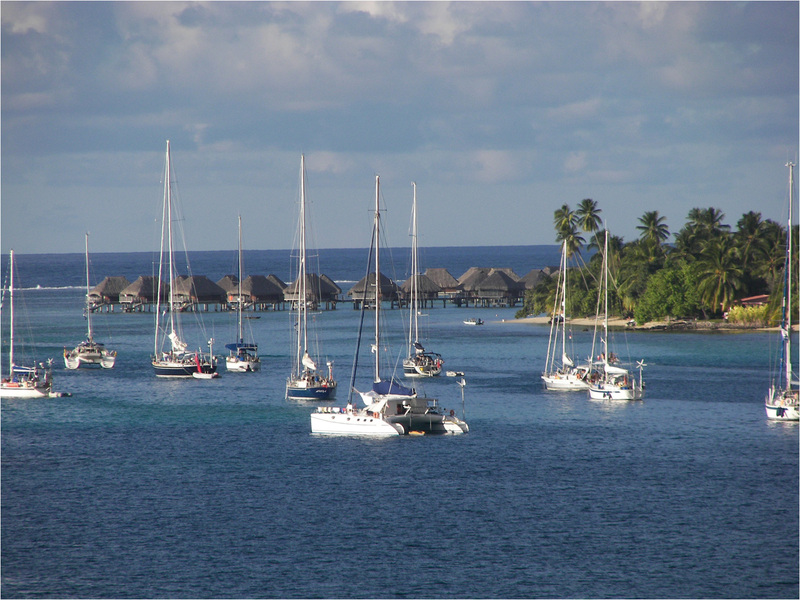 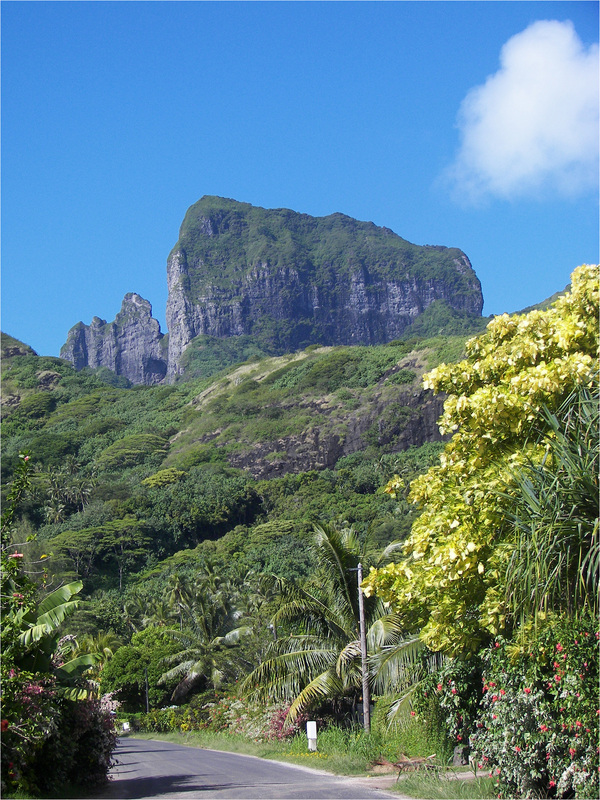 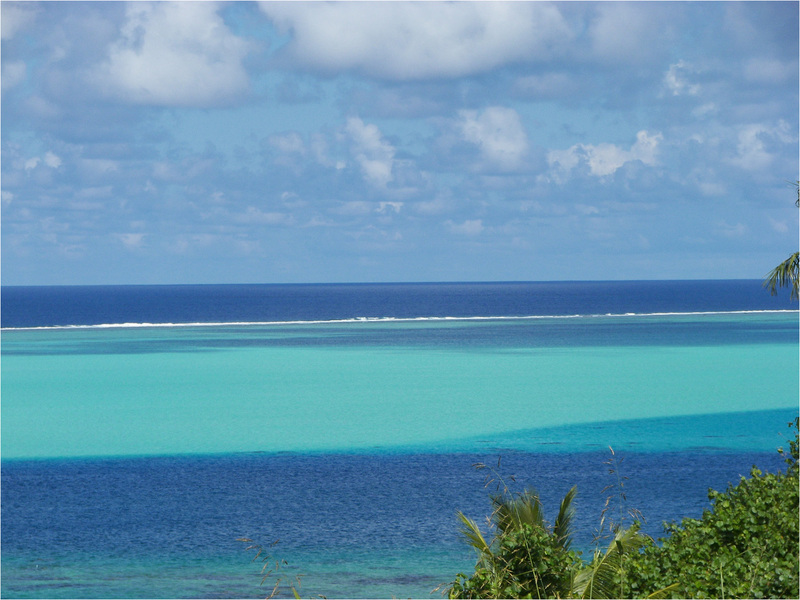 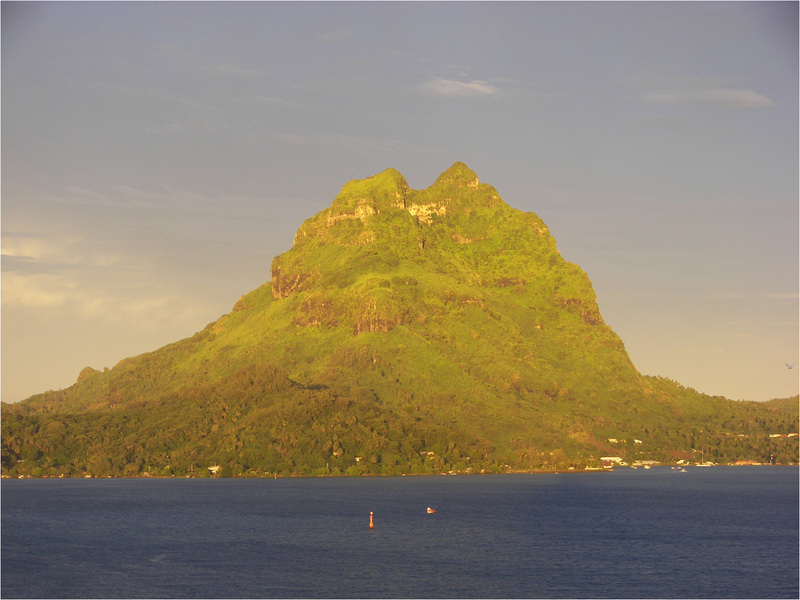 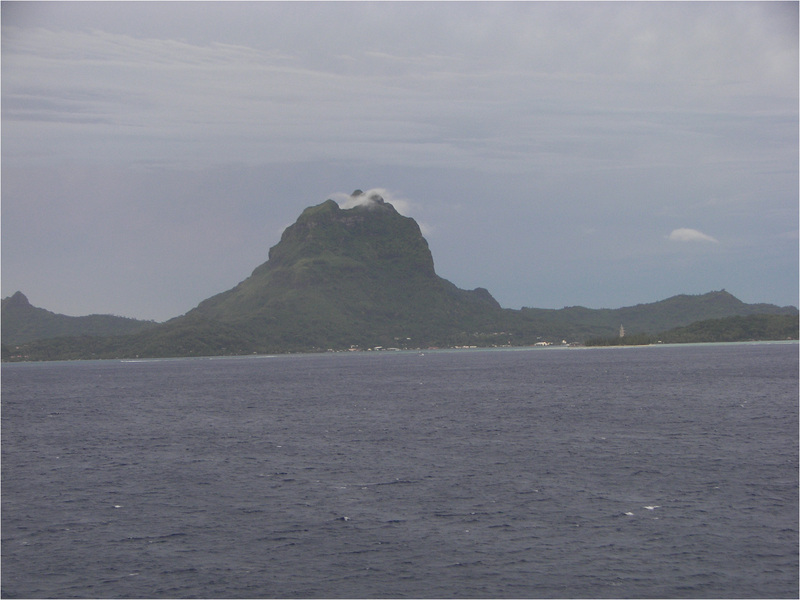 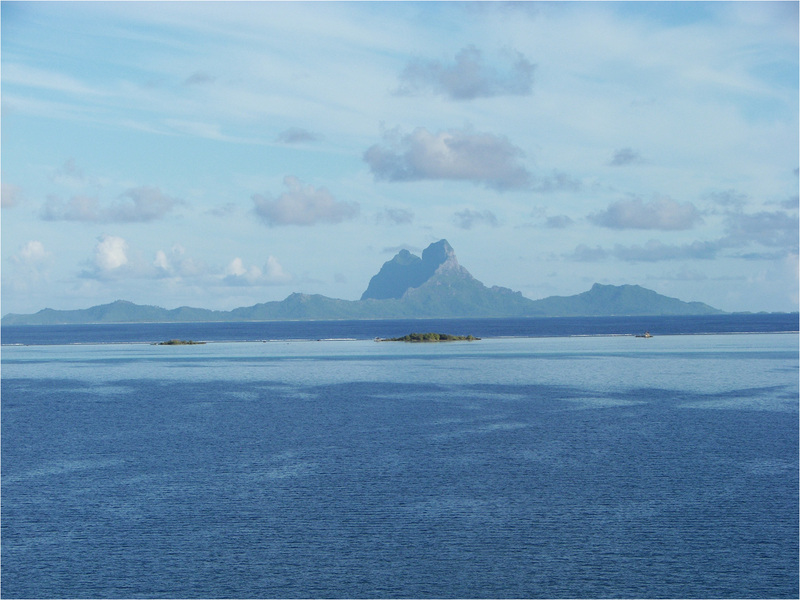 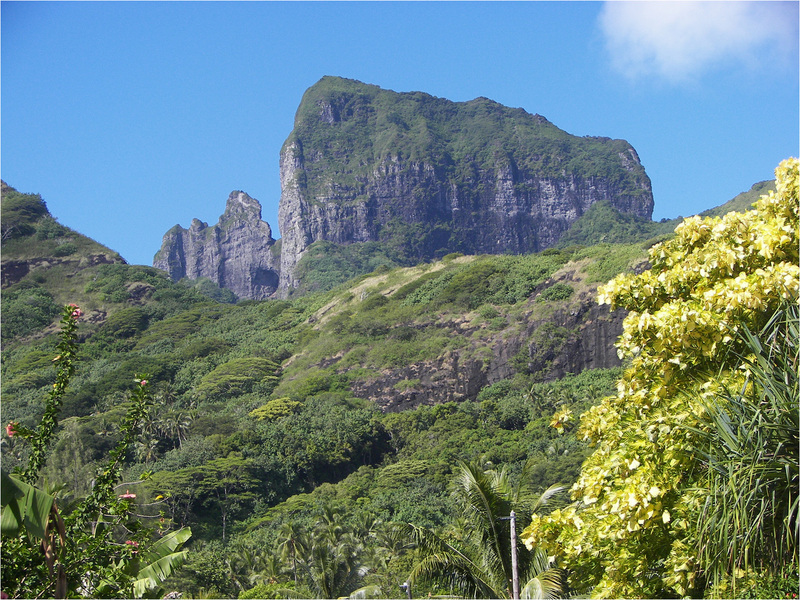 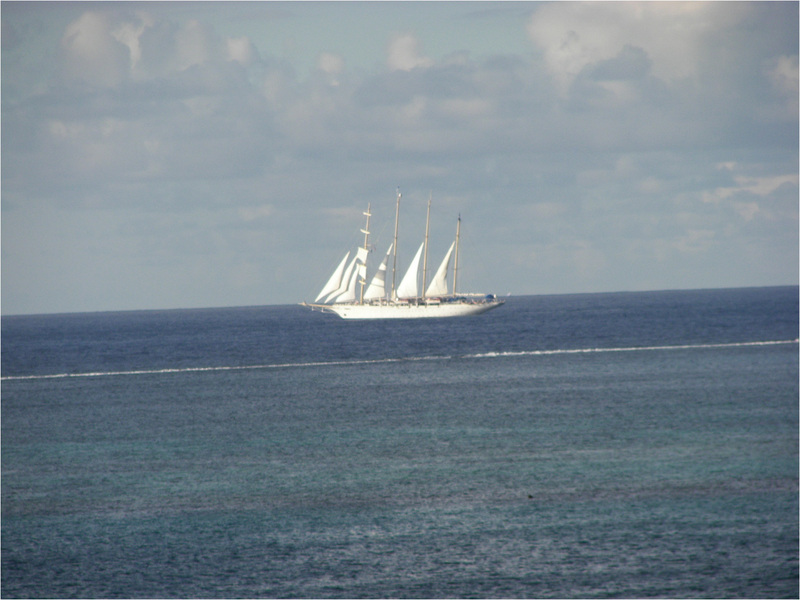 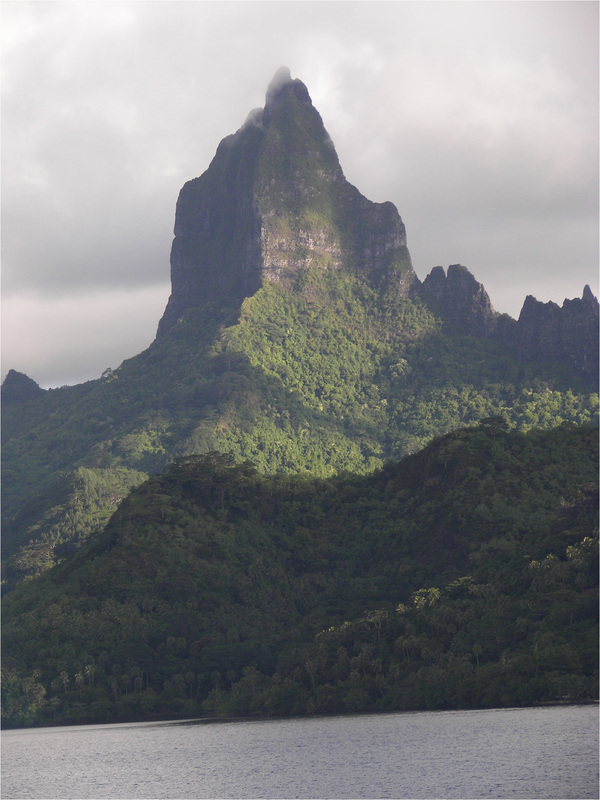 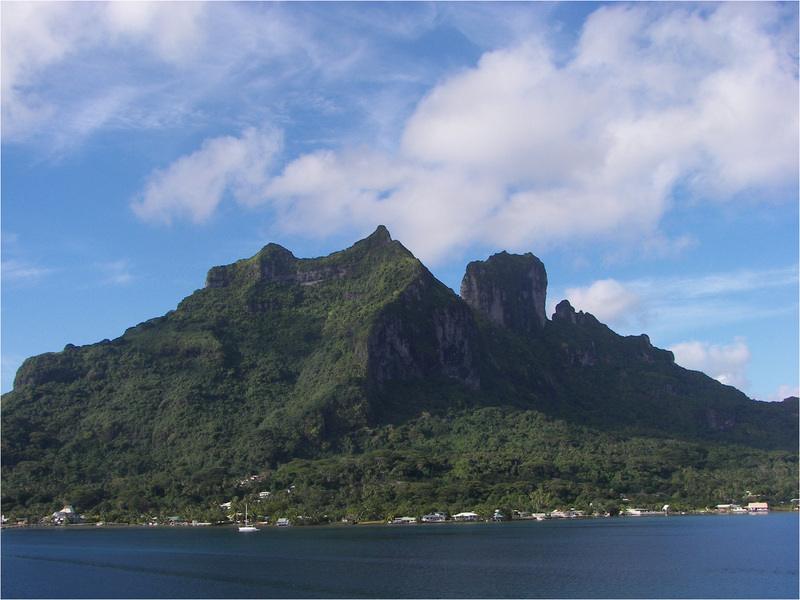 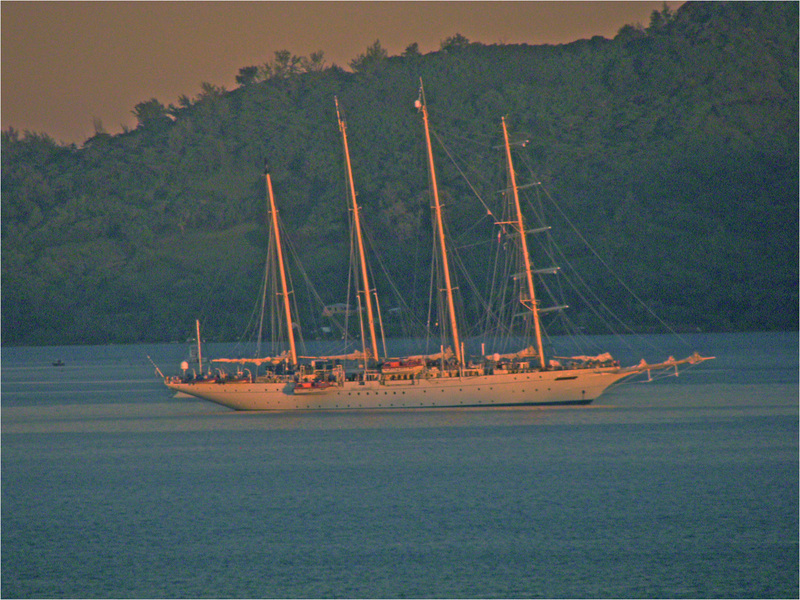 View of the Paul Gaugin anchored in the lagoon at Moorea. 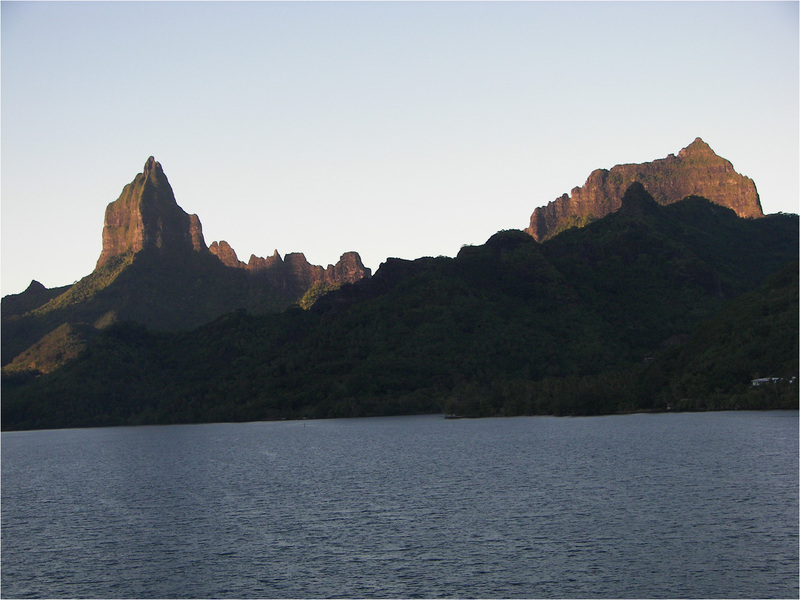 Late Saturday afternoon views of Moorea and lagoon. 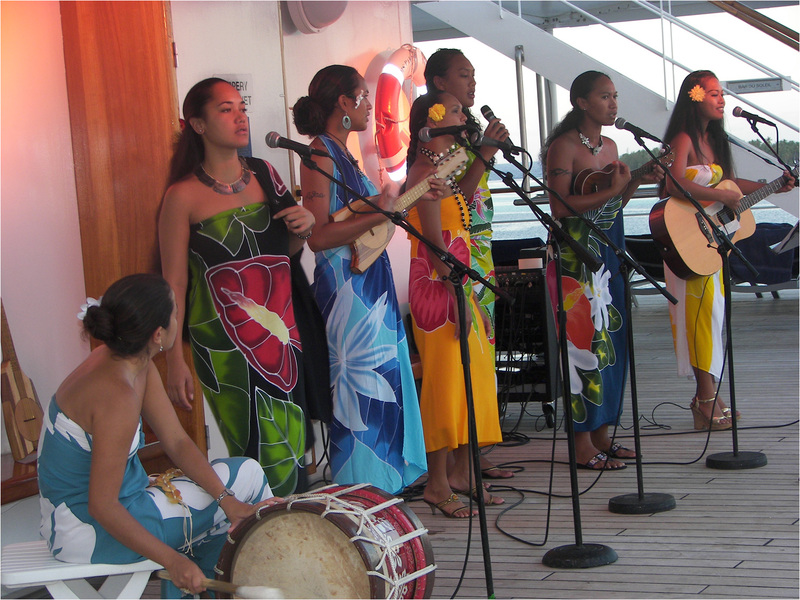 Tahitian show on deck 8 early Saturday evening. 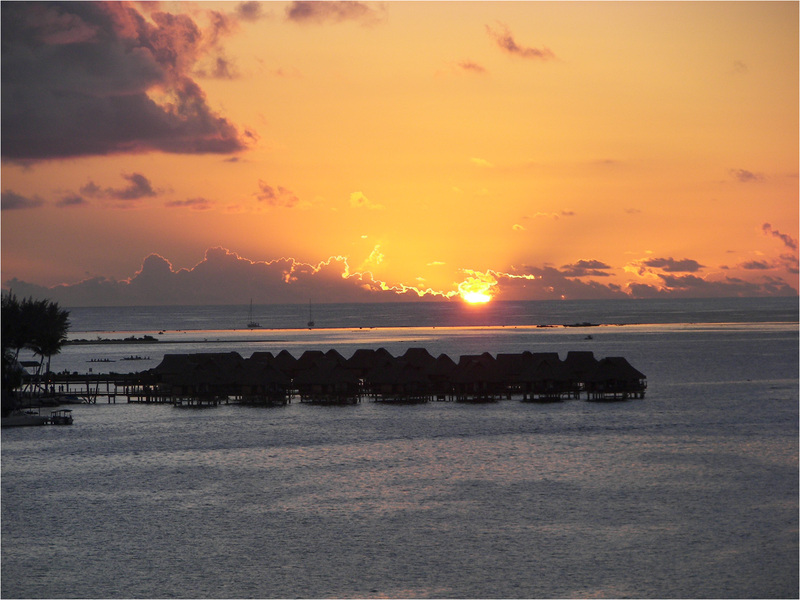 Final set of pictures at sunset taken from the lounge area at the Radisson Resort in Tahiti just prior to our departure to the airport.